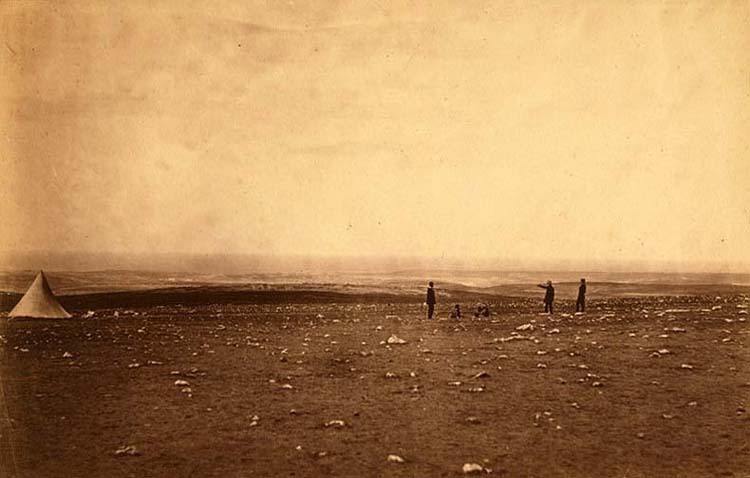 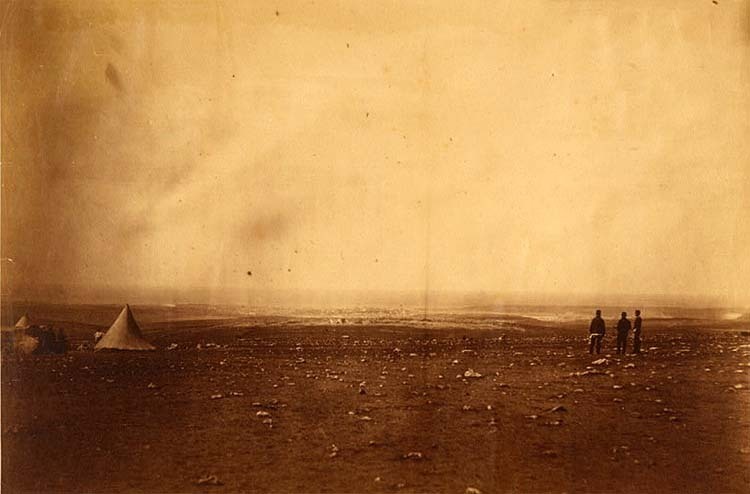 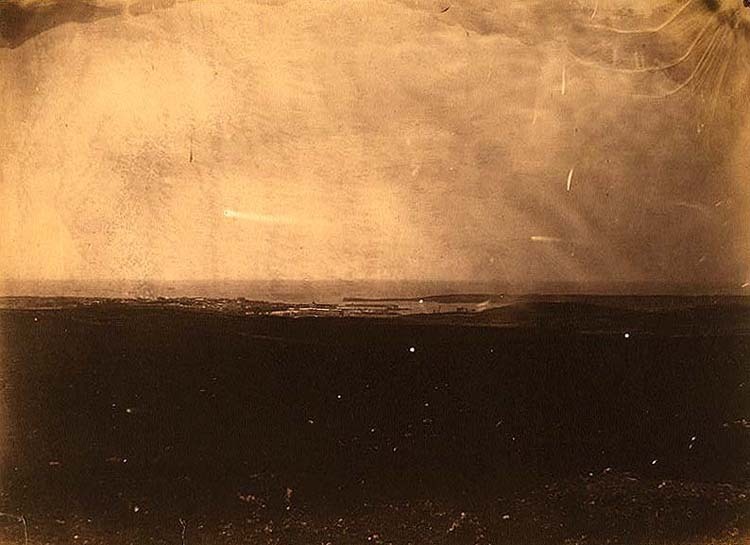 Roger Fenton, The valley of the shadow of death. 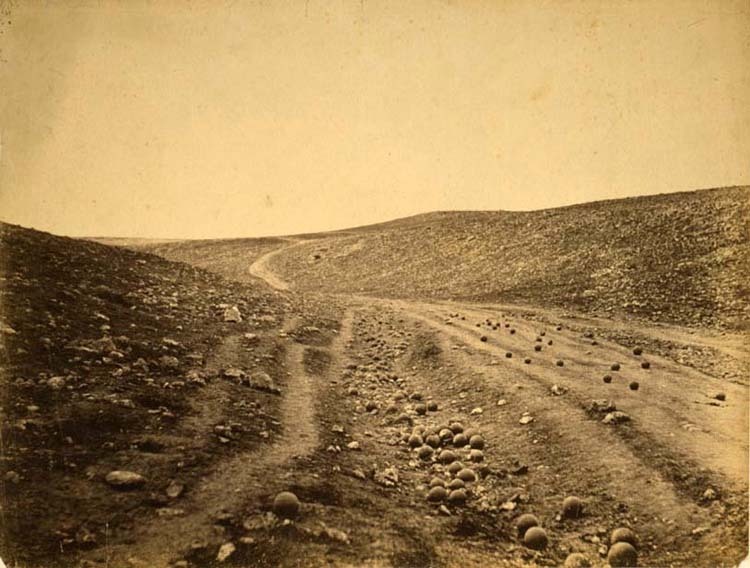 Dirt road in ravine scattered with cannonballs. 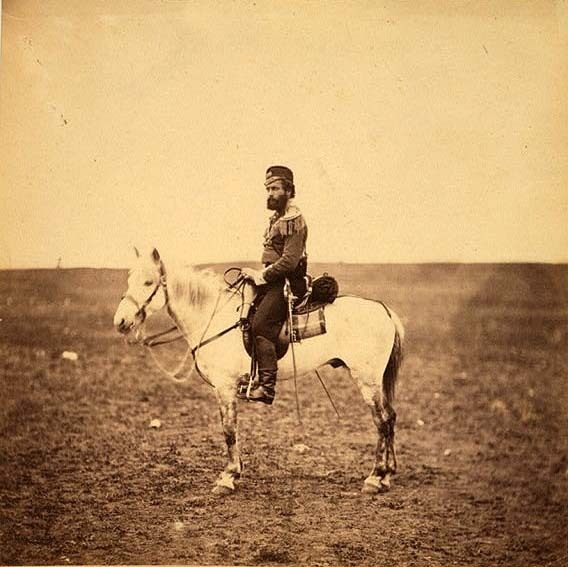 LC-USZC4-9217. 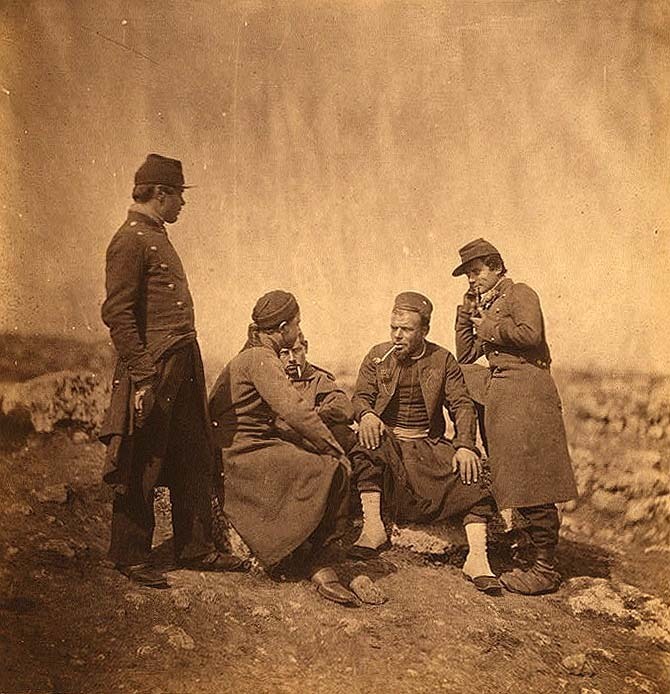 One of the most famous photos of the Crimean campaign. 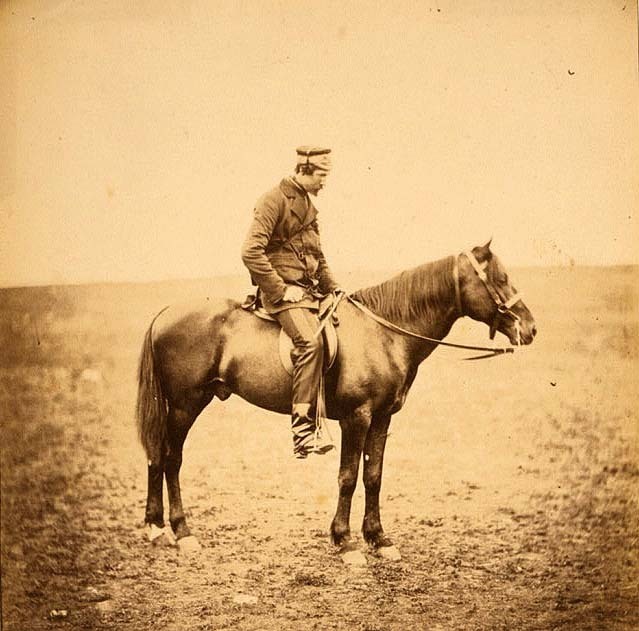 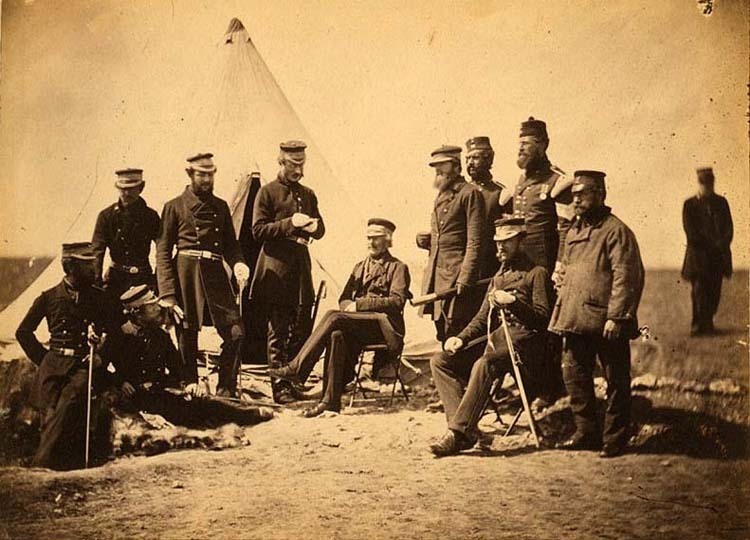 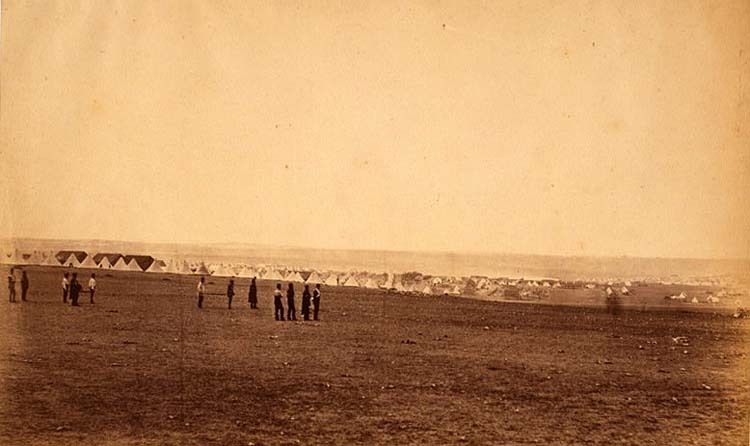 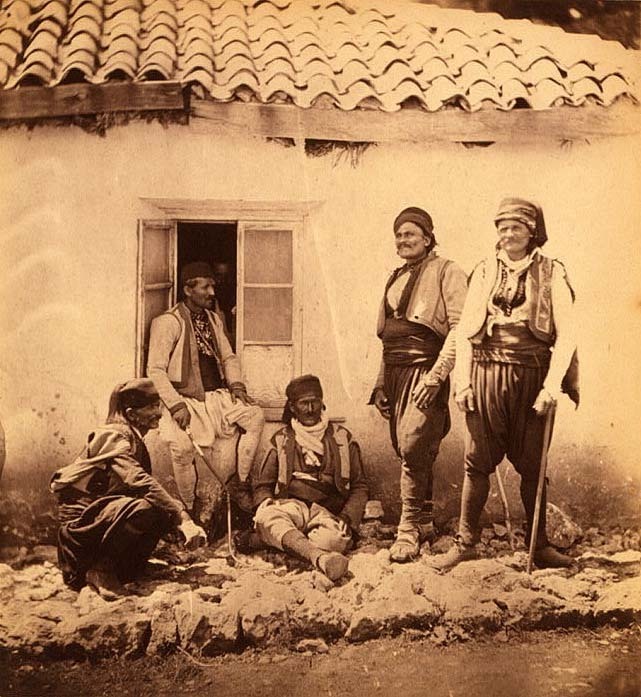 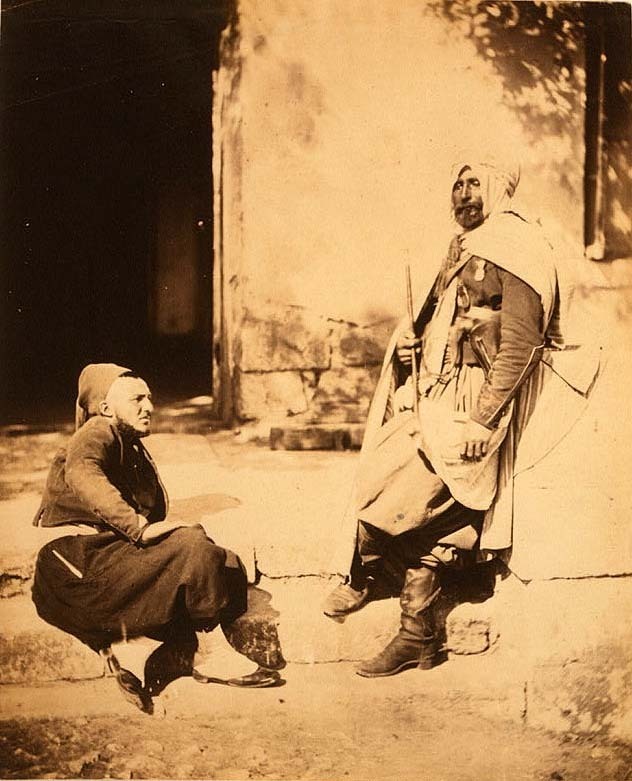 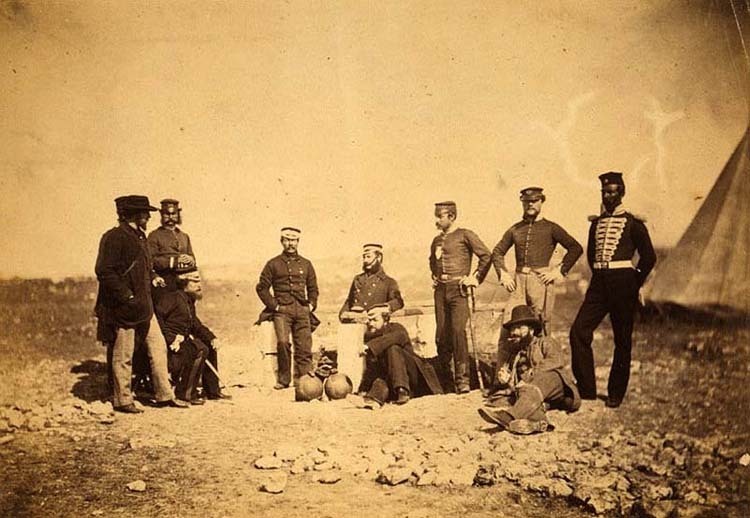 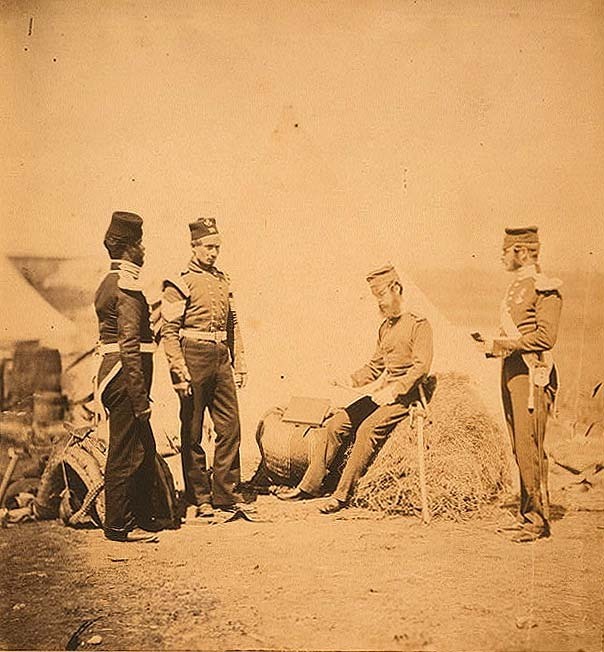 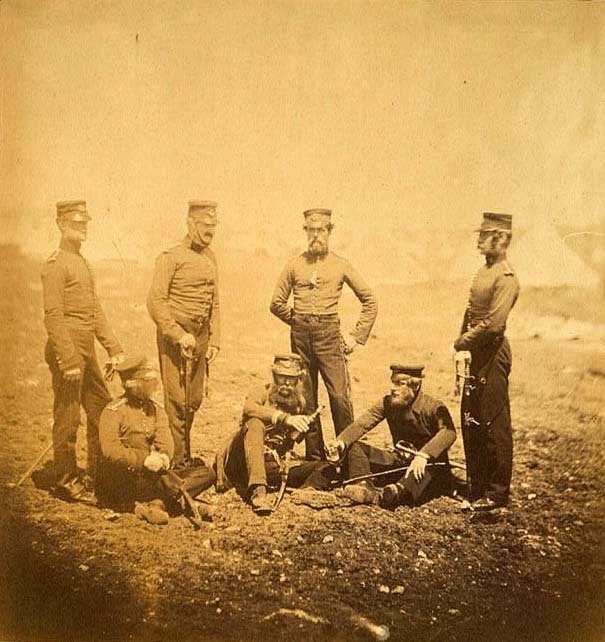 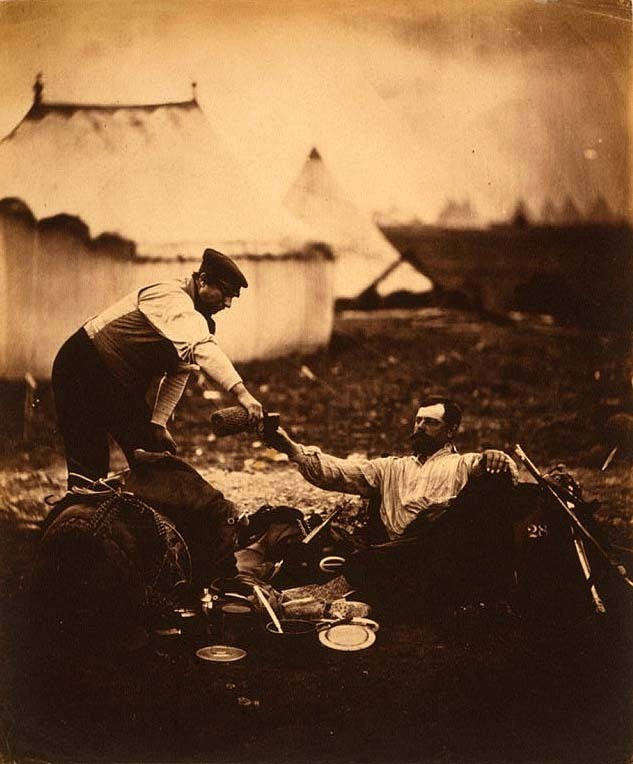 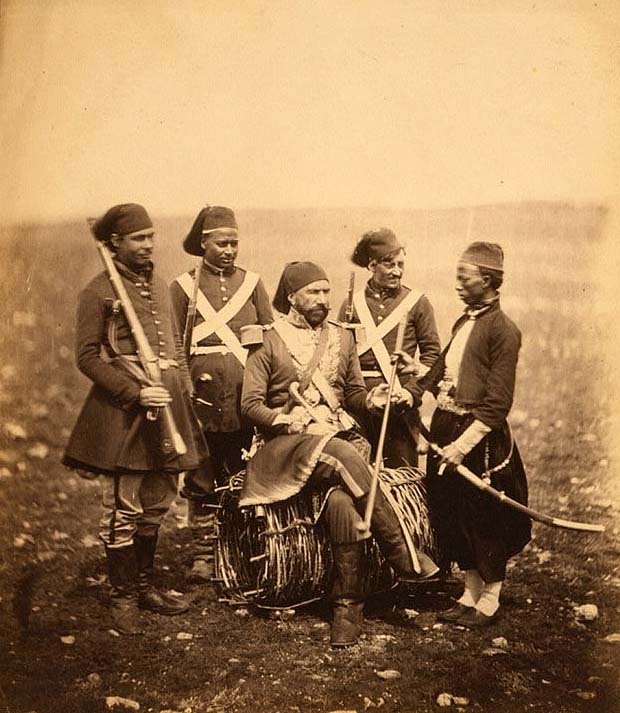 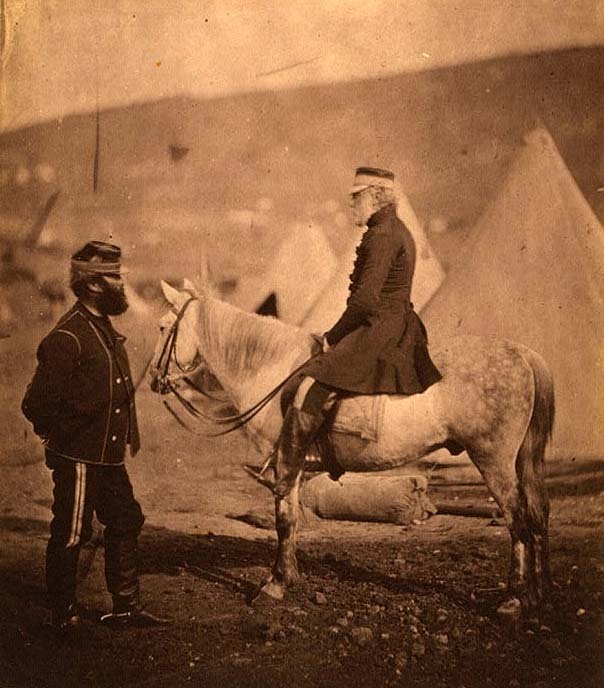 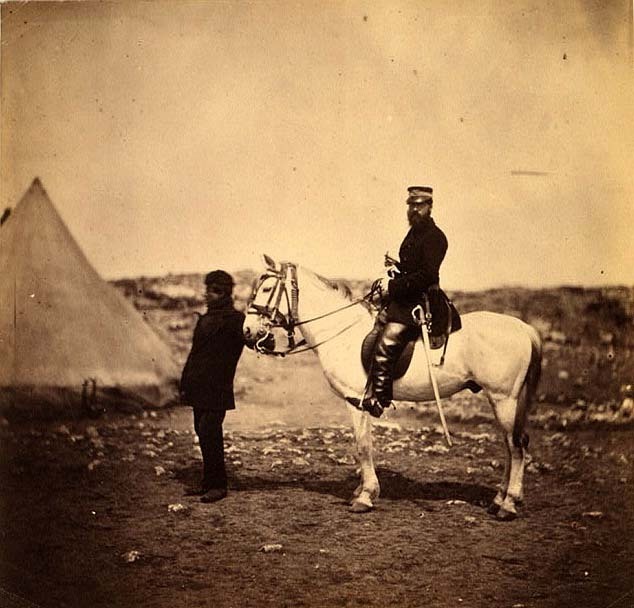 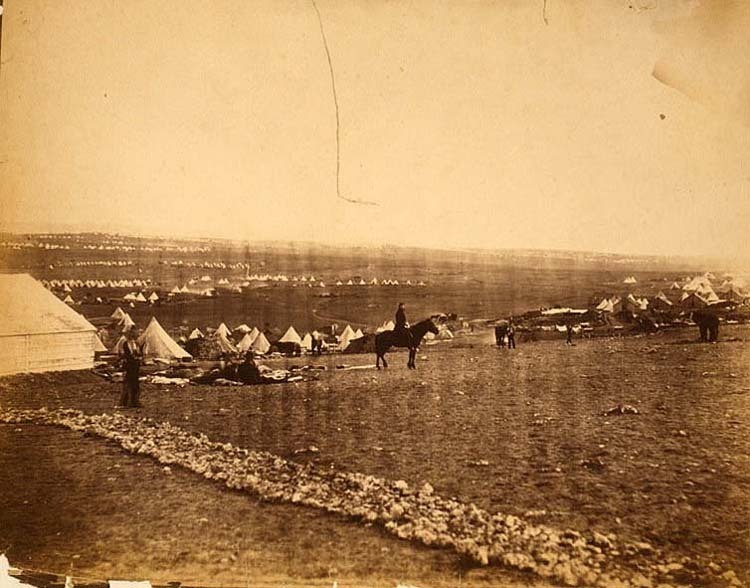 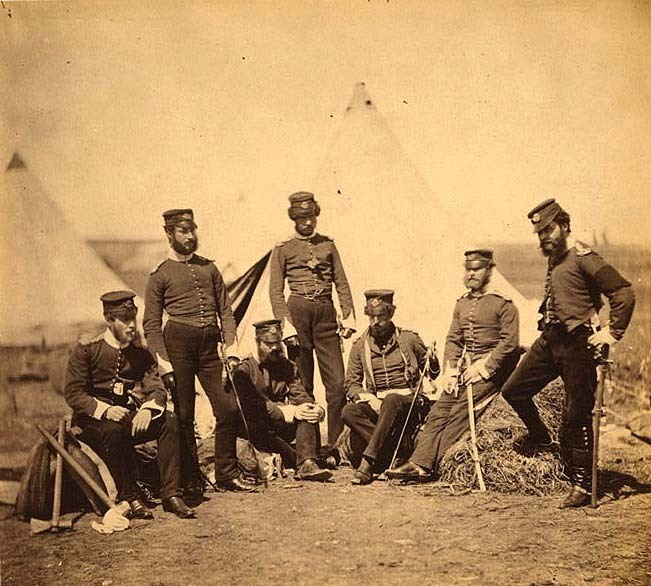 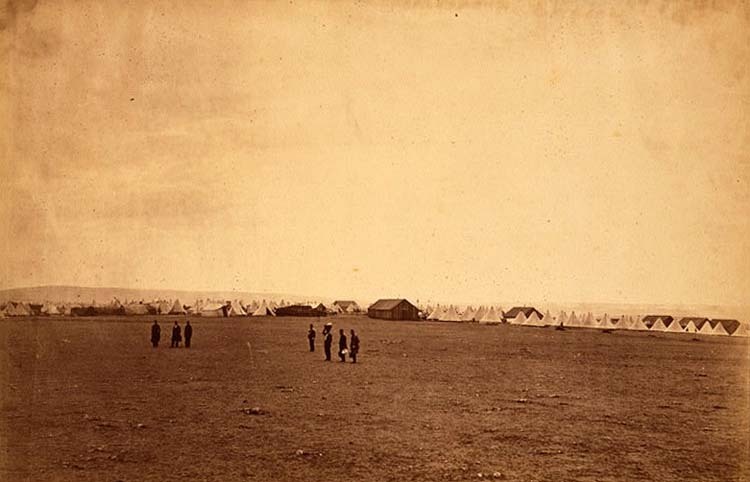 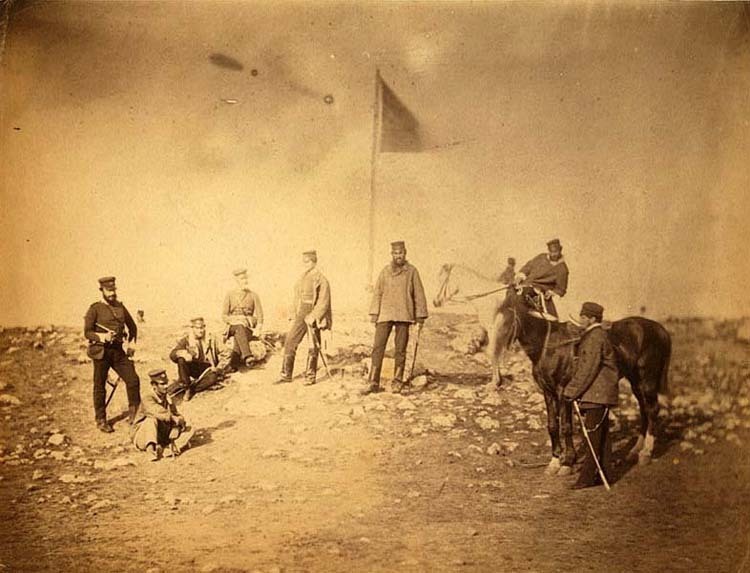 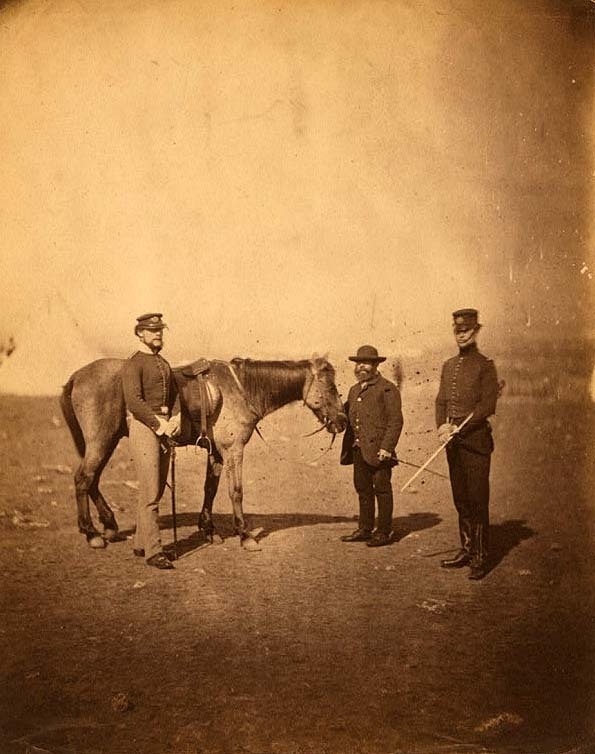 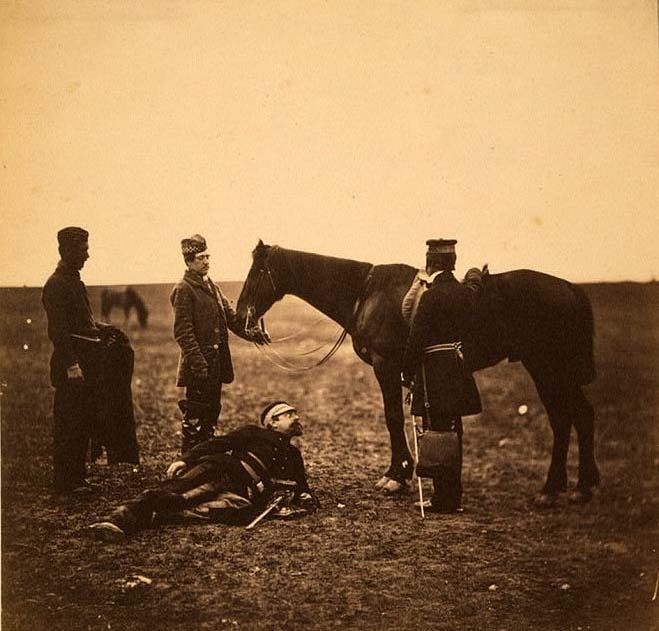 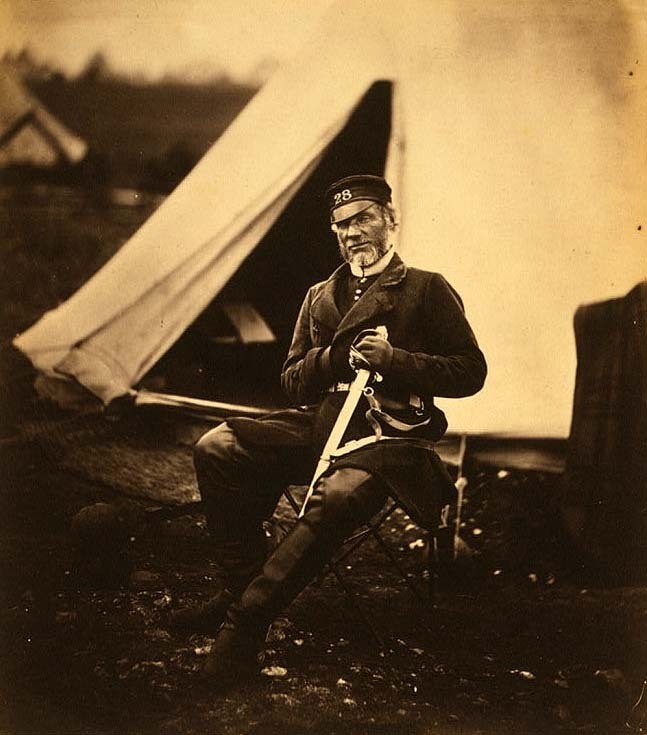 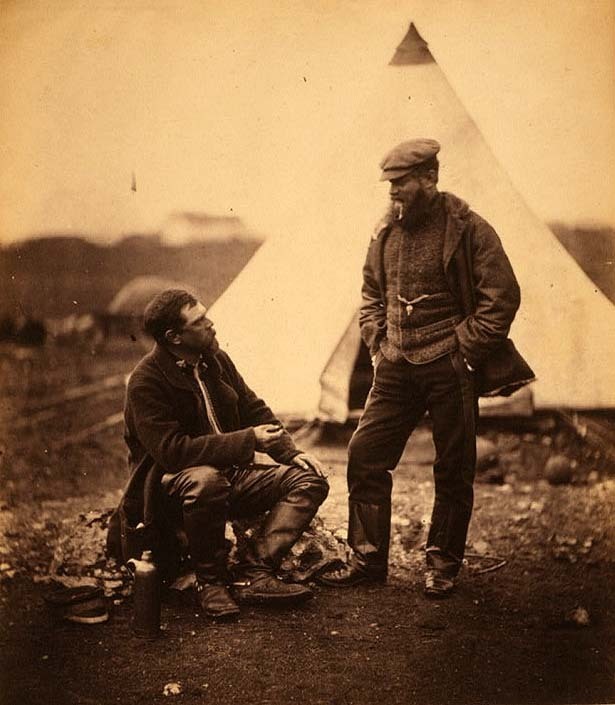 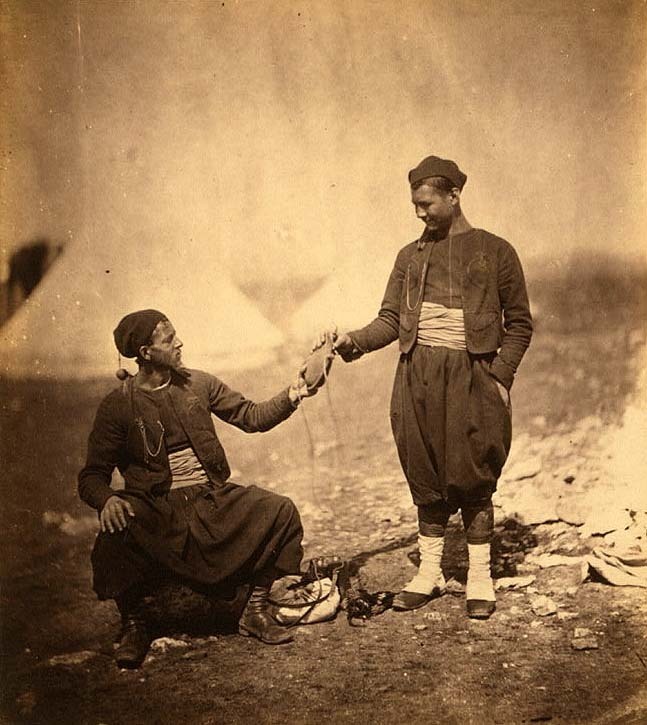 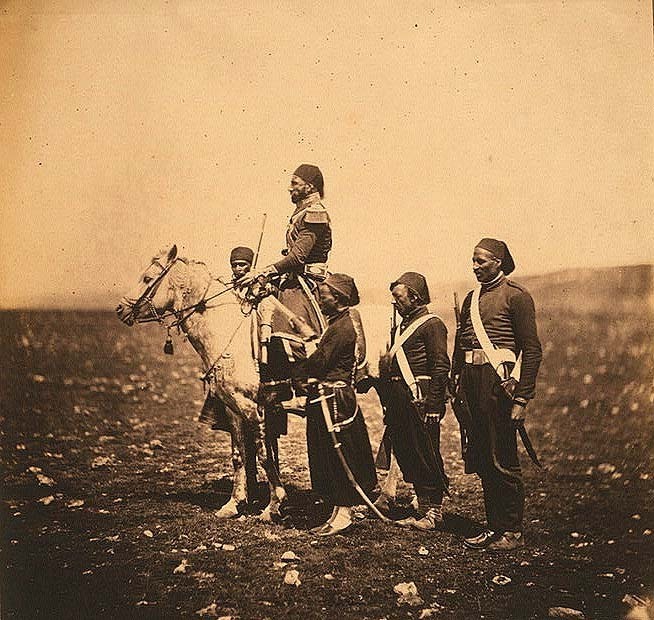 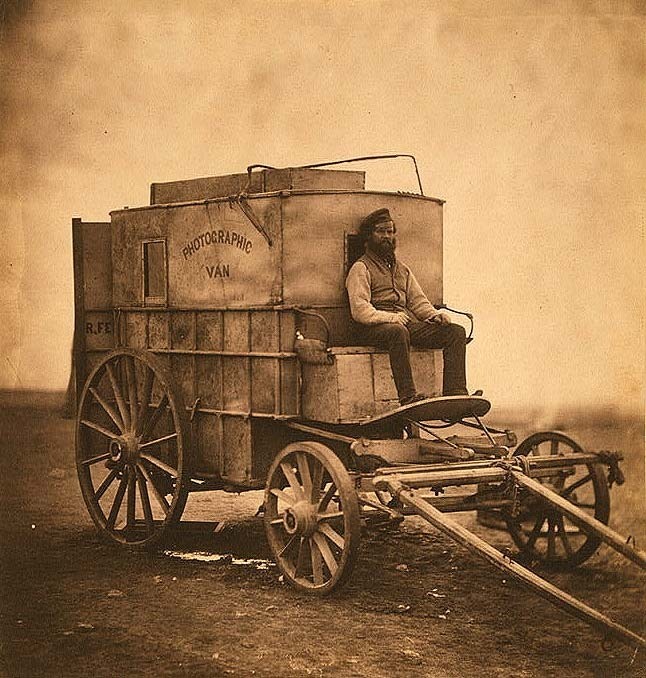 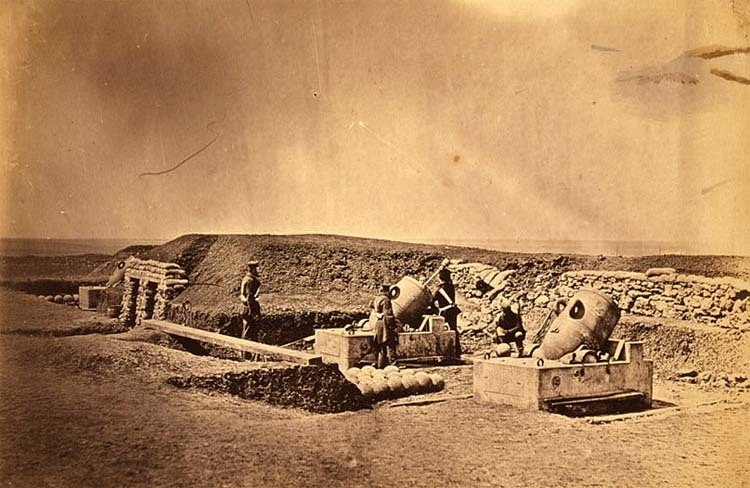 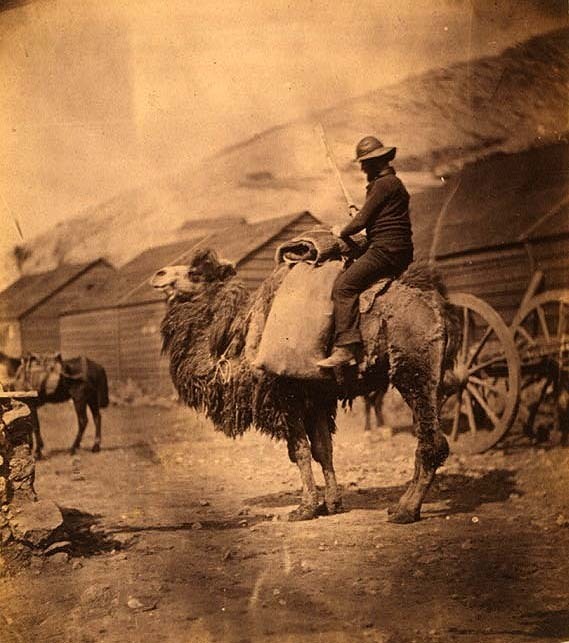 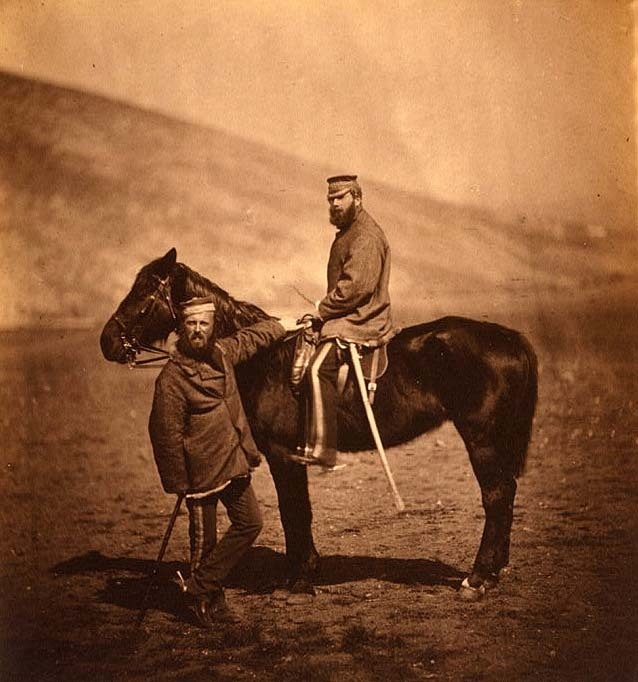 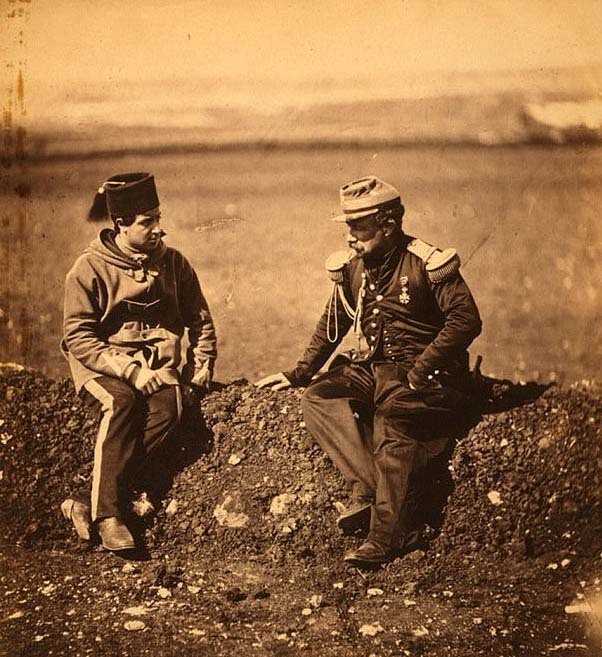 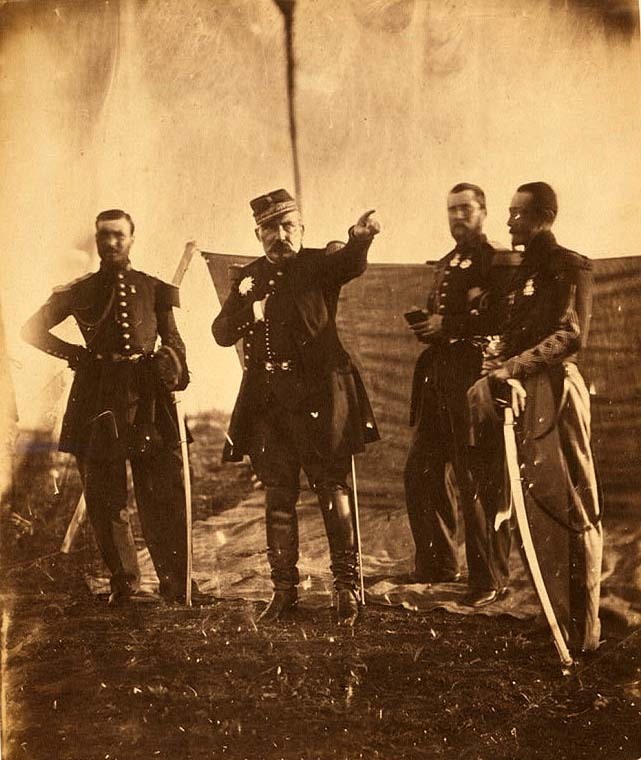 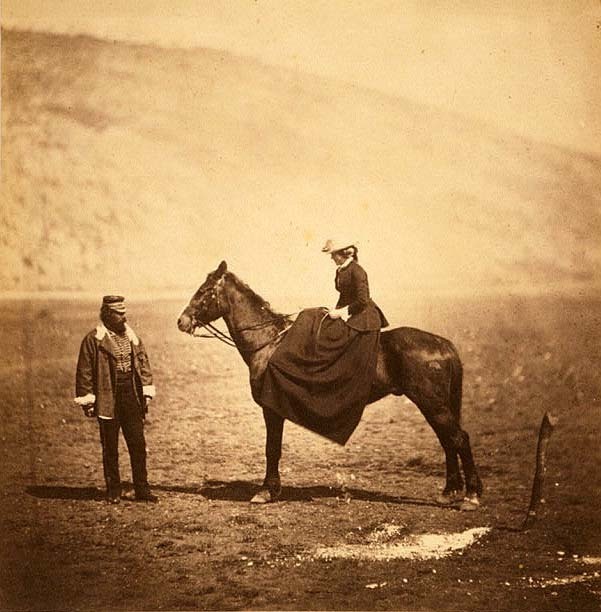 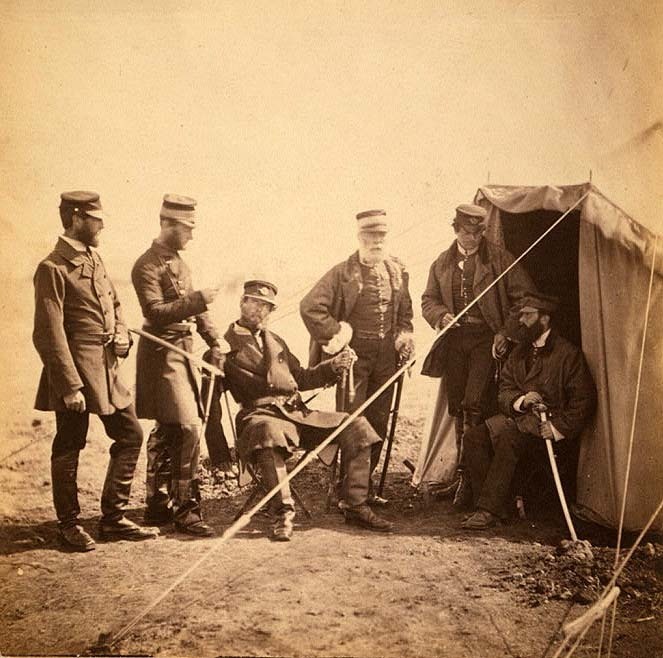 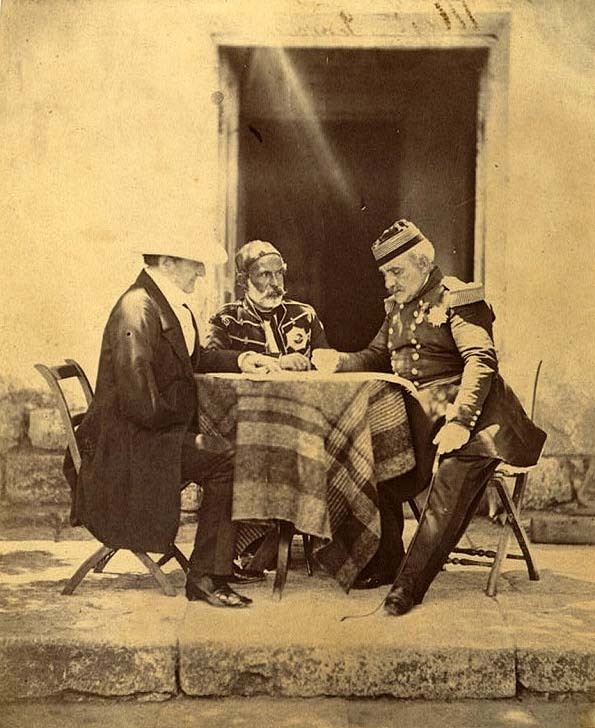 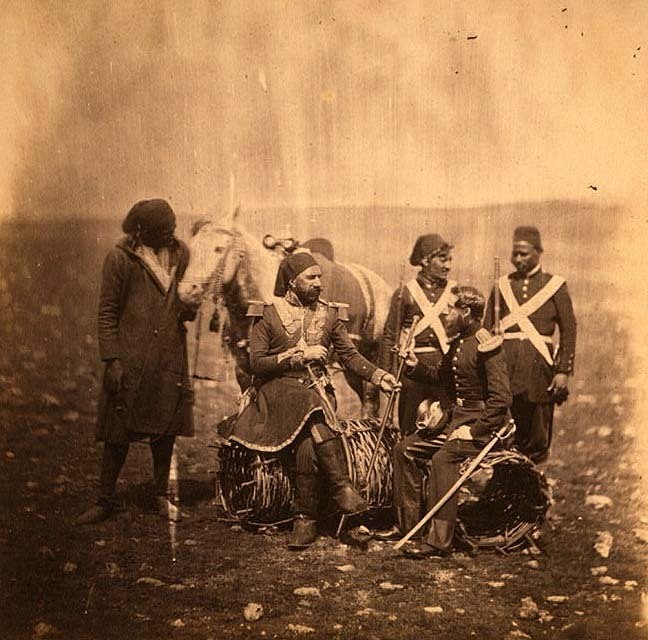 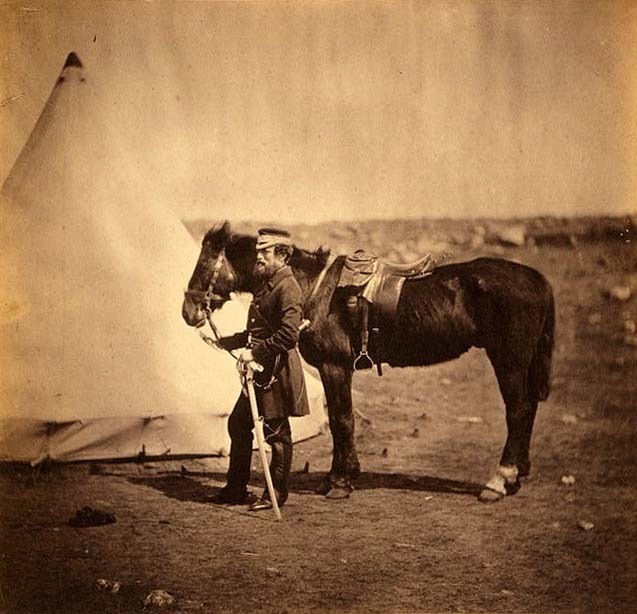 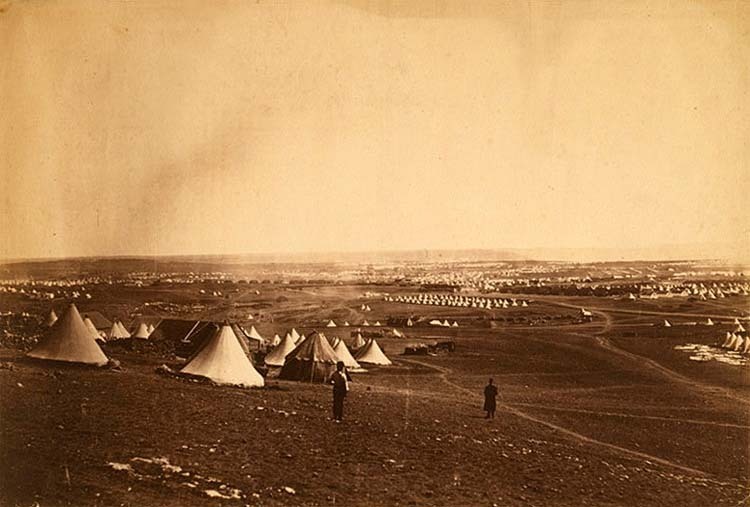 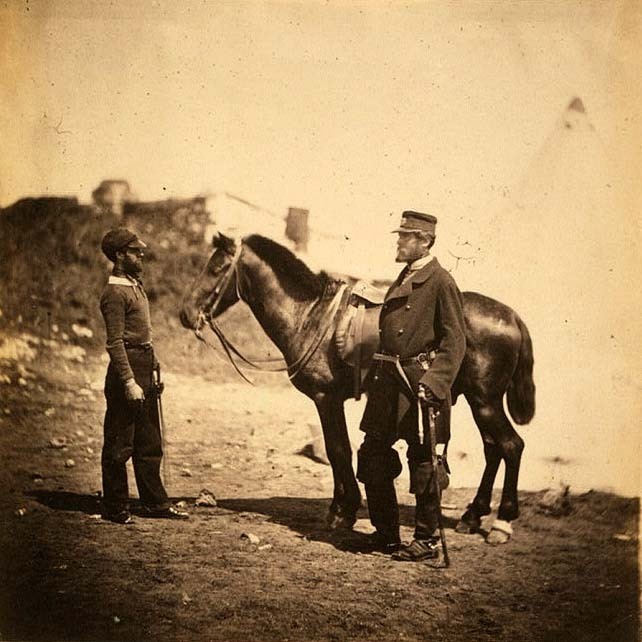 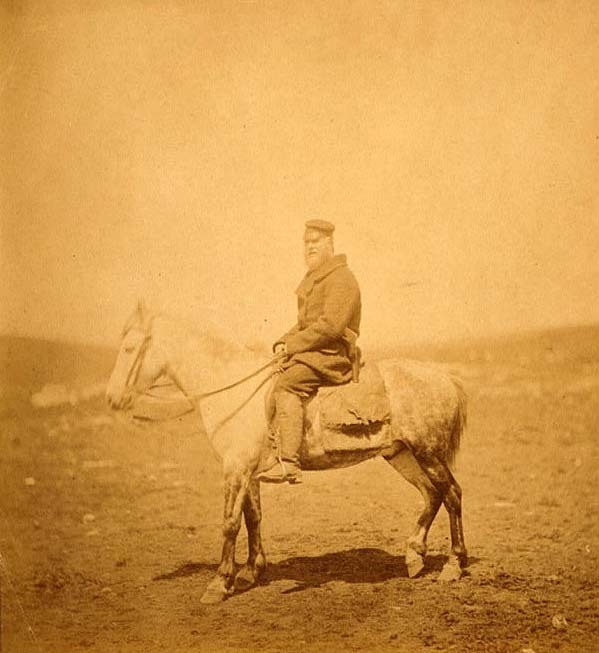 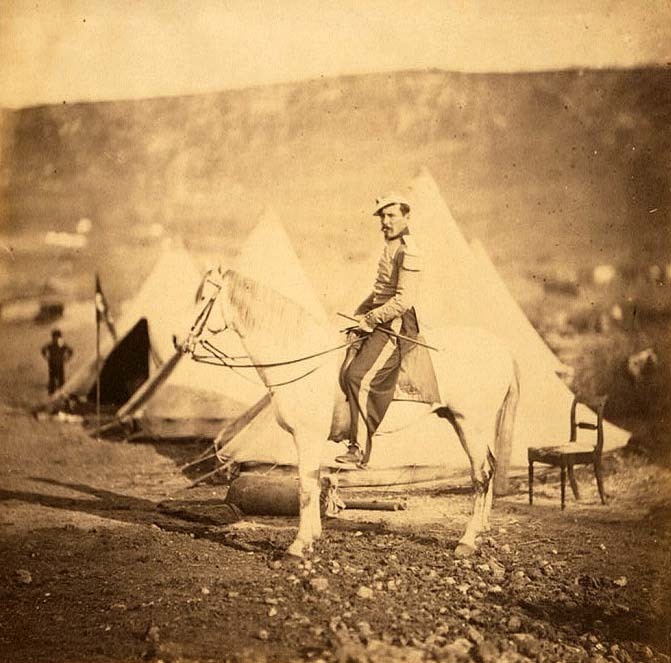 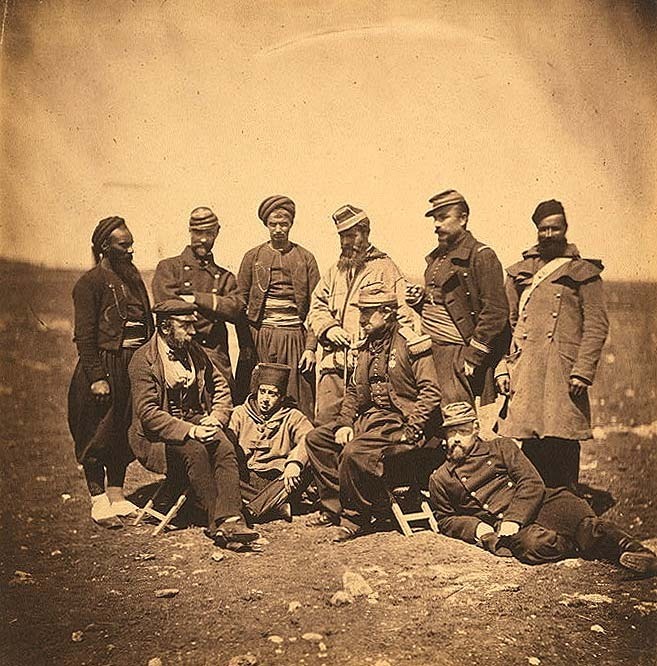 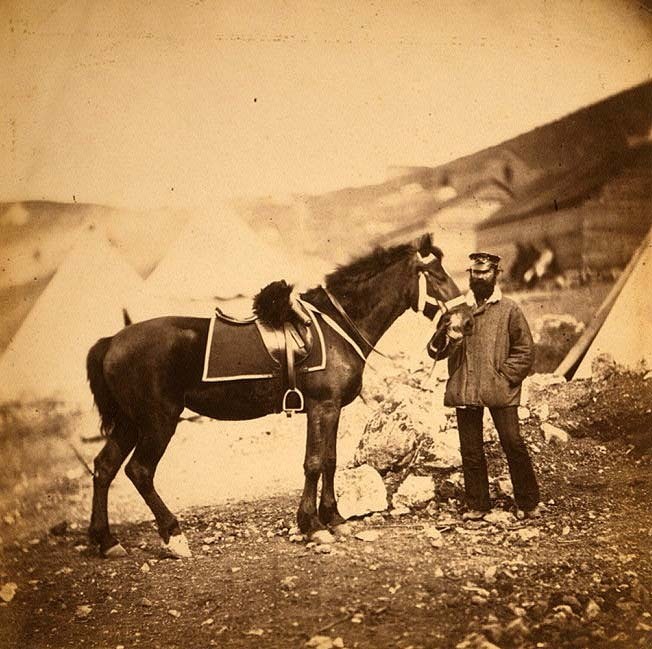 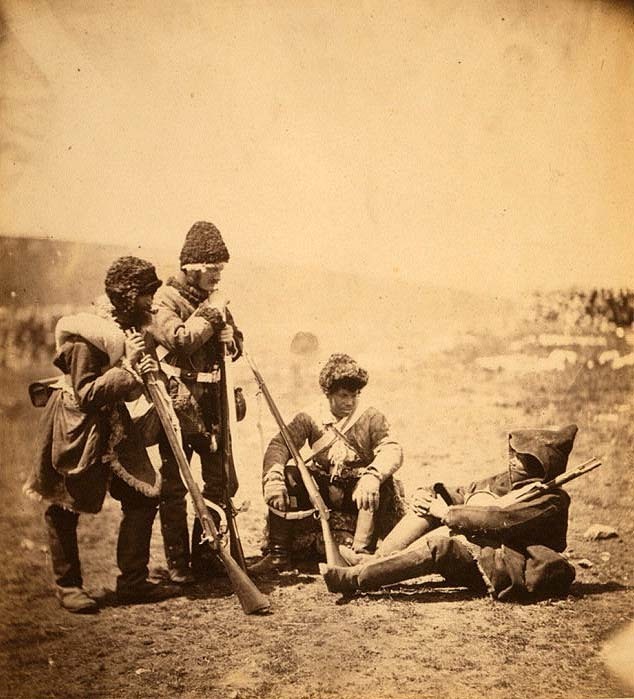 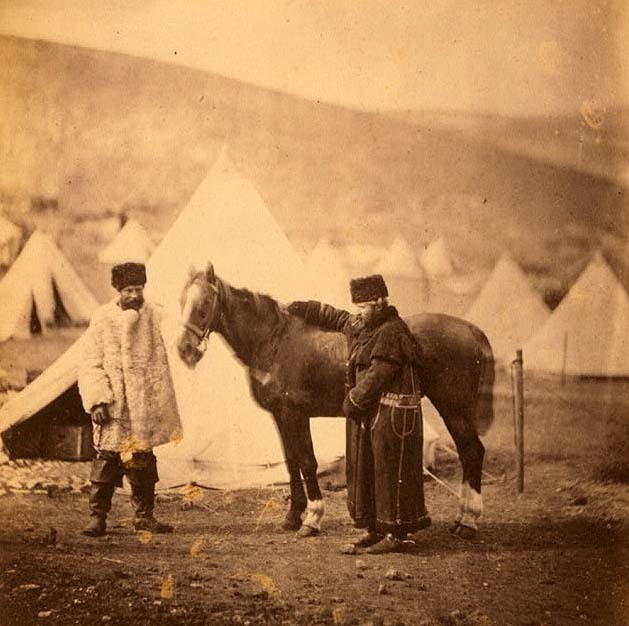 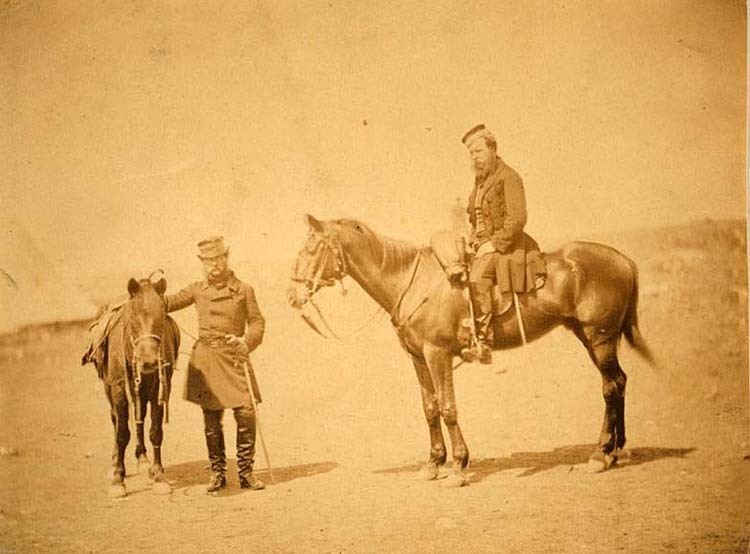 Roger Fenton's Crimean War photo series is the first historic attempt to portray war campaign with the help of new magic photo media, then still in its infancy. 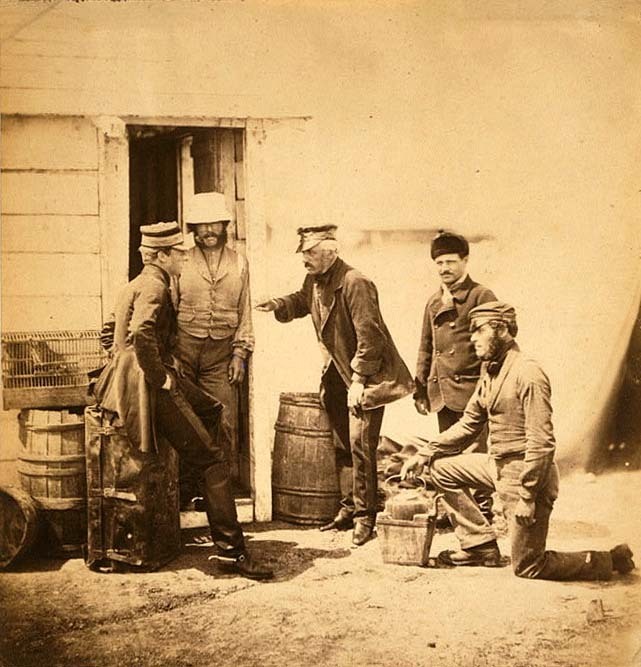 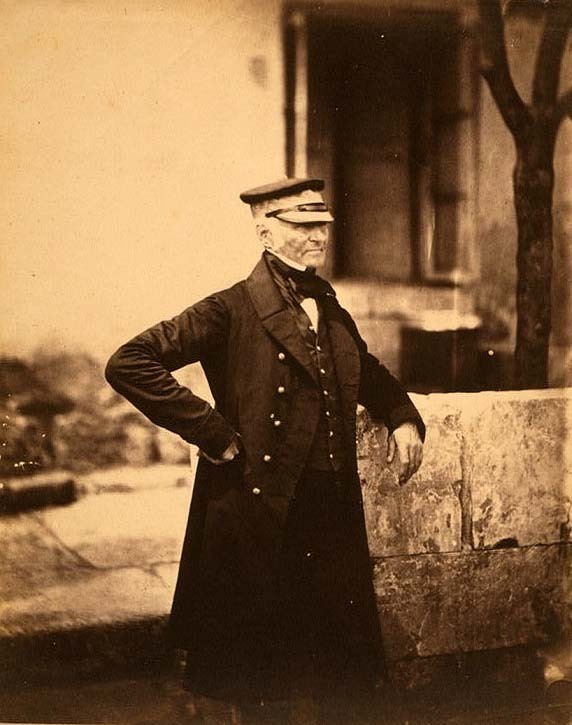 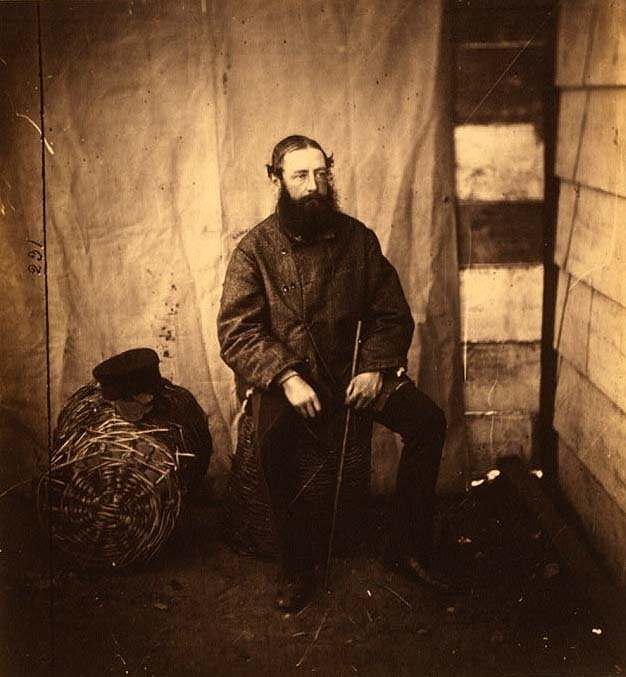 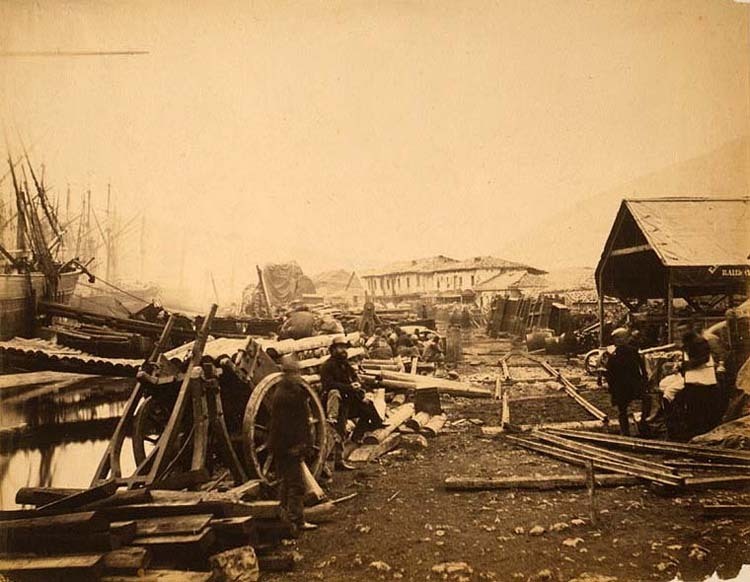 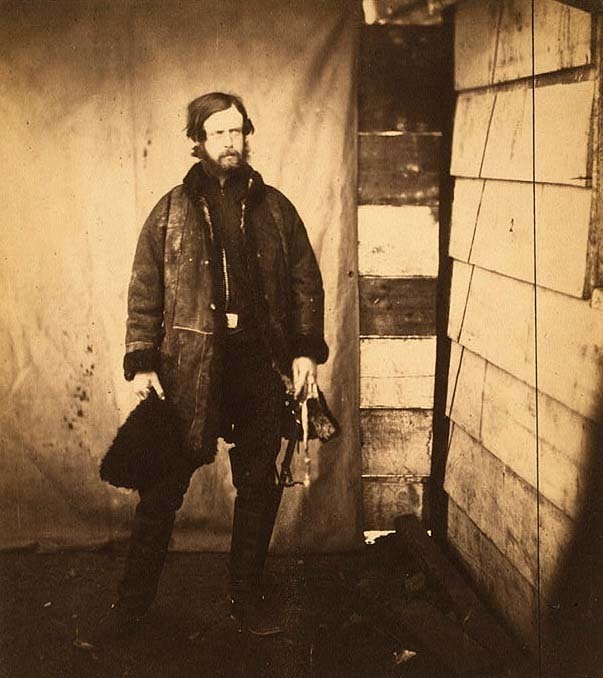 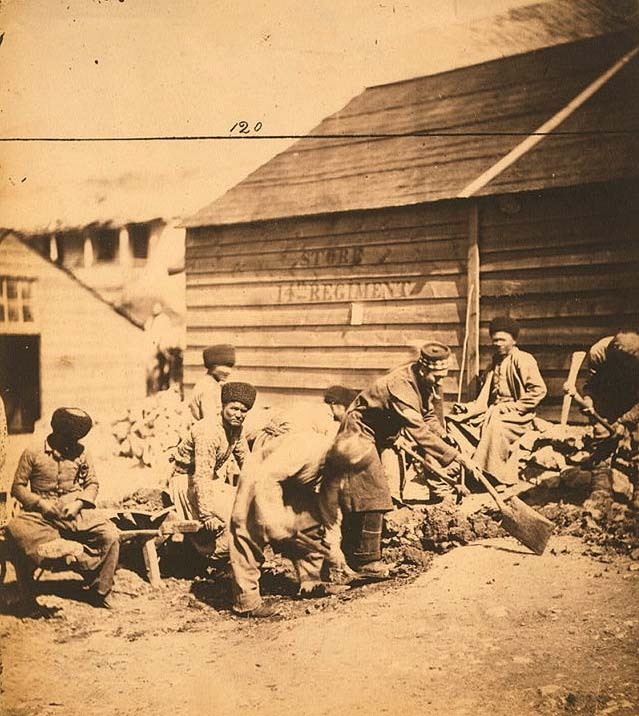 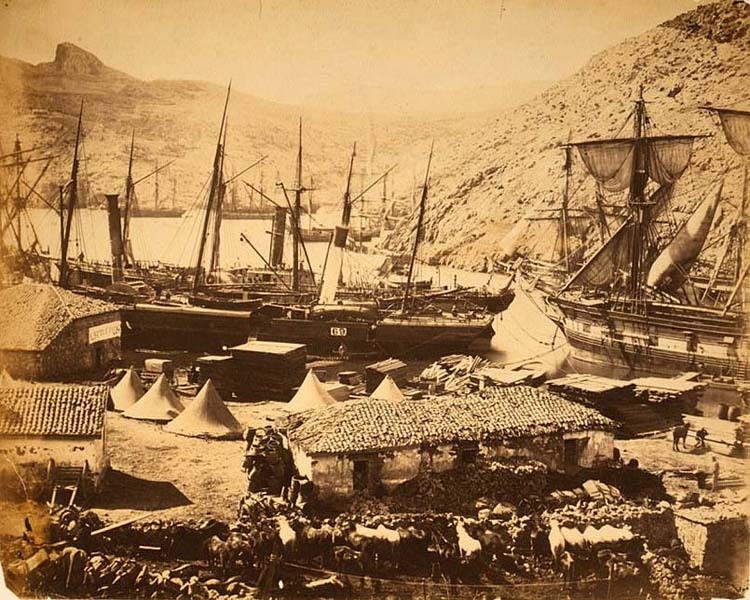 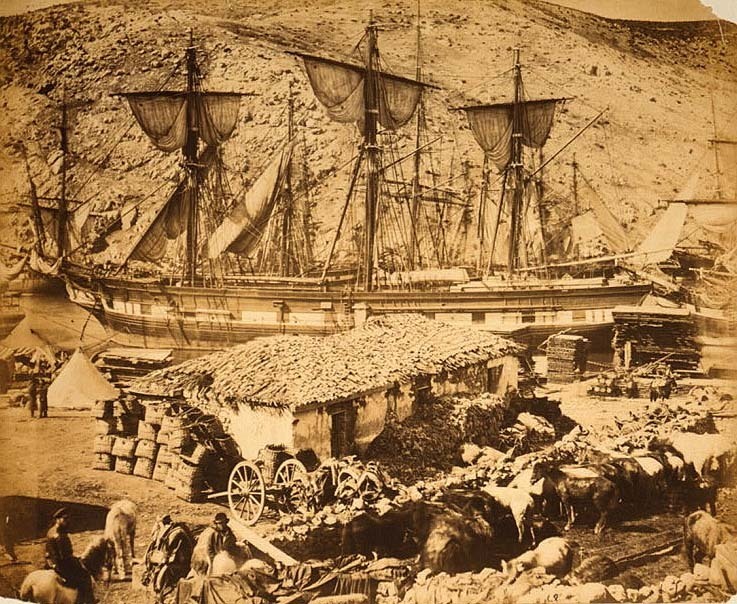 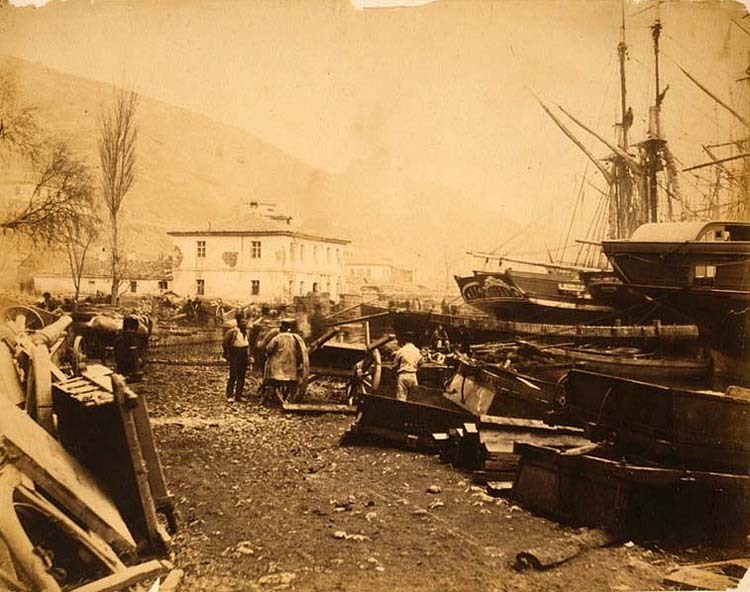 Sent as a replacement for the Richard Nicklin, a civilian photographer, who was lost at sea, along with his assistants, photographs, and equipment, when their ship sank during the hurricane that stuck the harbor at Balaklava on November 14, 1854. 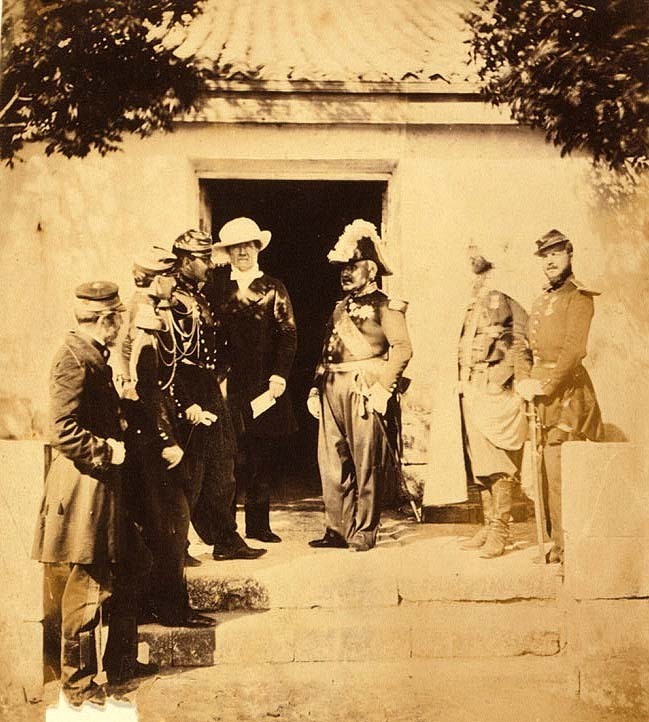 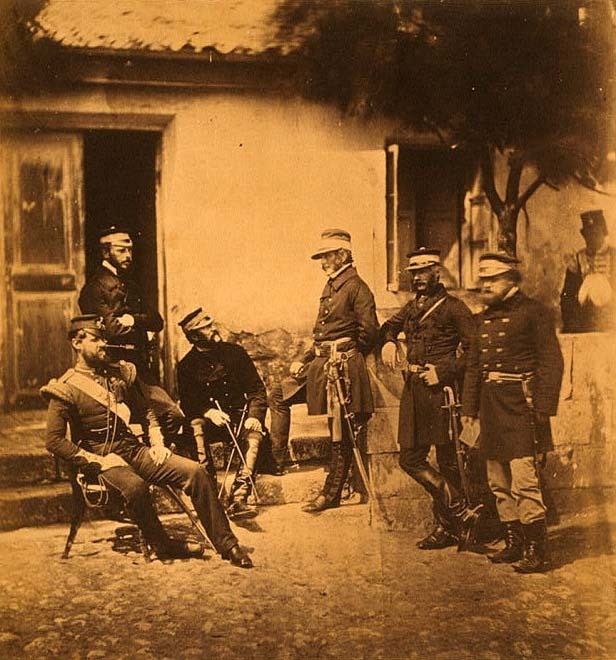 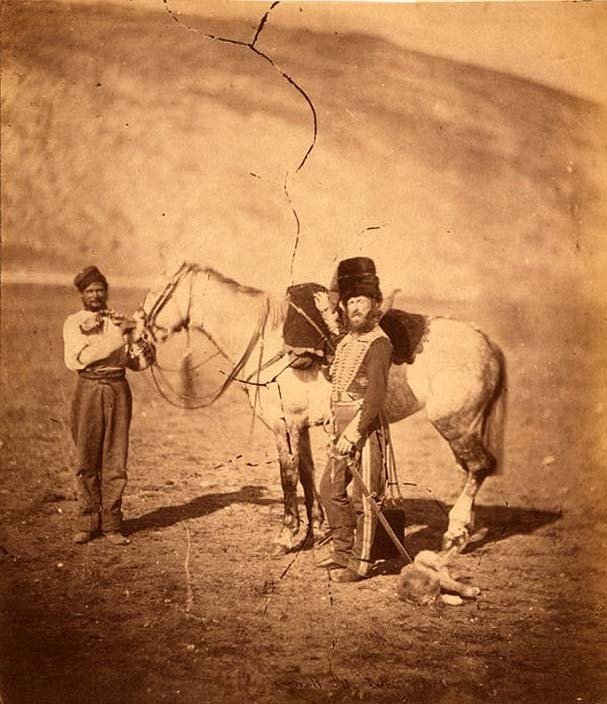 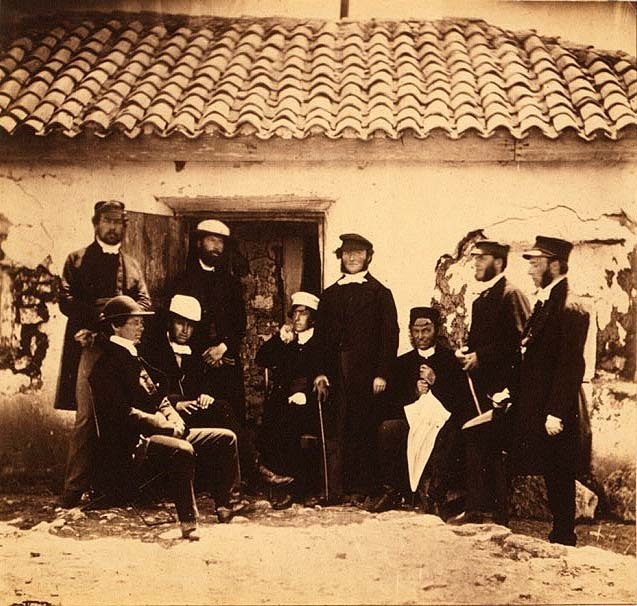 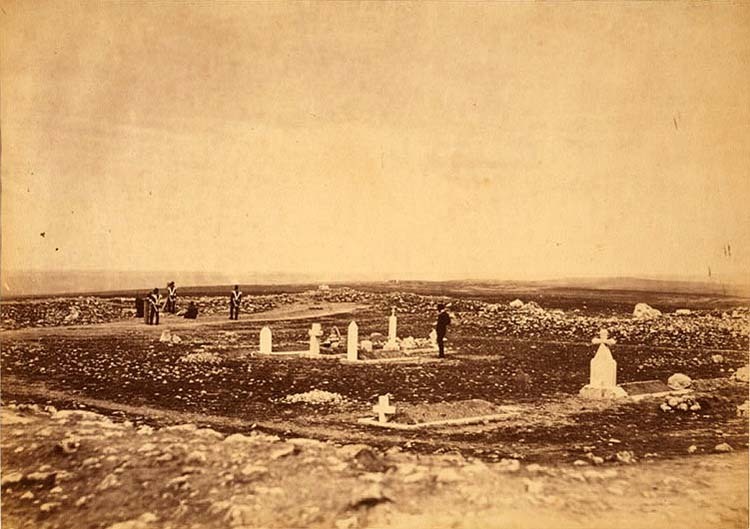 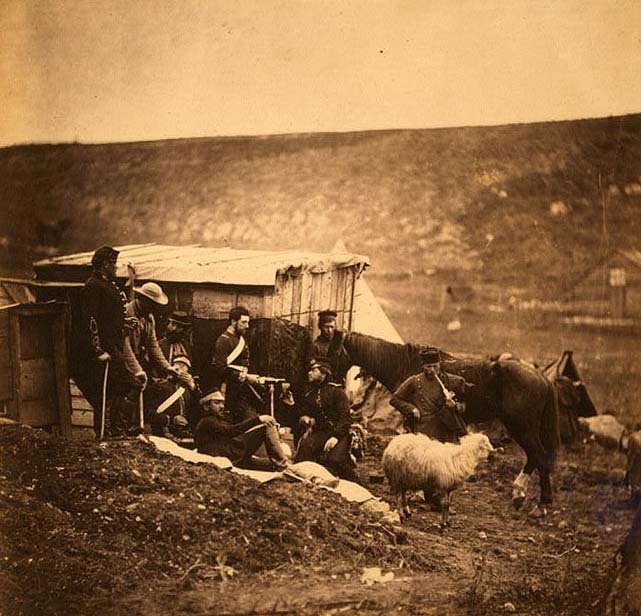 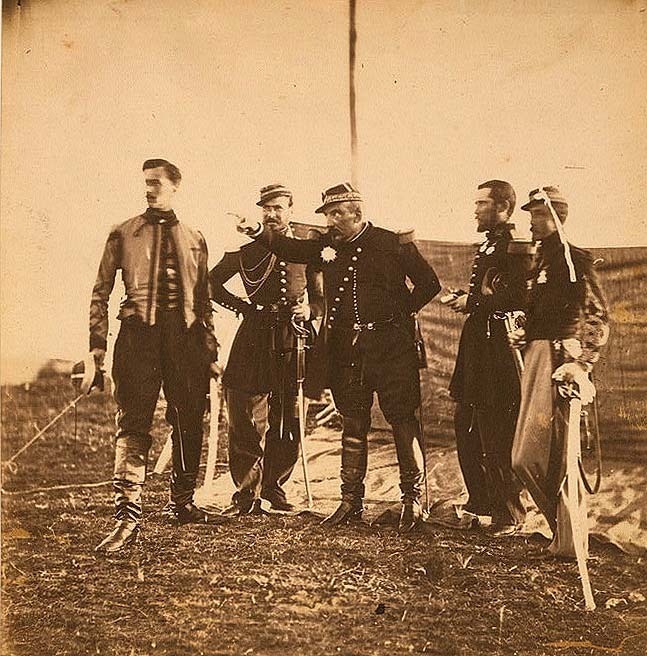 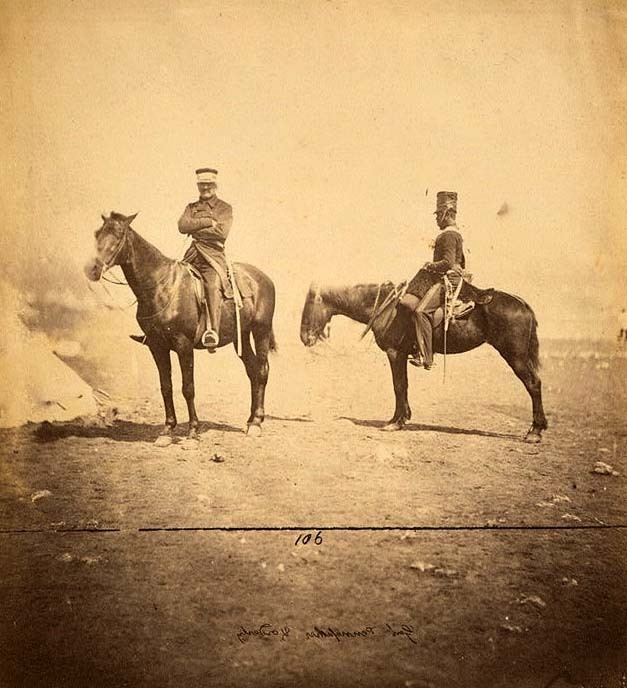 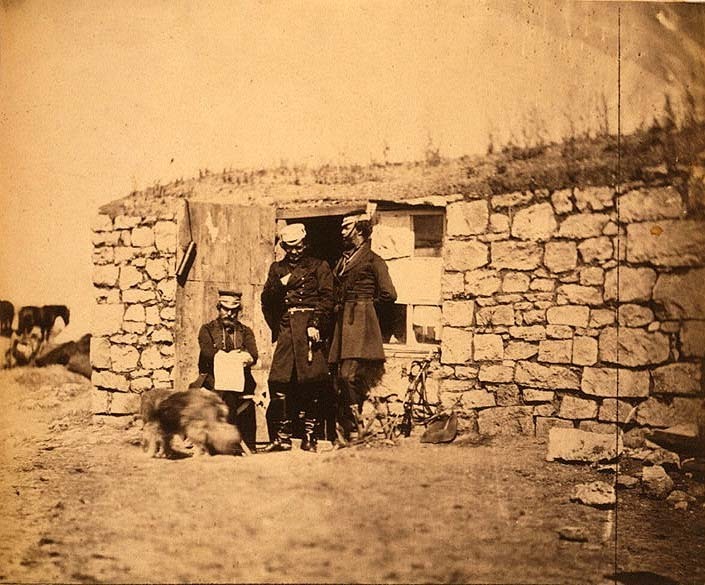 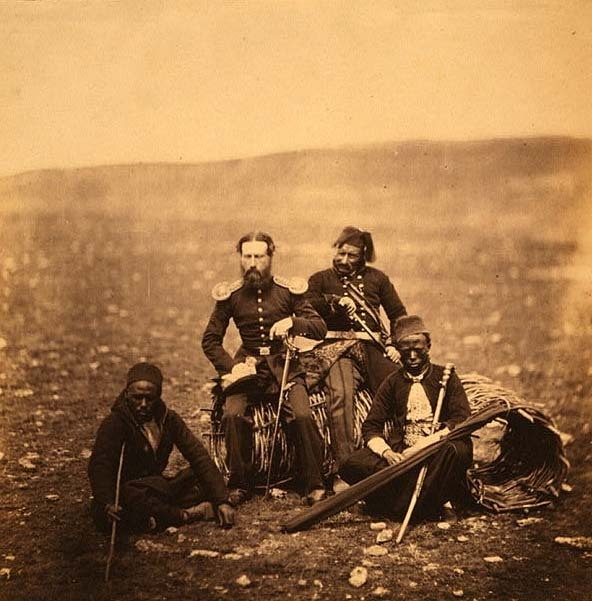 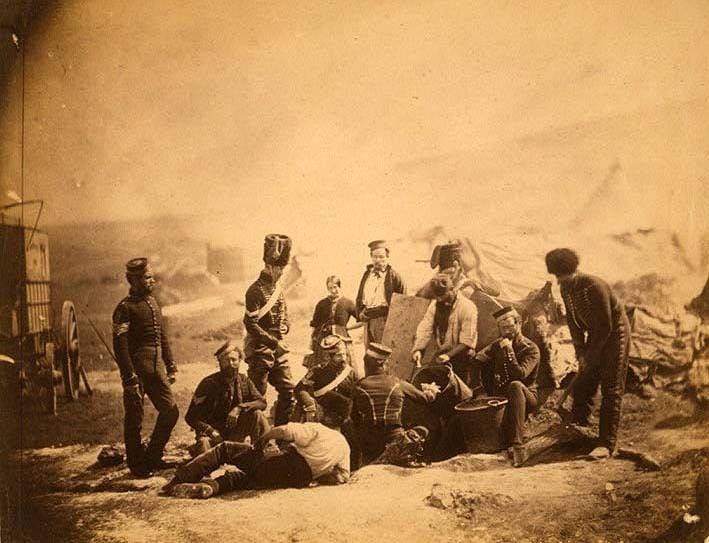 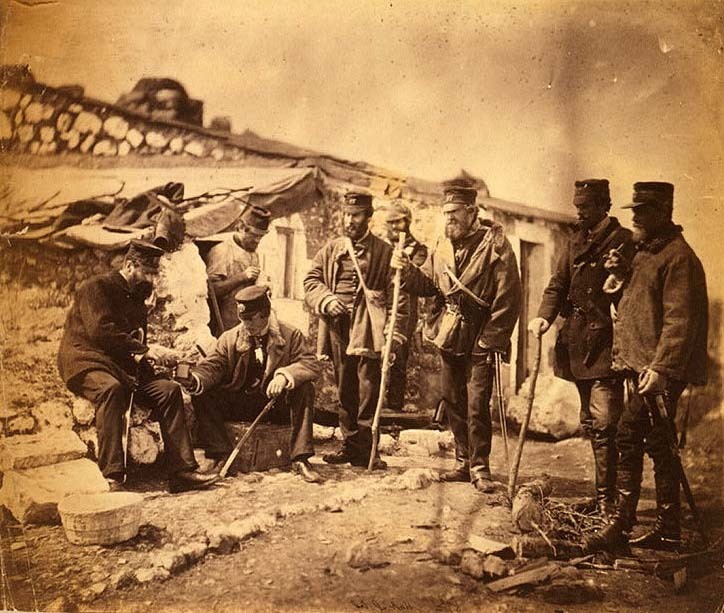 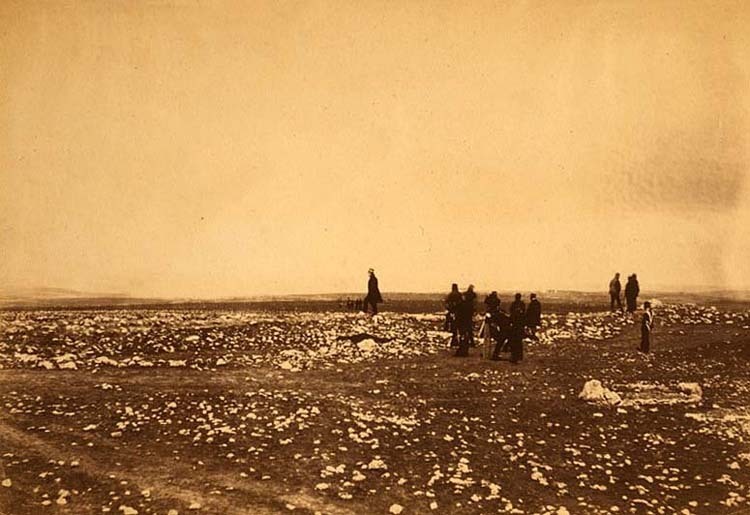 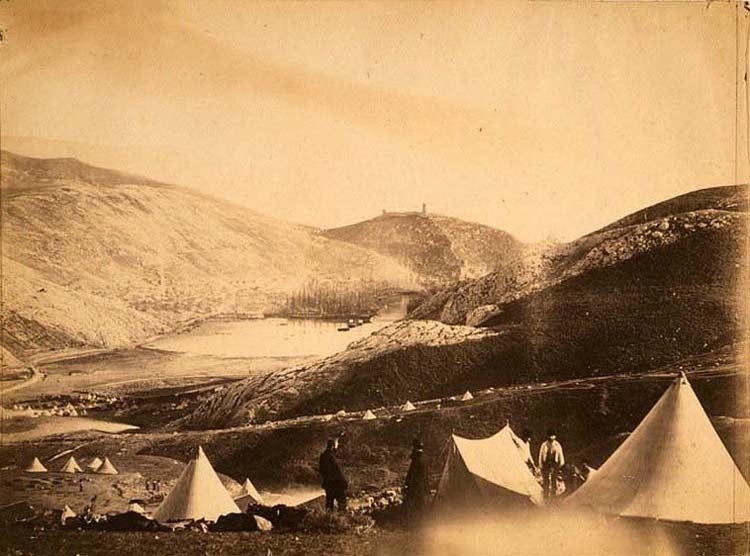 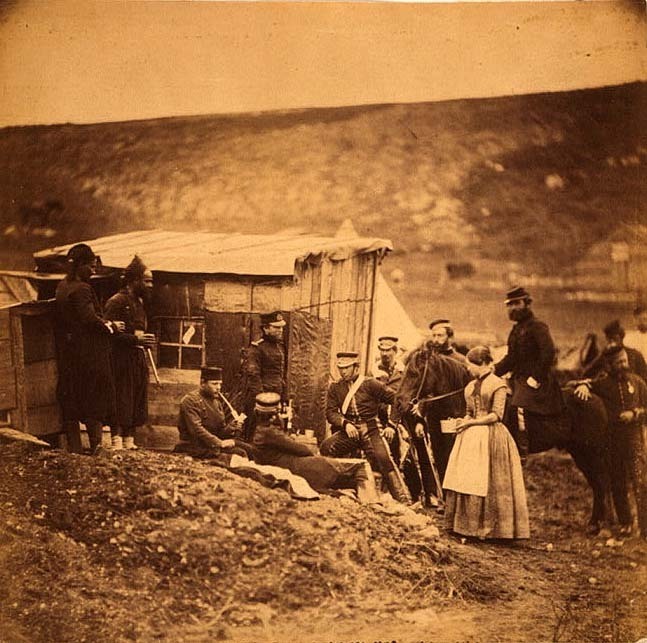 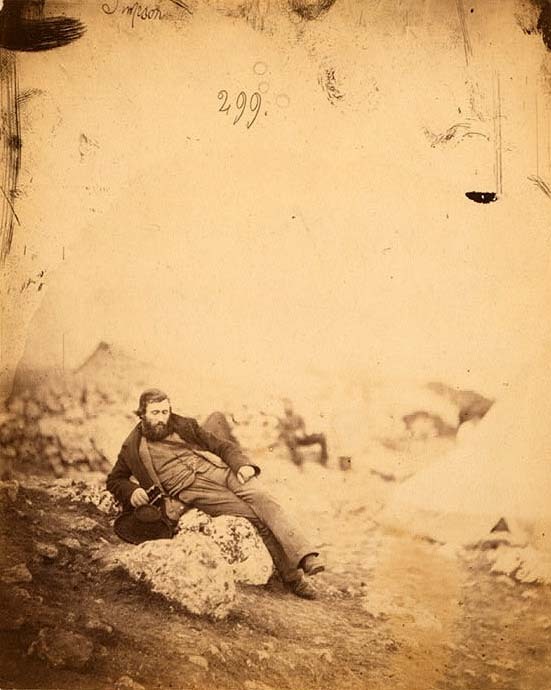 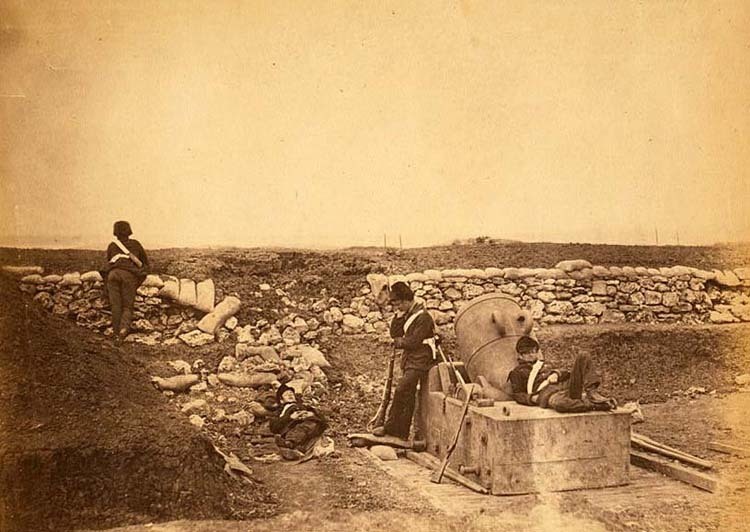 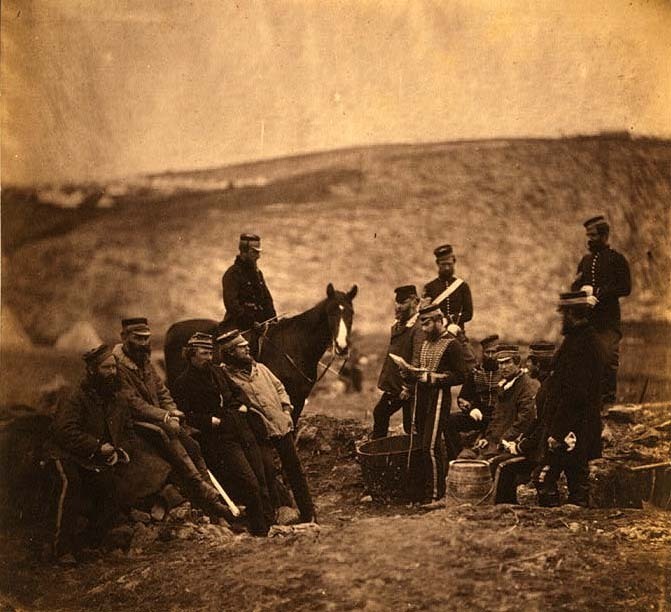 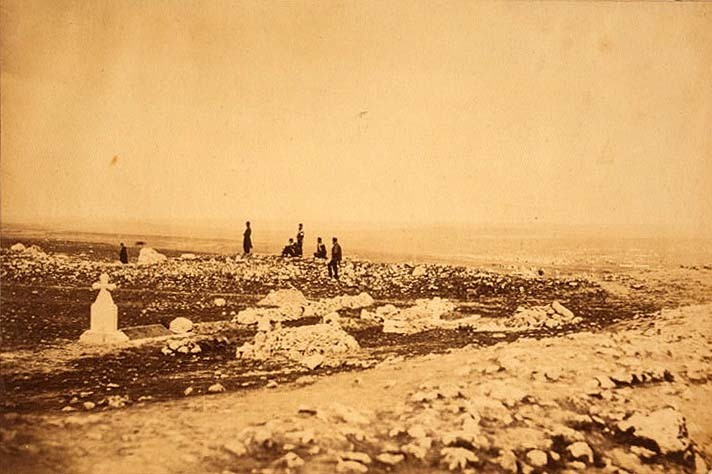 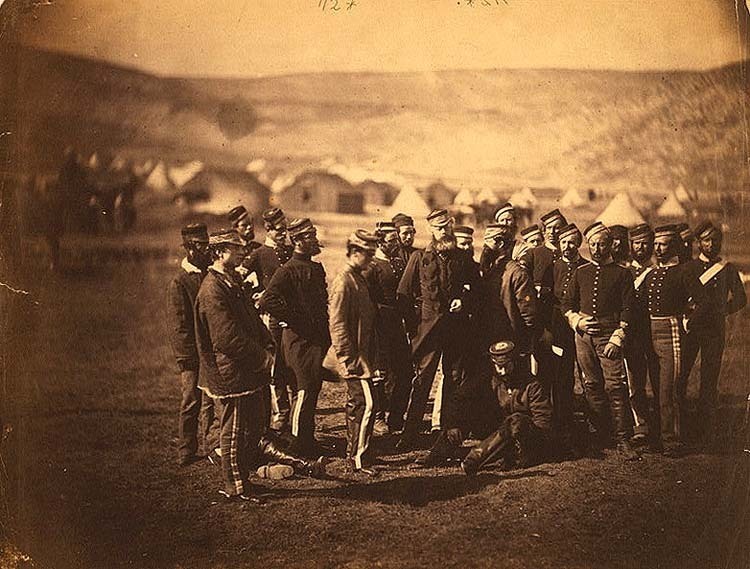 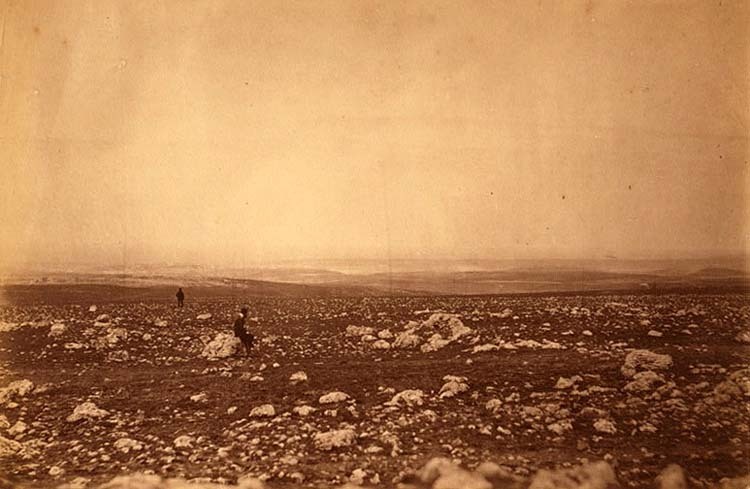 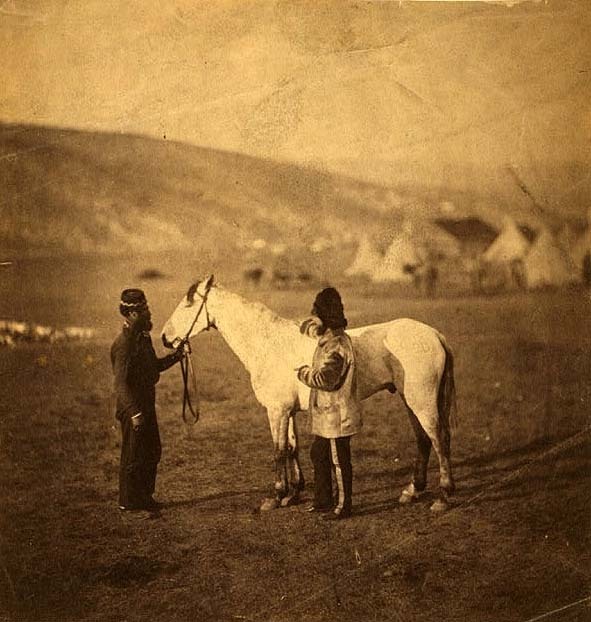 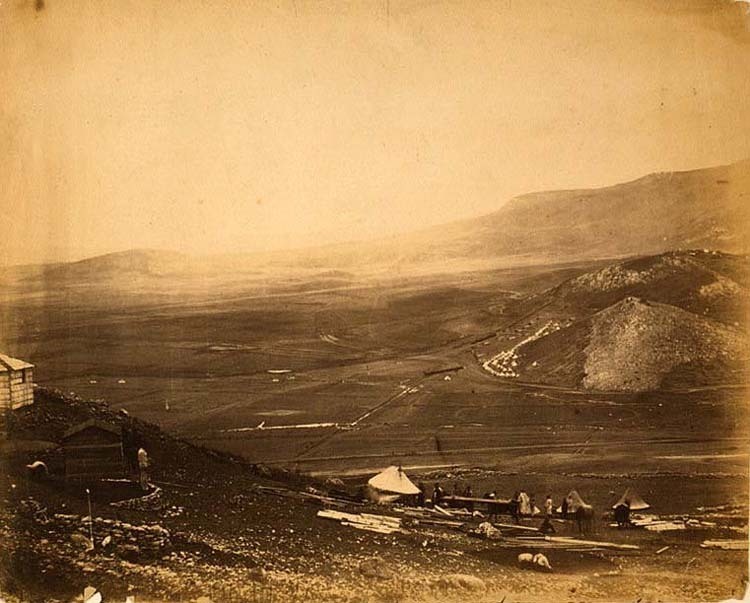 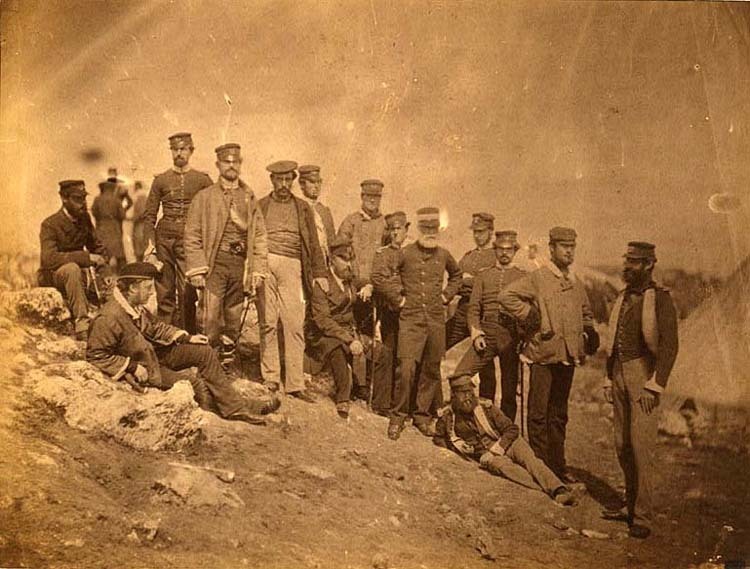 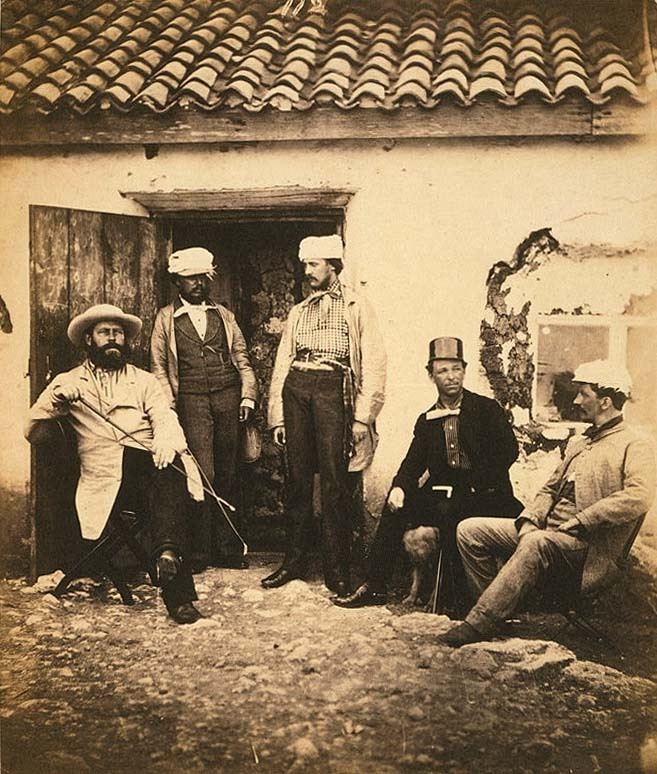 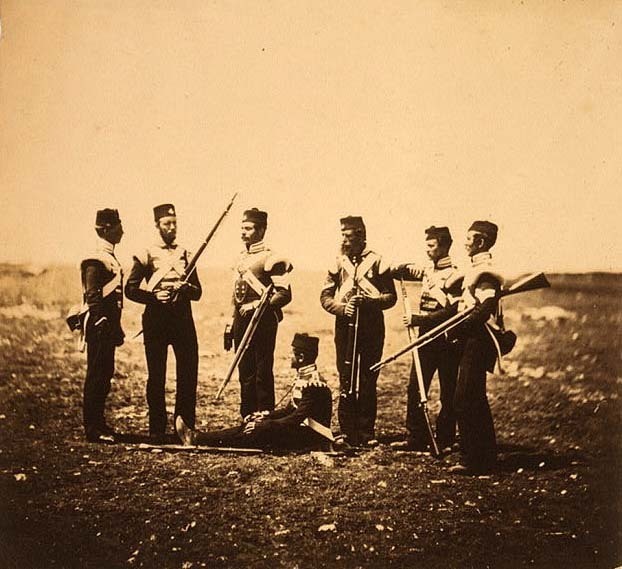 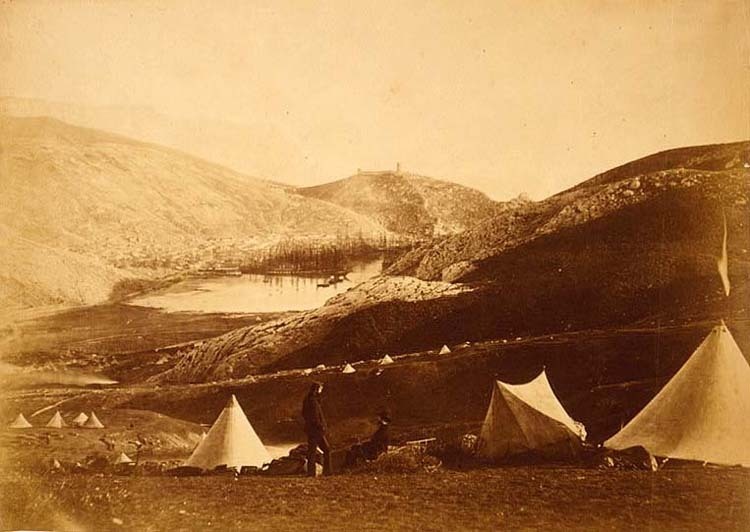 Fenton spend March-June 1855 in Crimea as an official campaign photographer, payed by the British government, recording participants and landscapes for posterity. 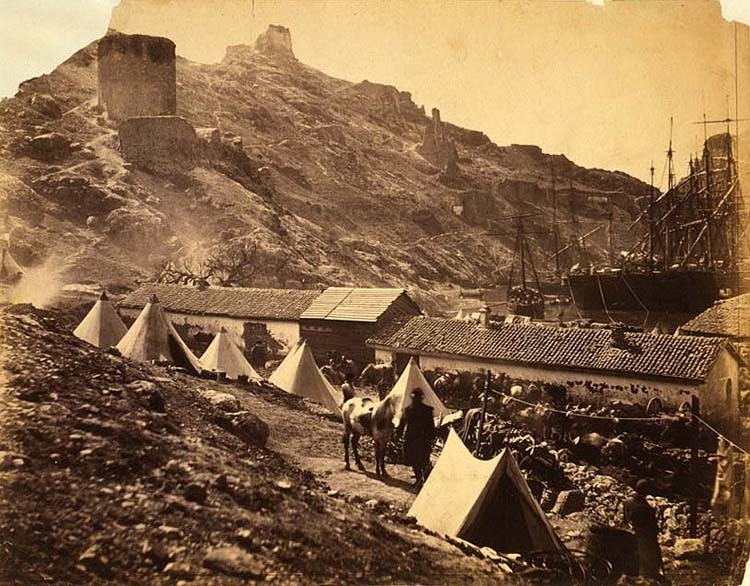 These records never managed to capture battles, explosions, devastations, wounds, blood and tears, partly due to the limitations of photographic techniques of the period, but also because of official wish to glamorize the war and shift public attention away from government and military mismanagement, for which Crimean campaign became infamously known. 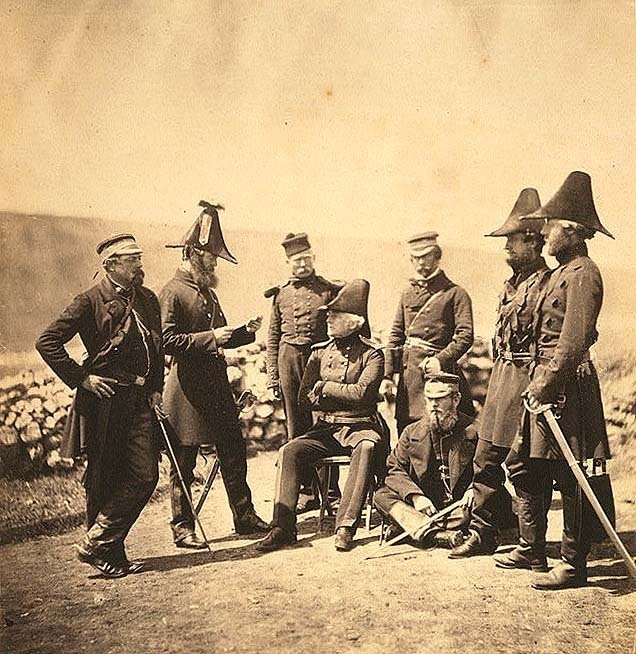 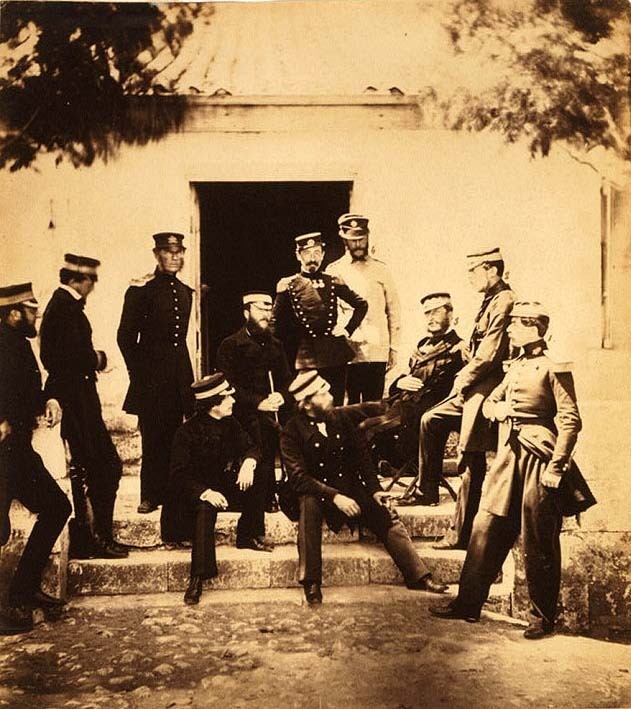 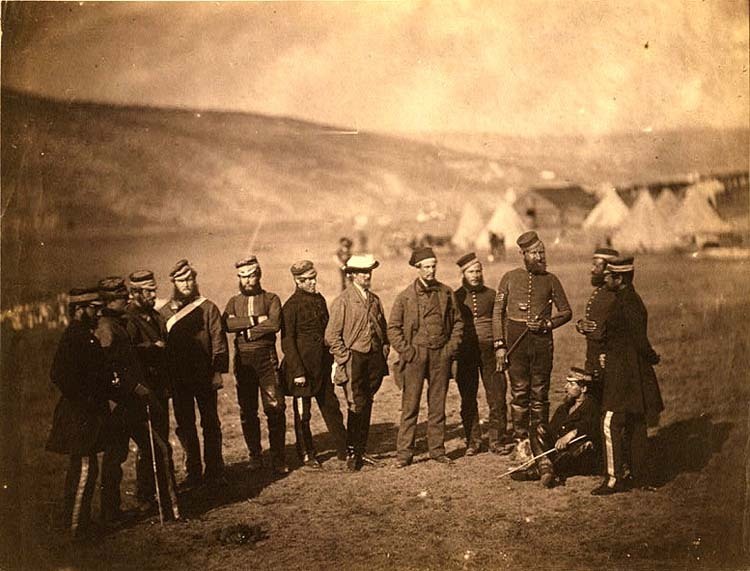 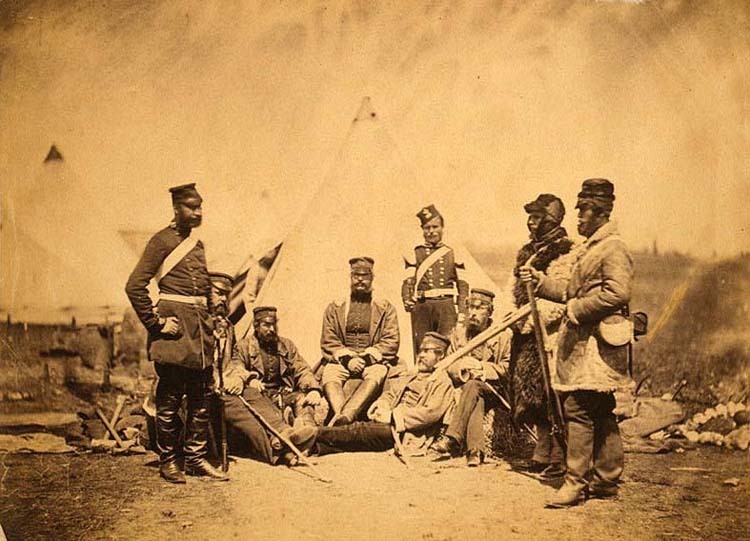 Lord Raglan, Lord George Page, General Pennefather, Sir John Brown, Sir Colin Campbell, commander of the “Thin Red Line”; French Maréchal Pélissier, General Bosquet, “Little Nephew of the Great Uncle” Prince Napoleon; Turkish Ismail Pacha and Omar Pacha; officers of the Guards regiments, colorful highlanders and zouaves, sergeants, soldiers, orderlies, reverends, Royal comissioners, railway engineers, camp followers, laborers, fellow artists, war correspondents and civilian travellers. 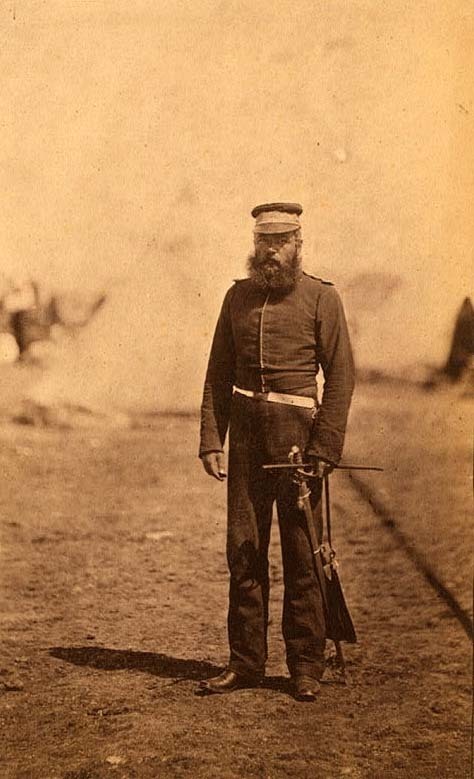 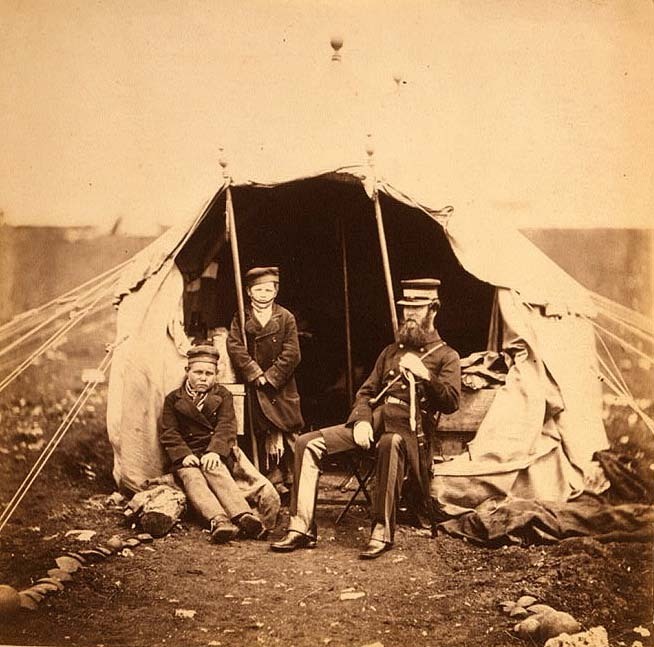 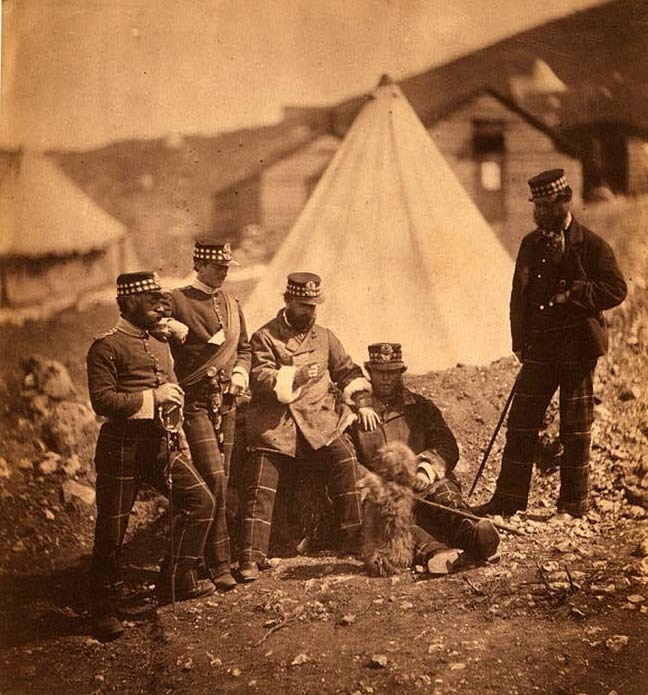 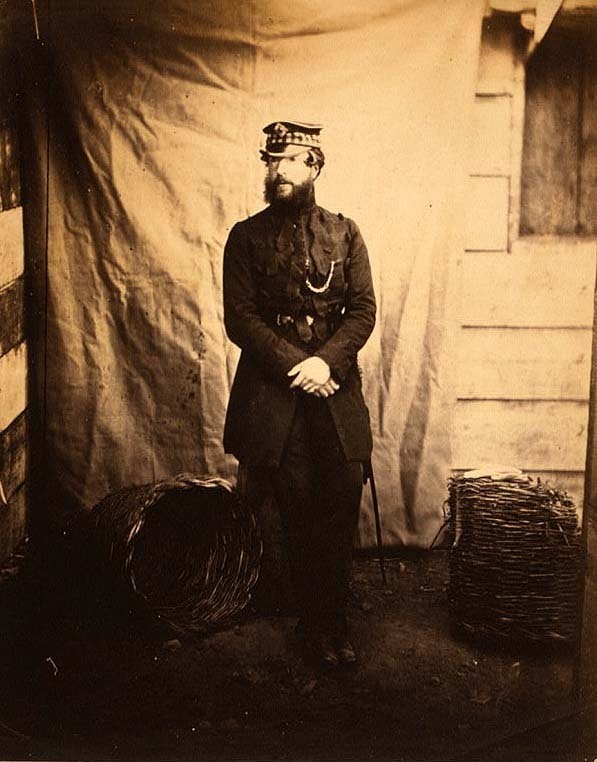 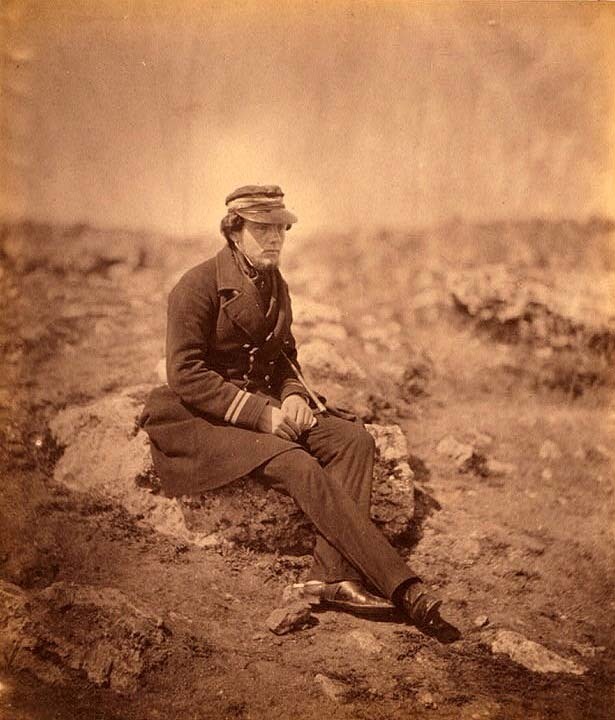 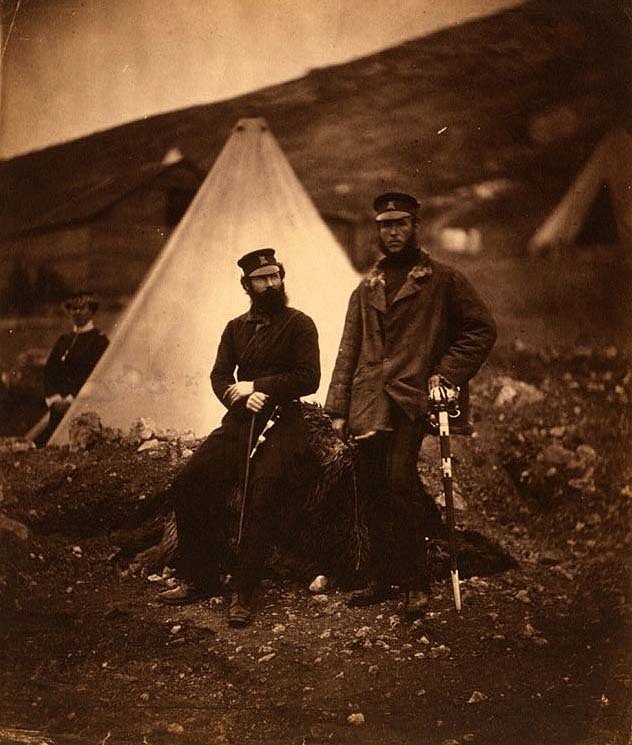 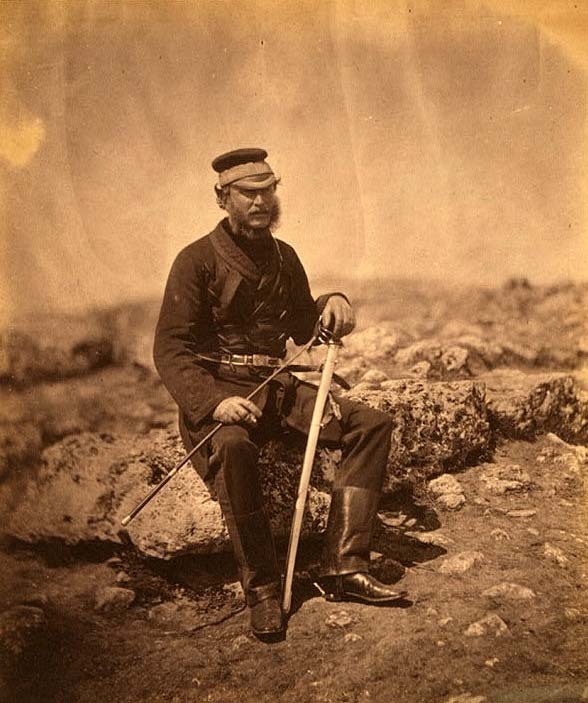 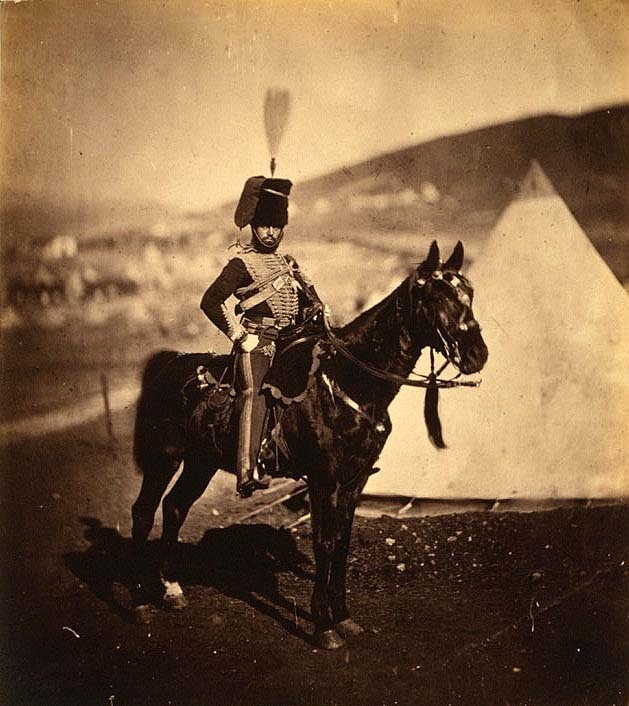 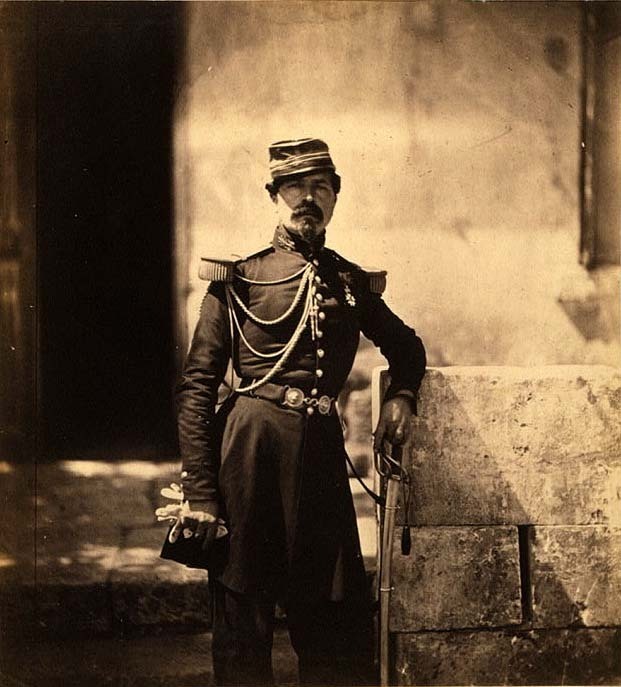 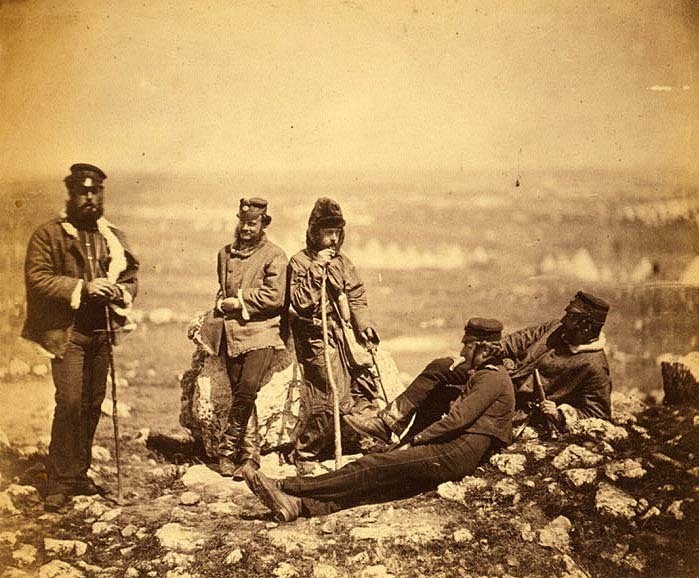 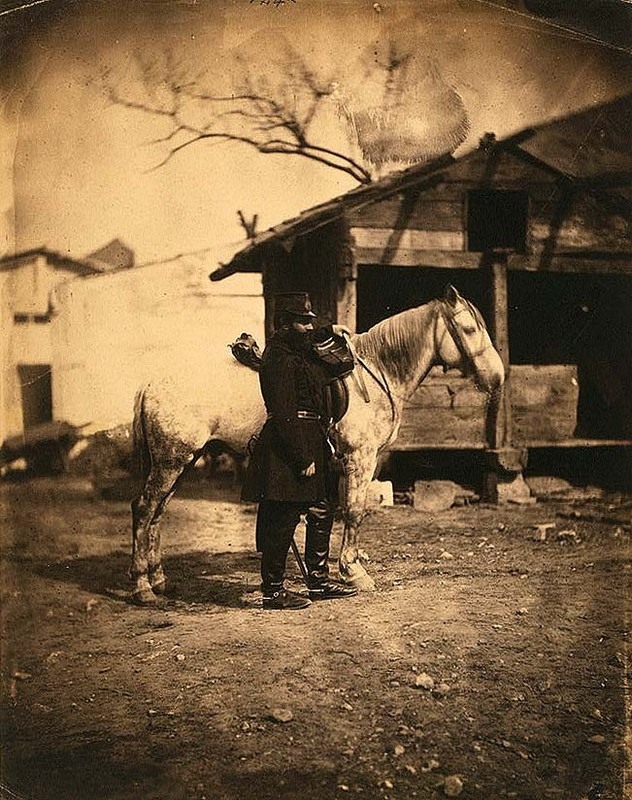 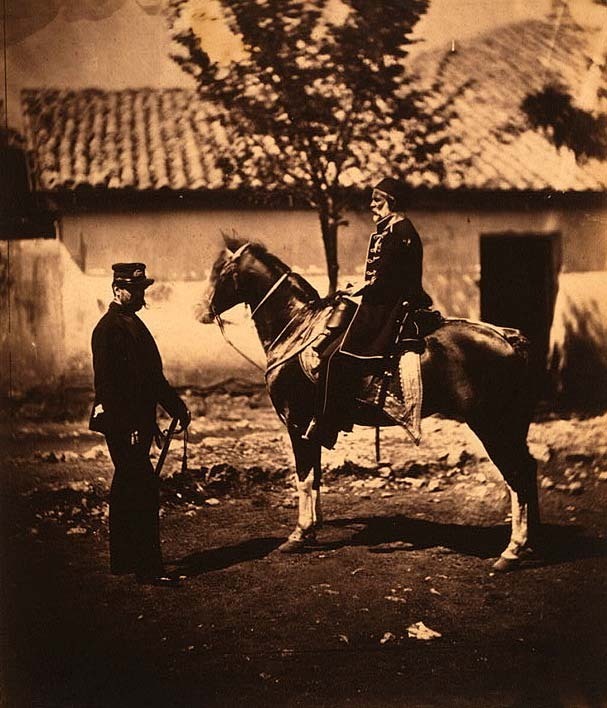 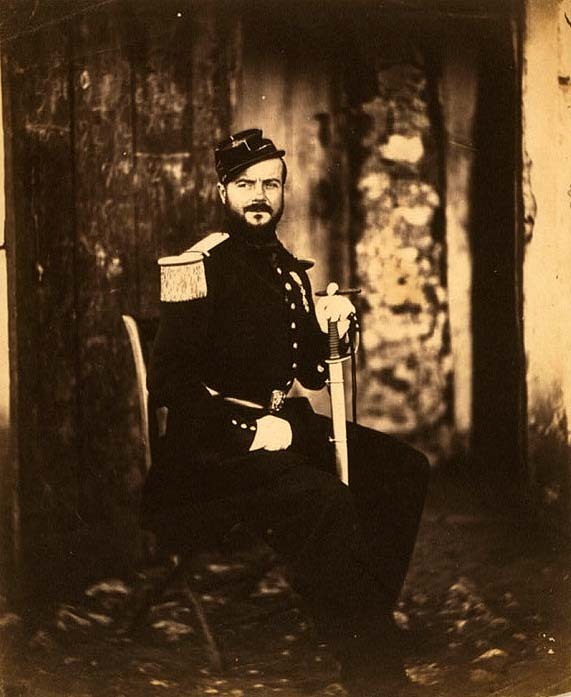 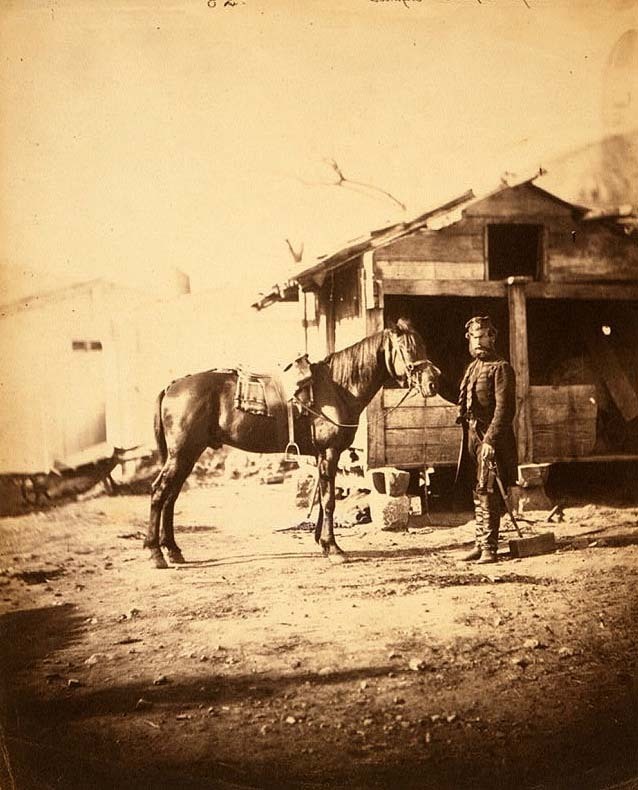 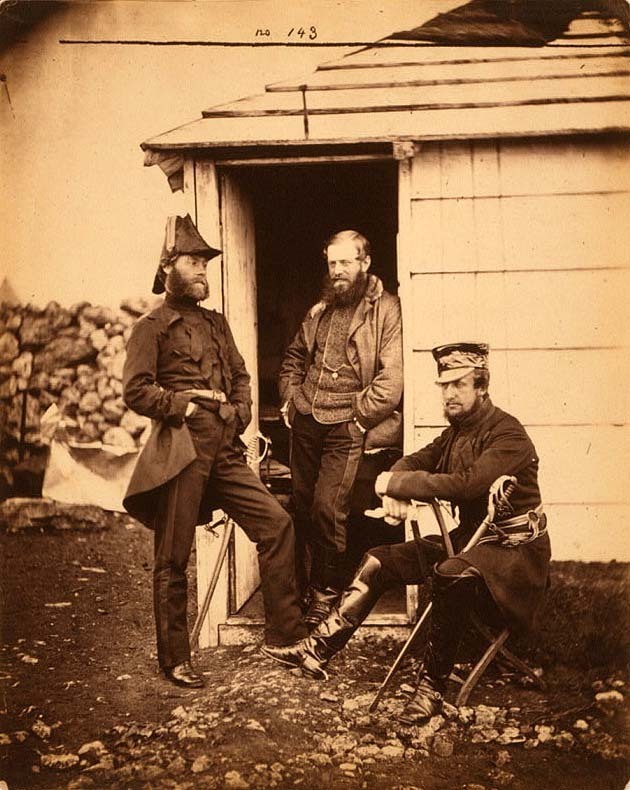 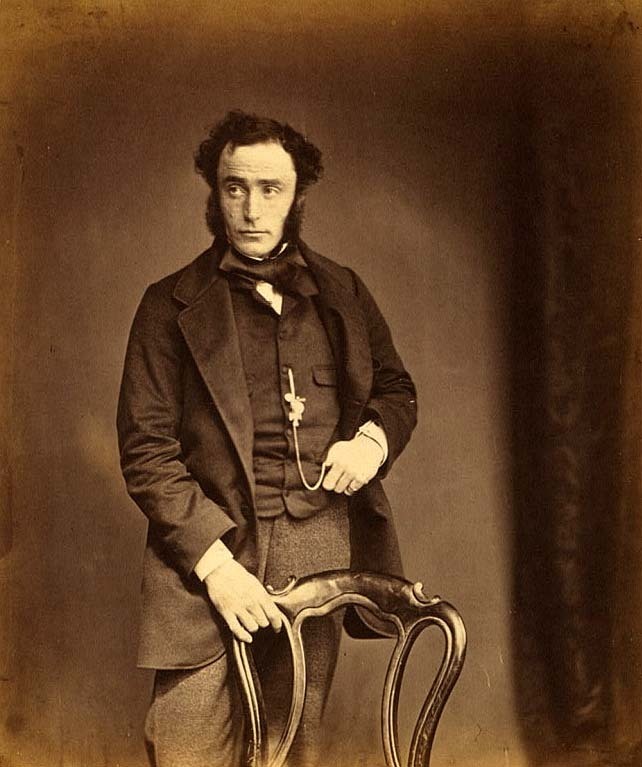 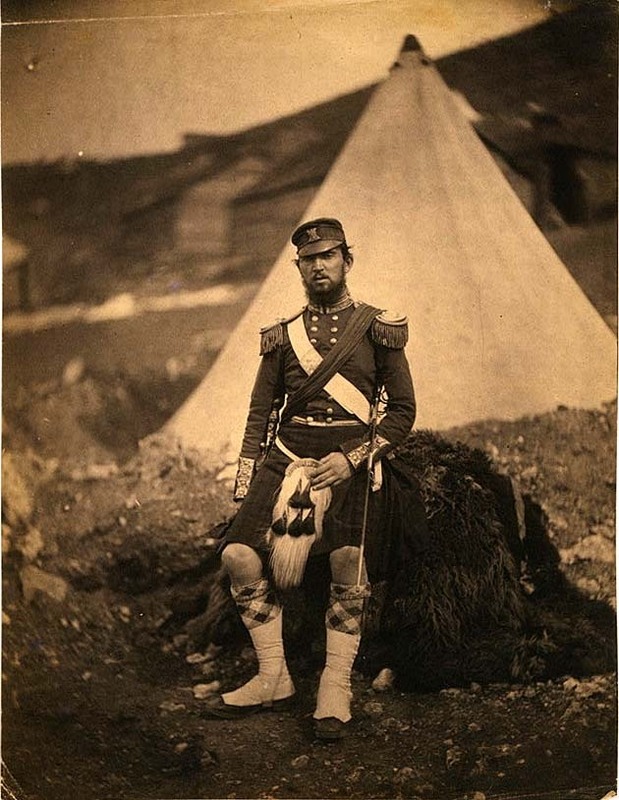 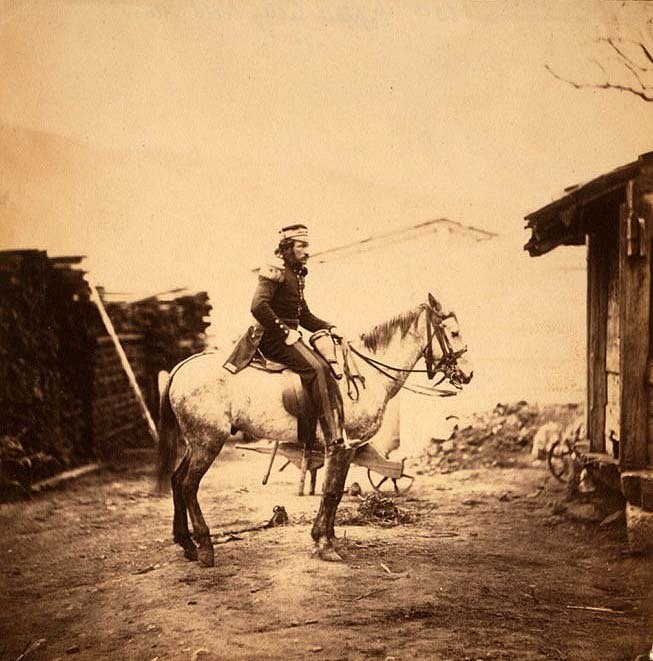 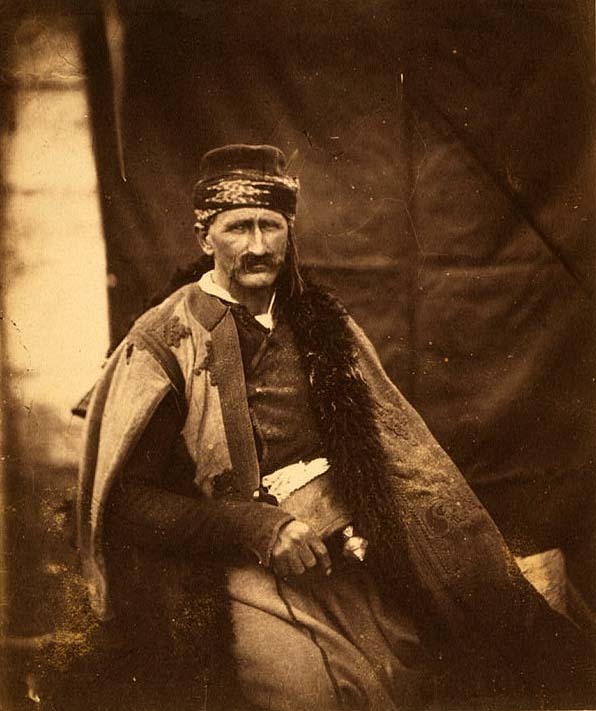 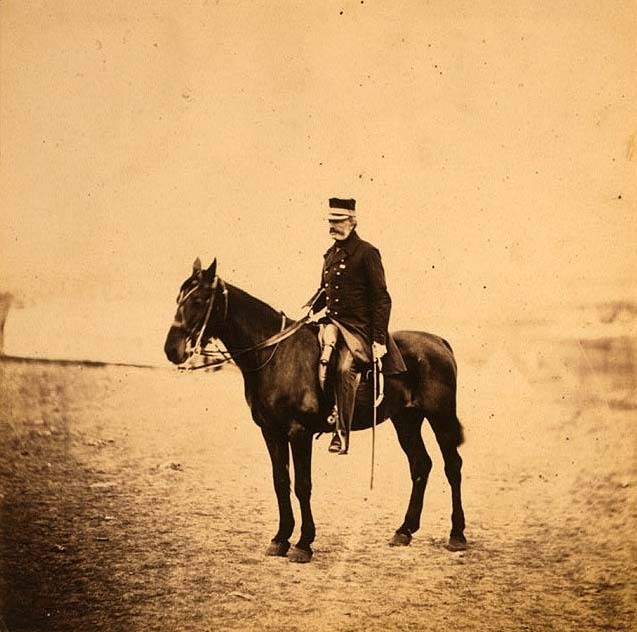 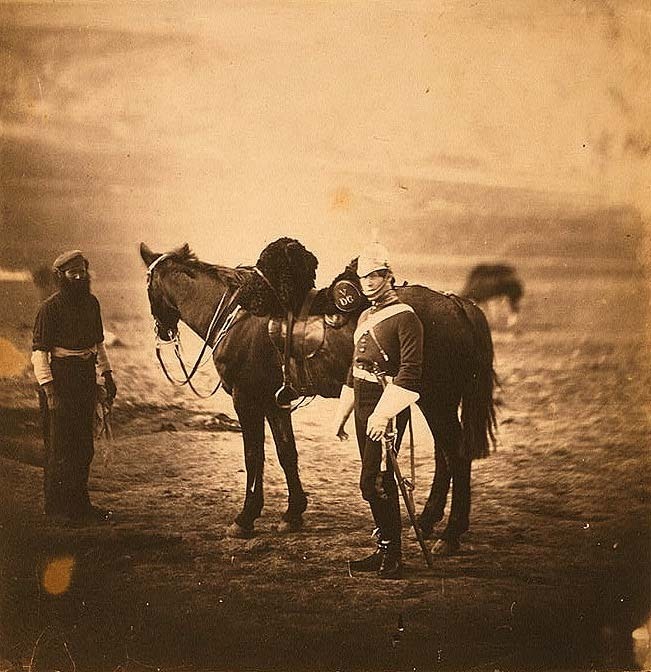 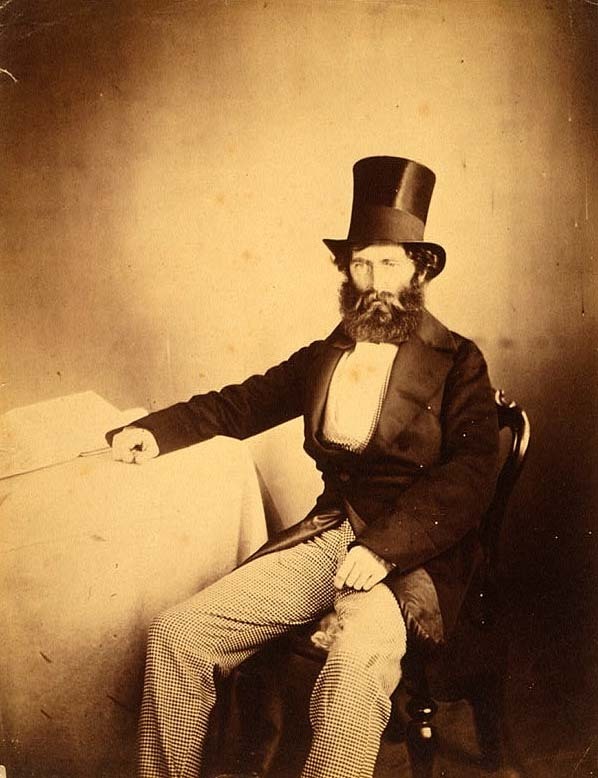 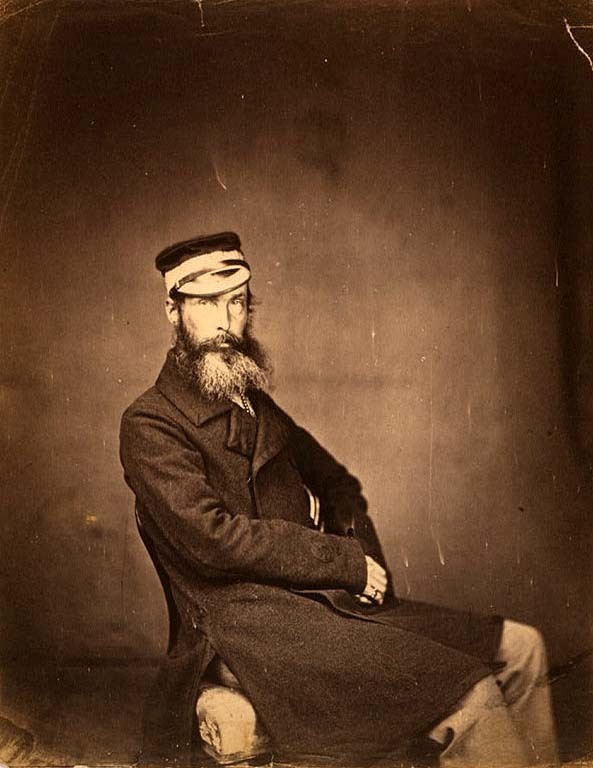 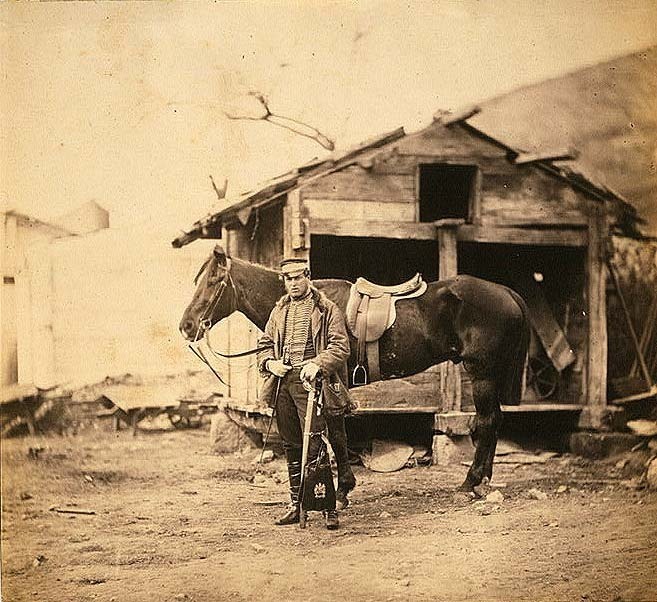 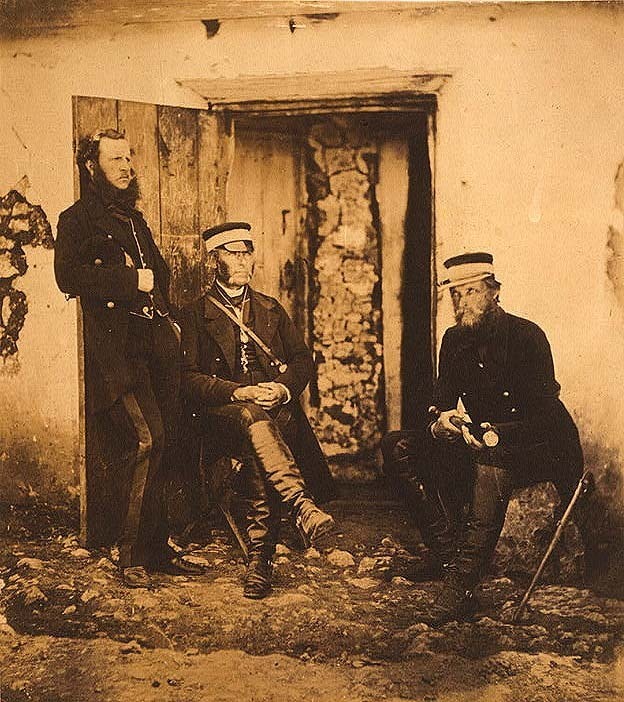 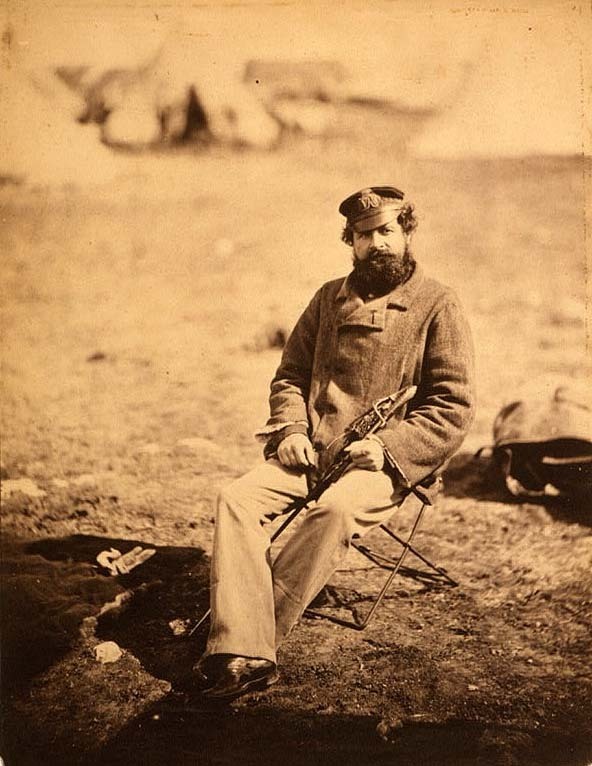 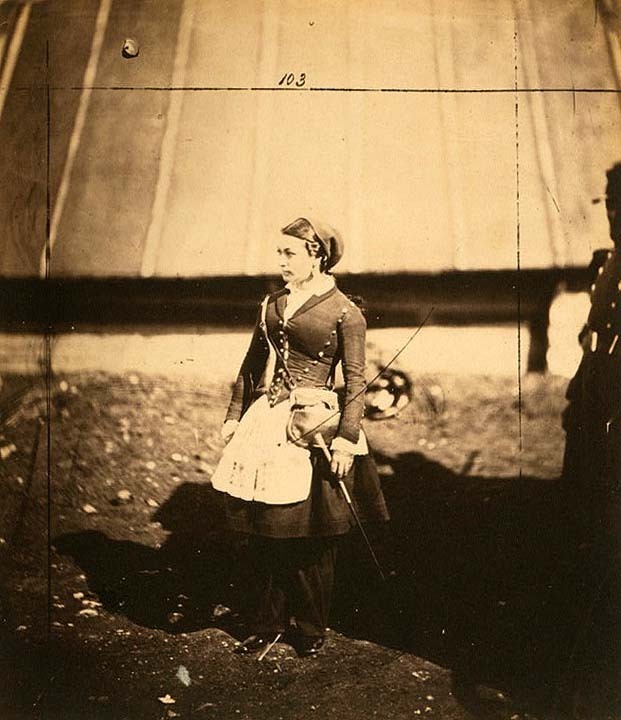 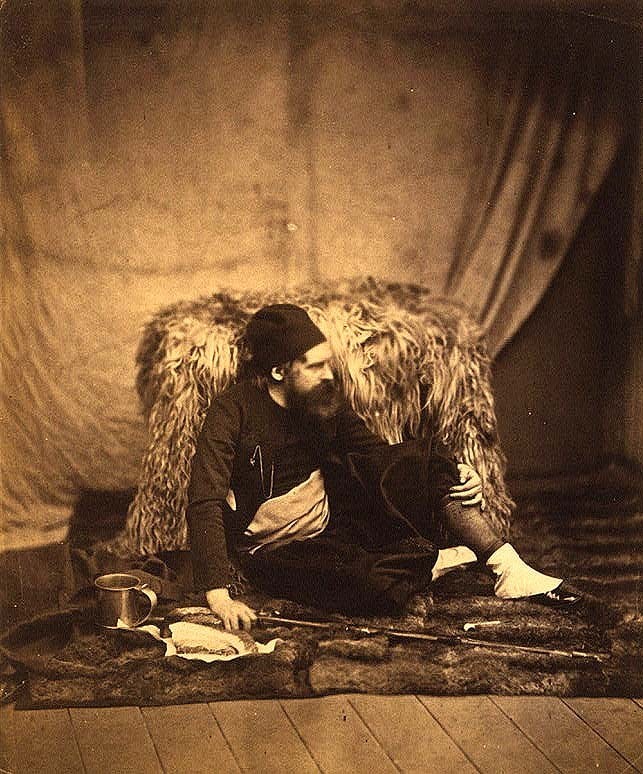 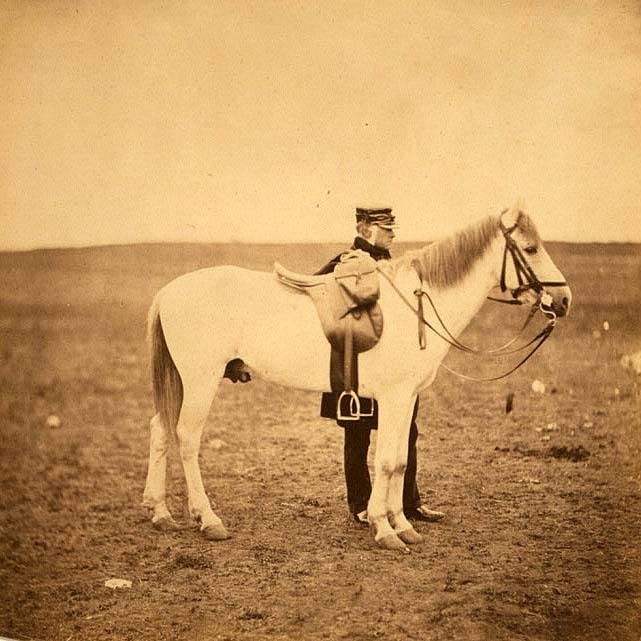 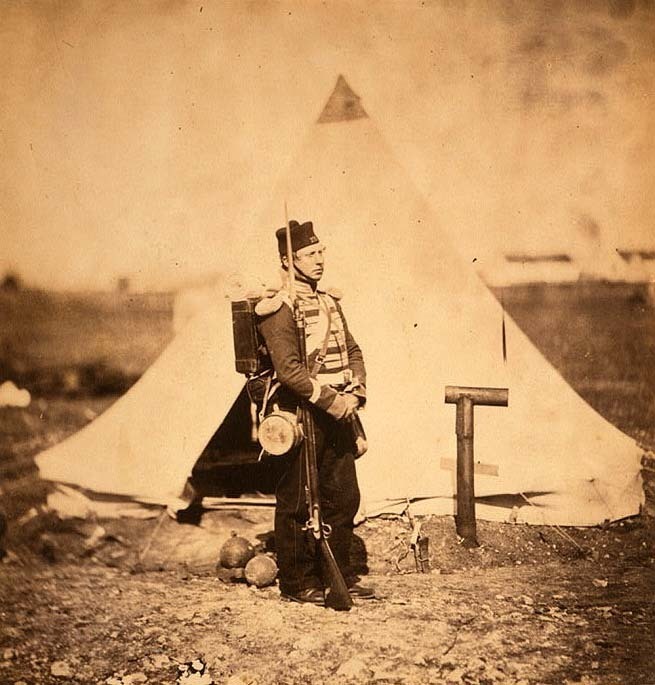 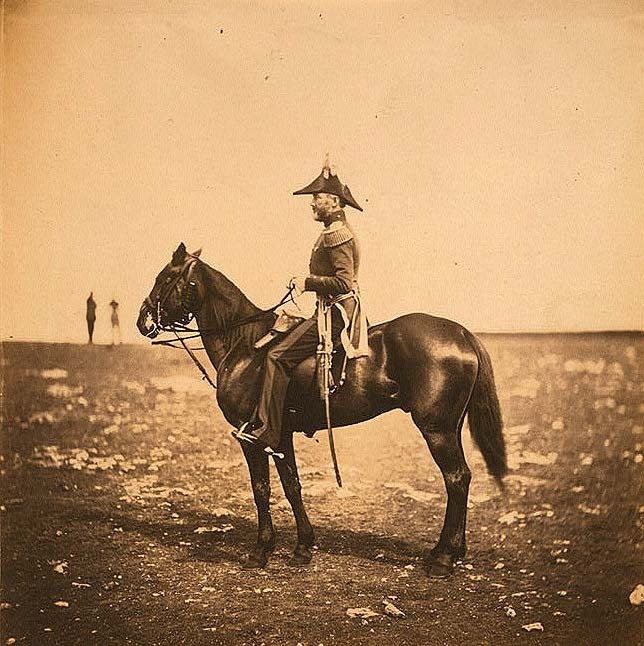 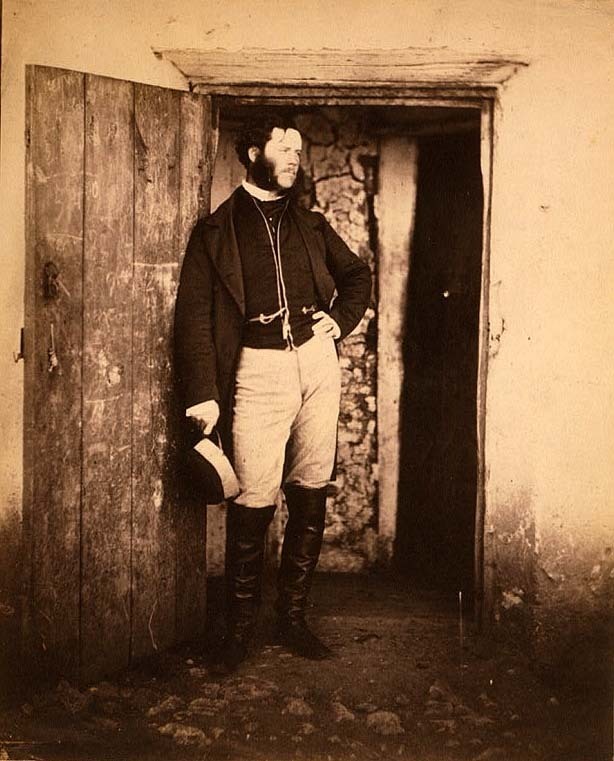 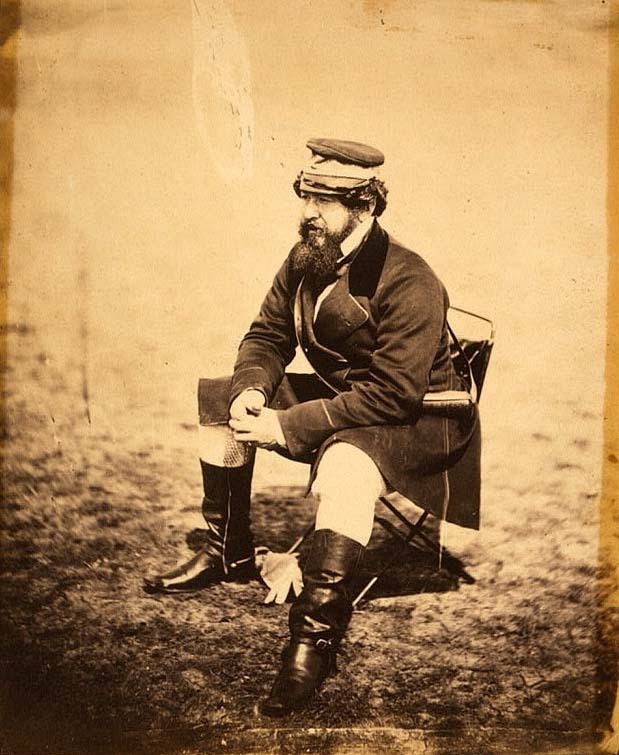 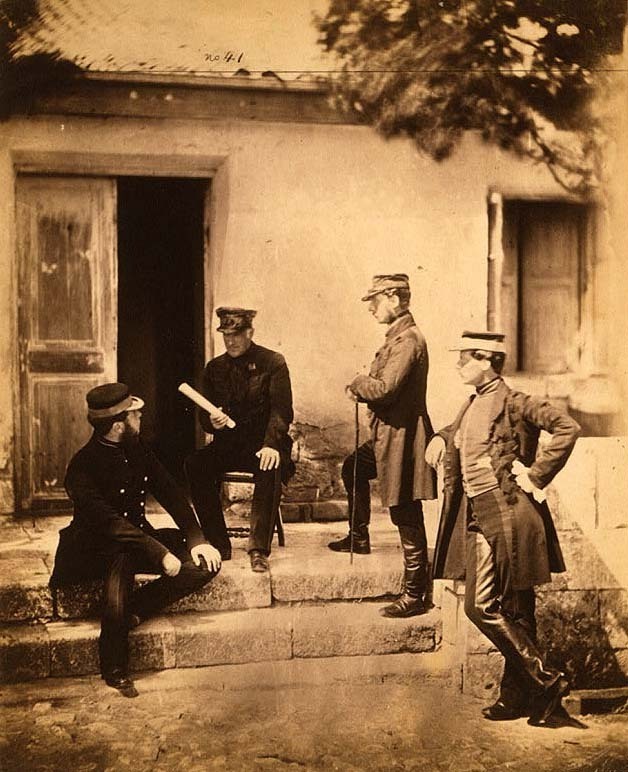 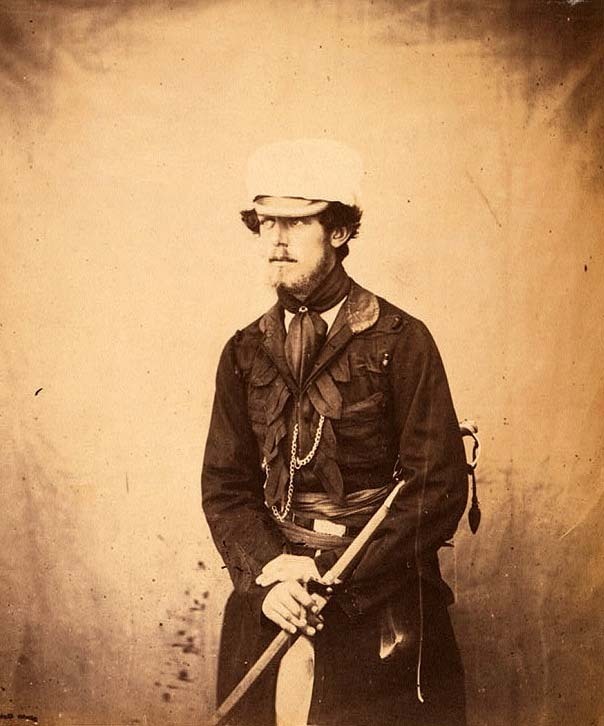 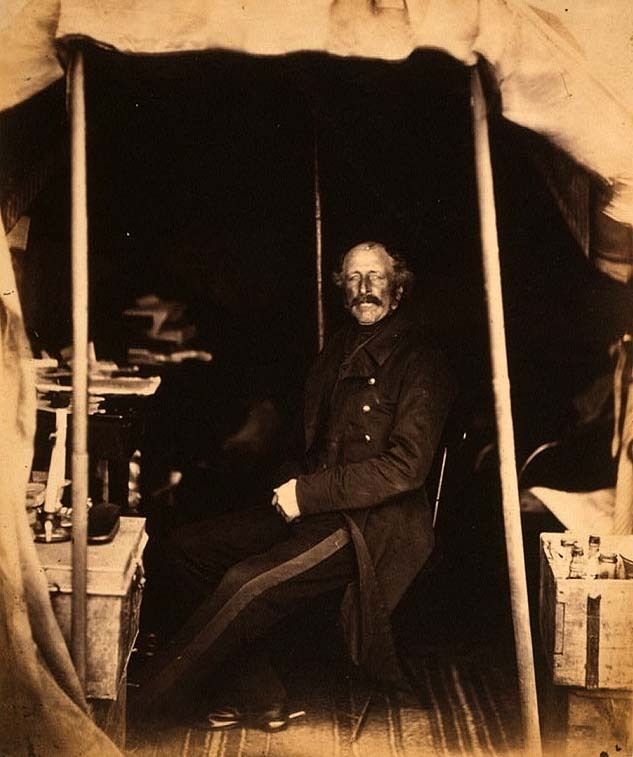 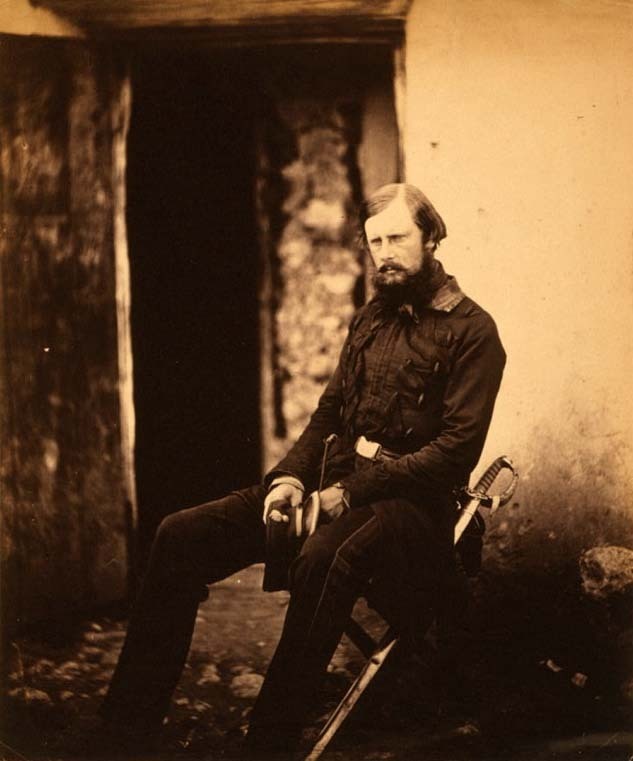 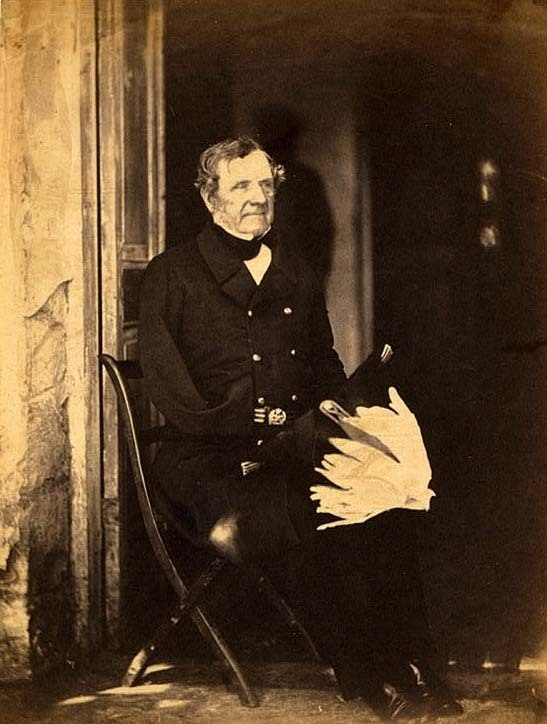 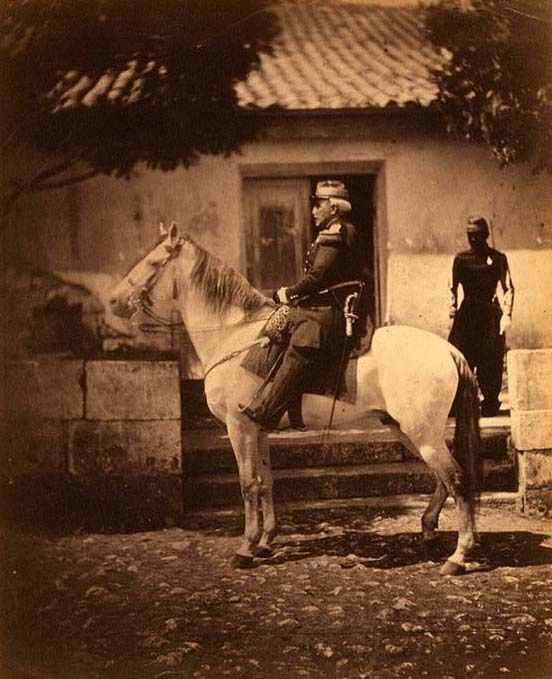 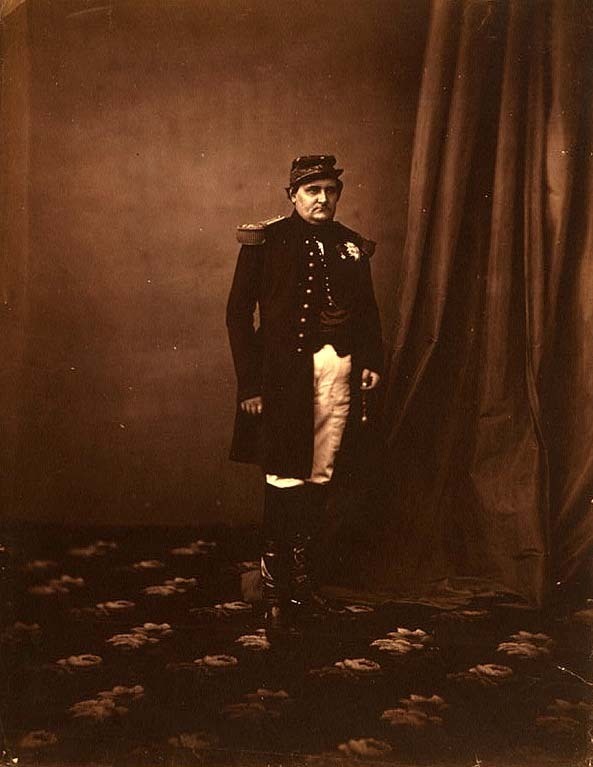 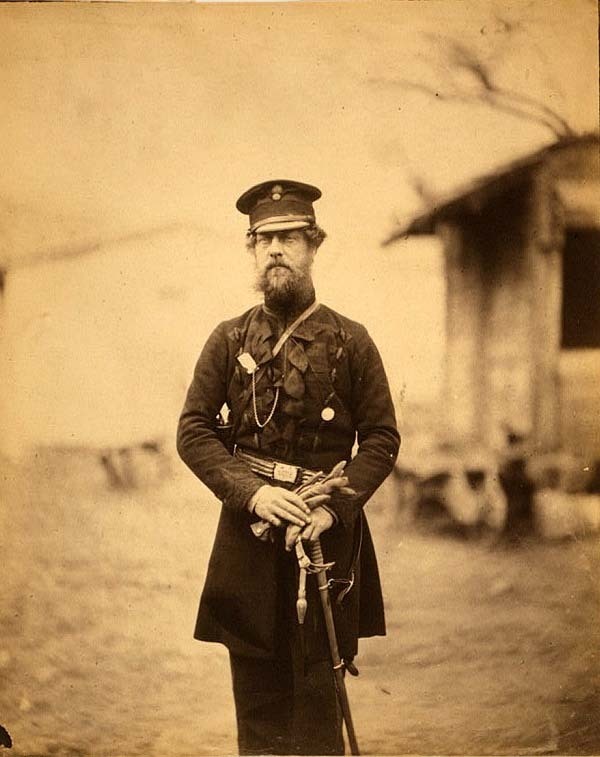 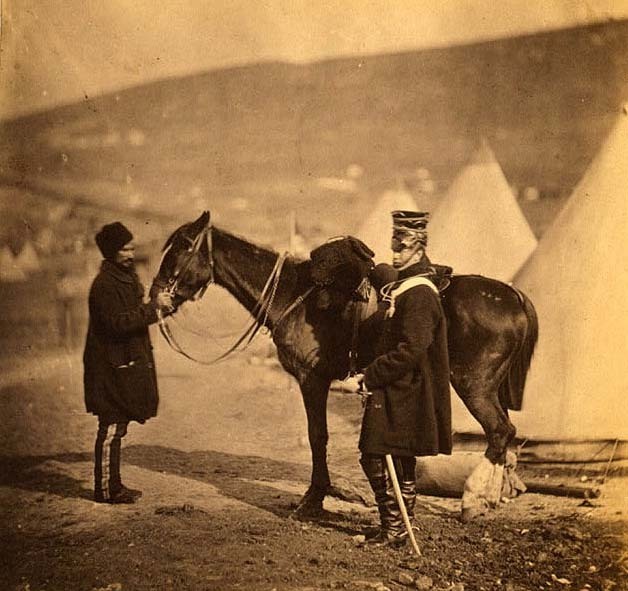 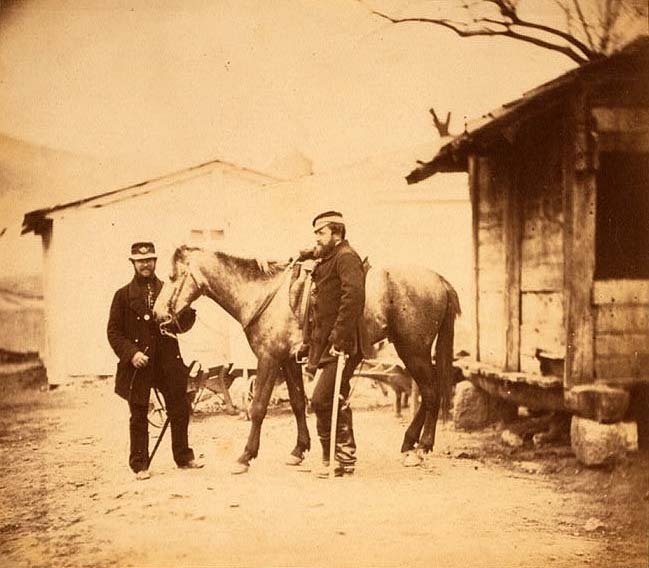 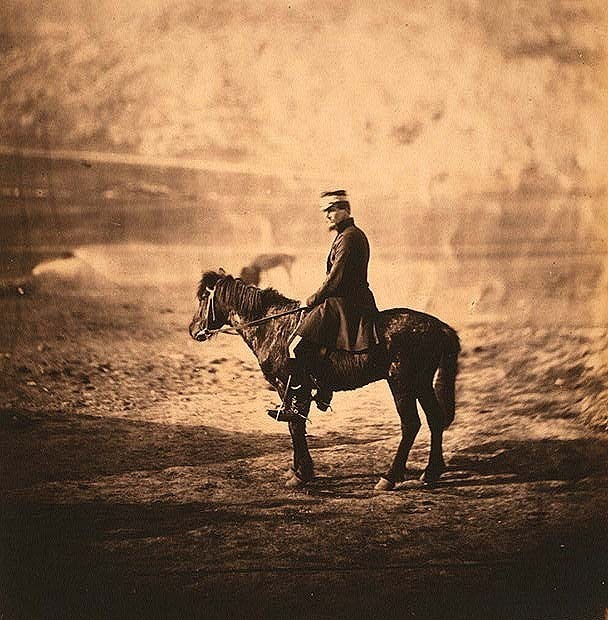 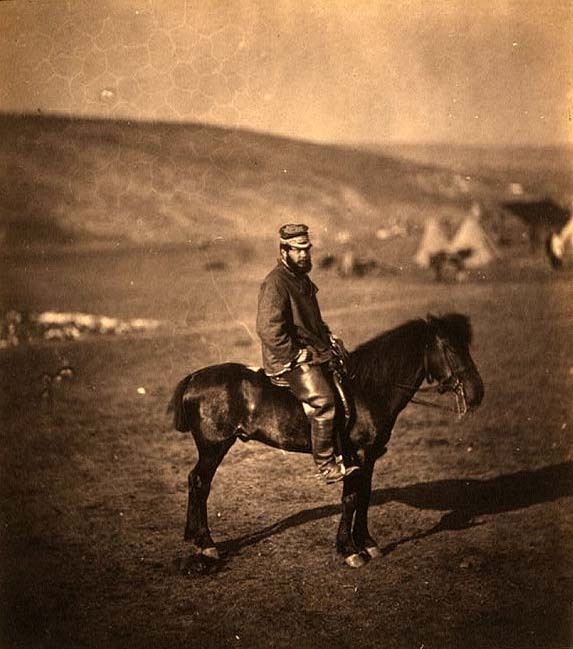 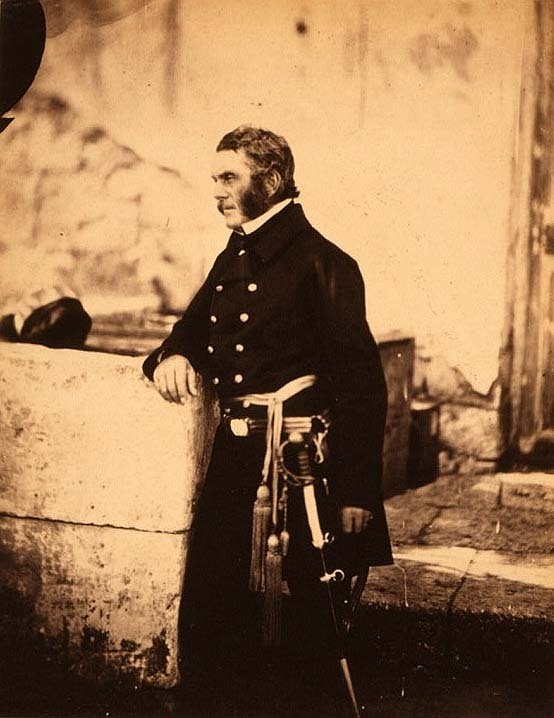 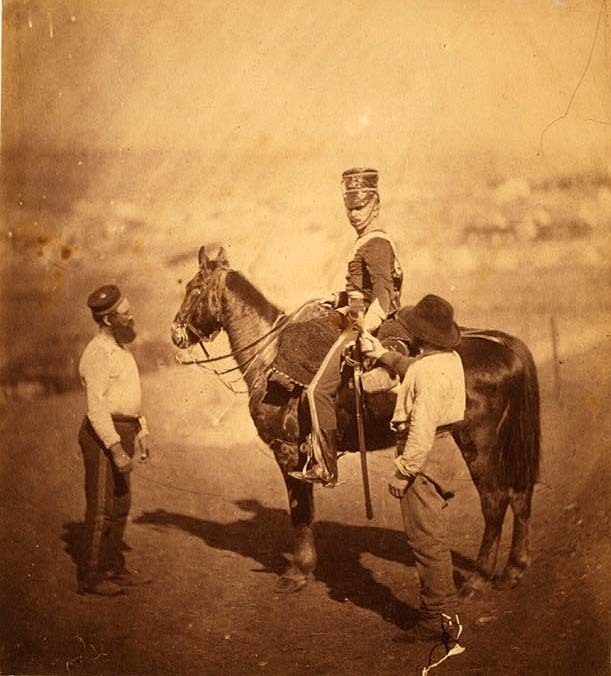 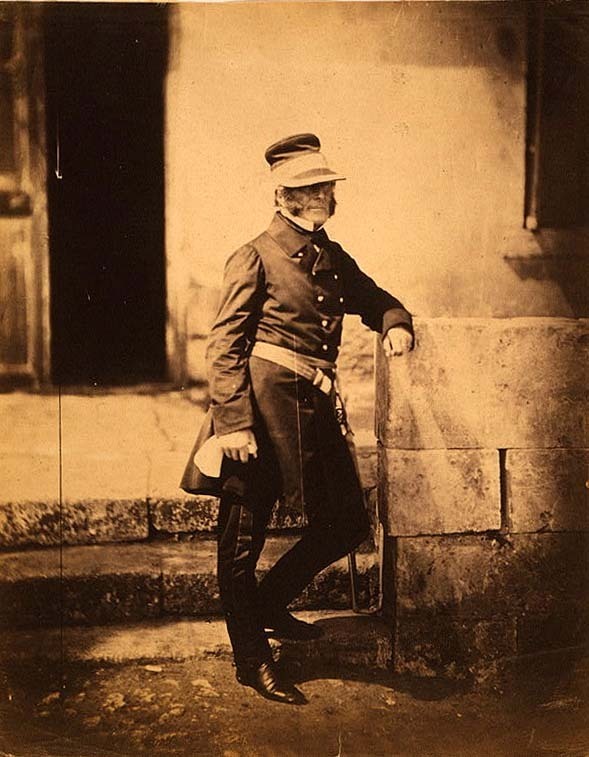 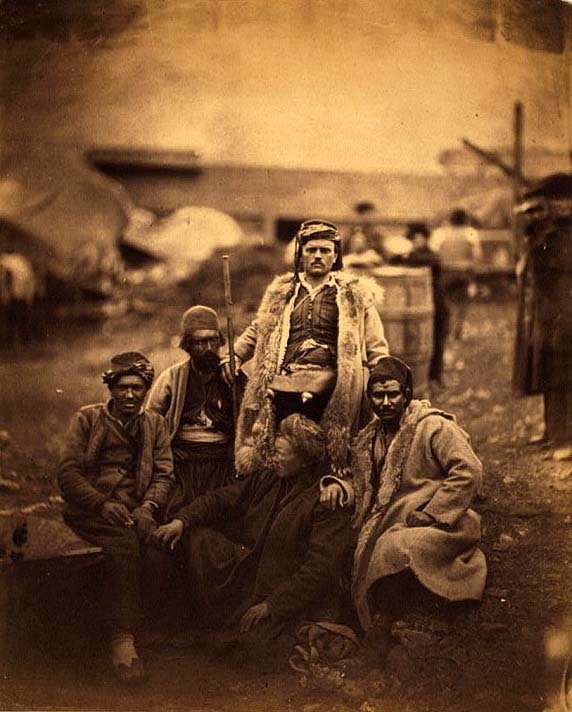 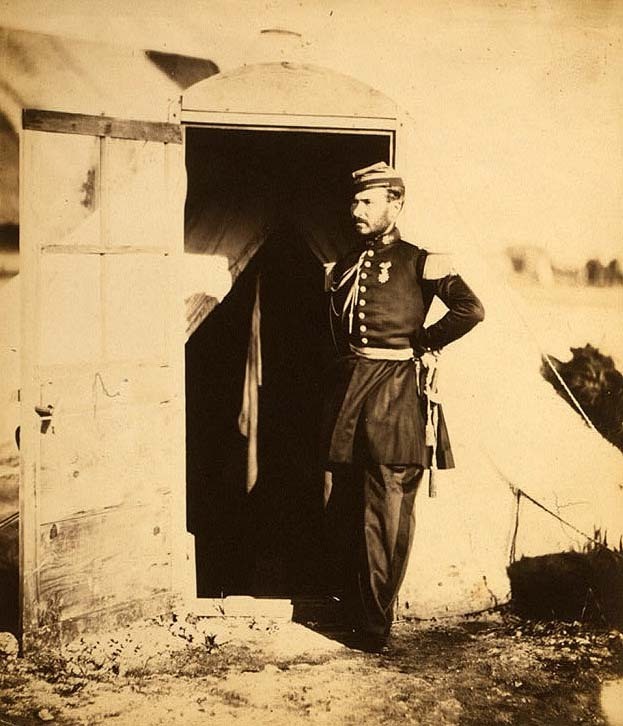 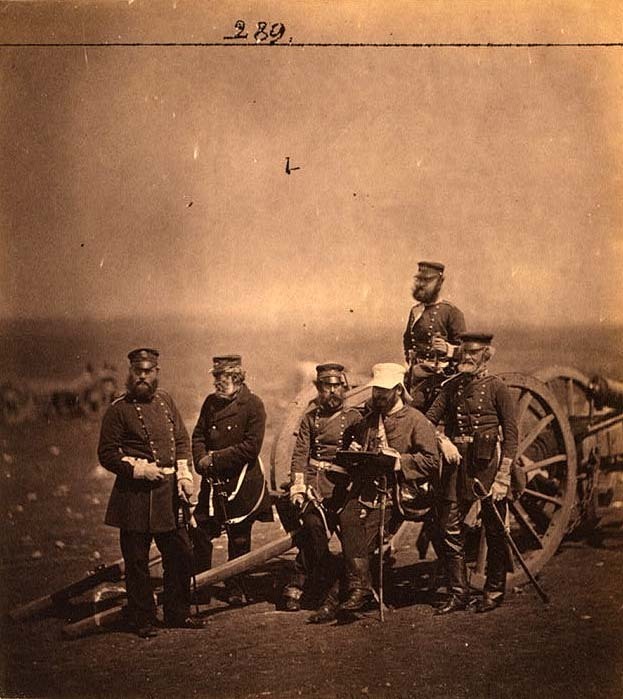 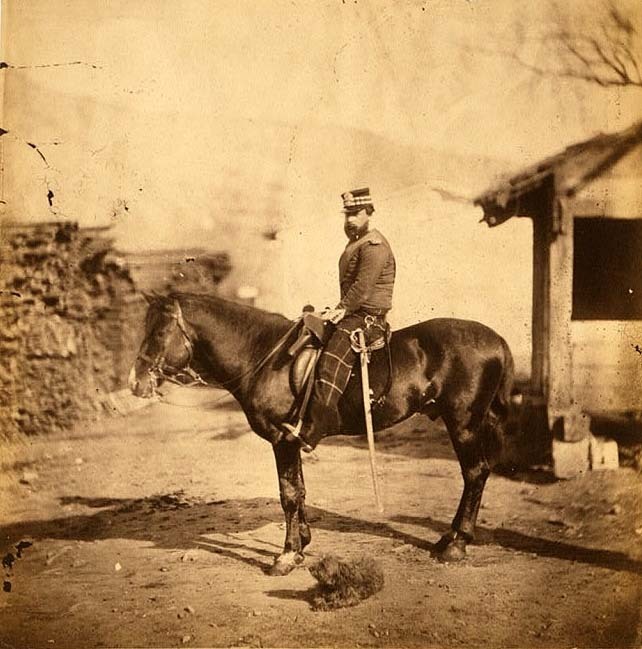 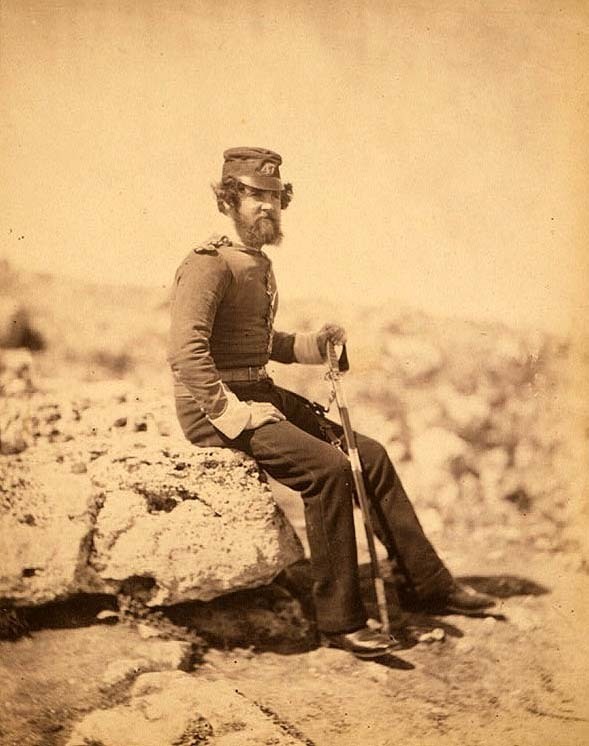 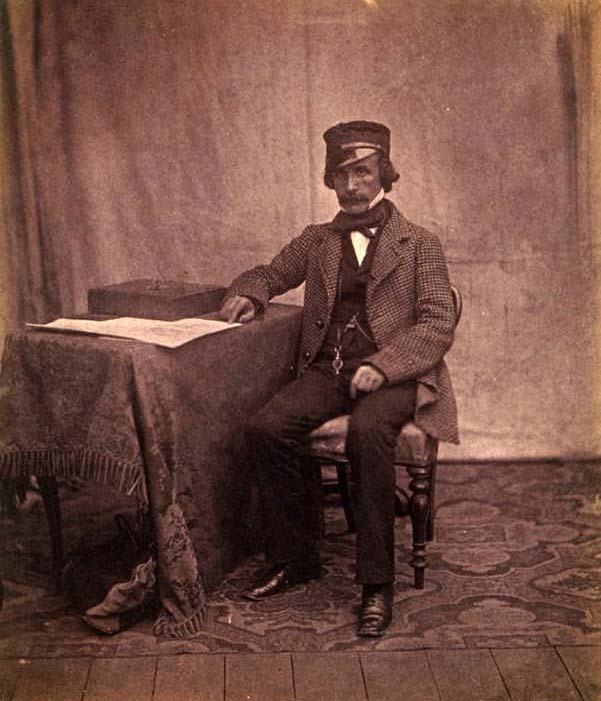 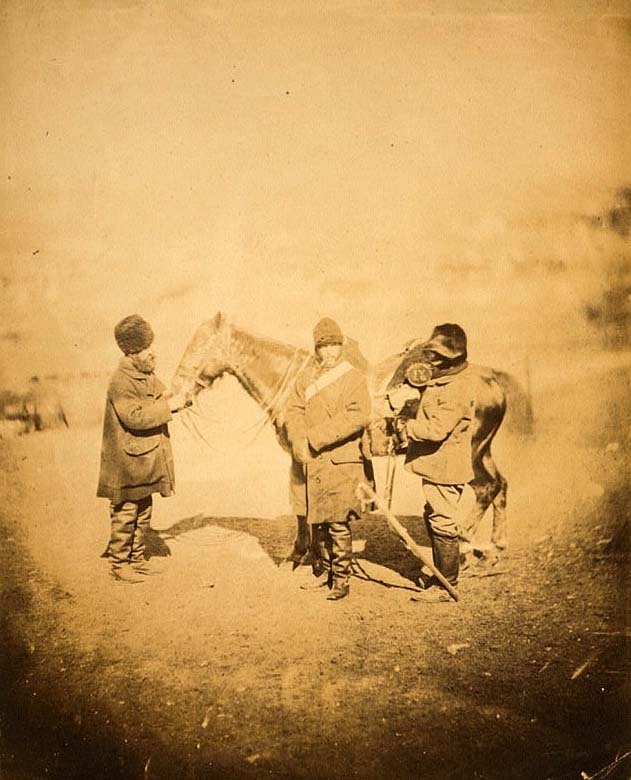 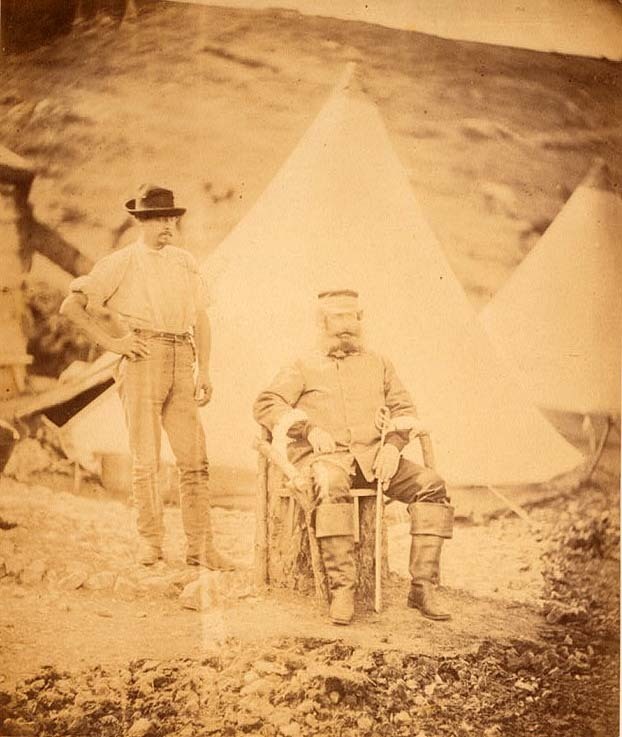 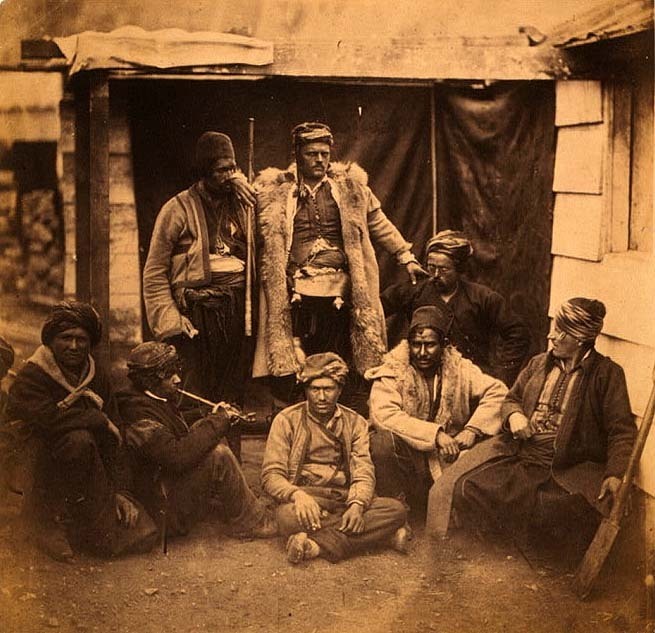 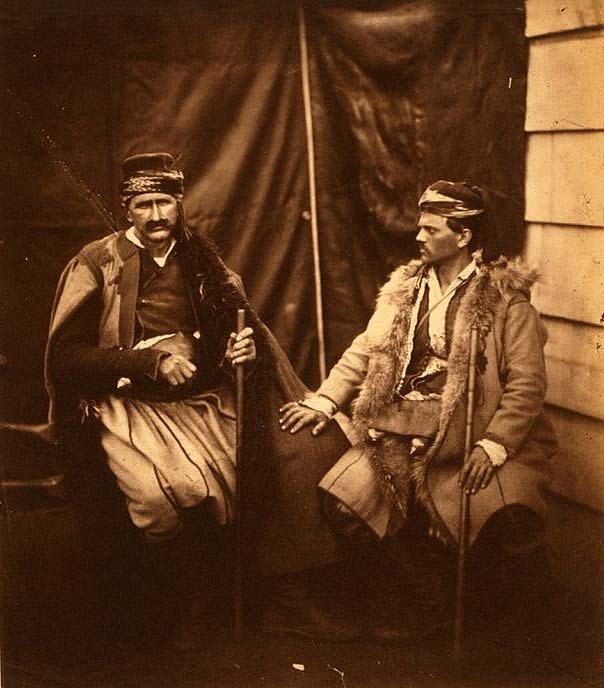 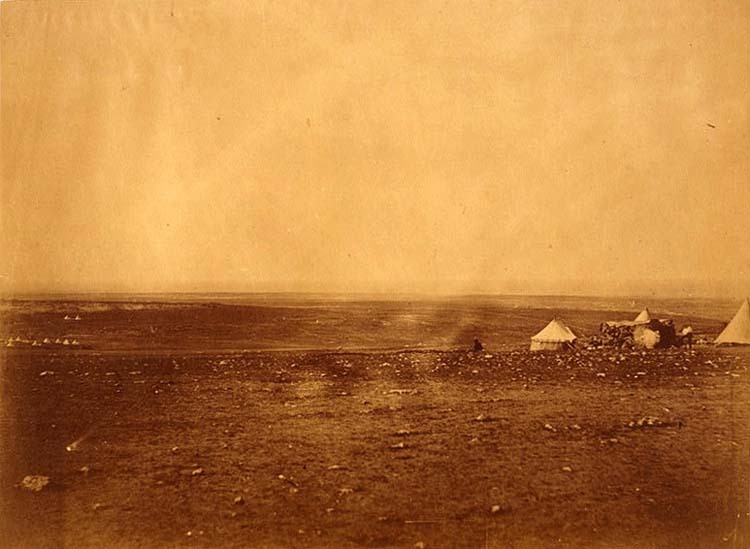 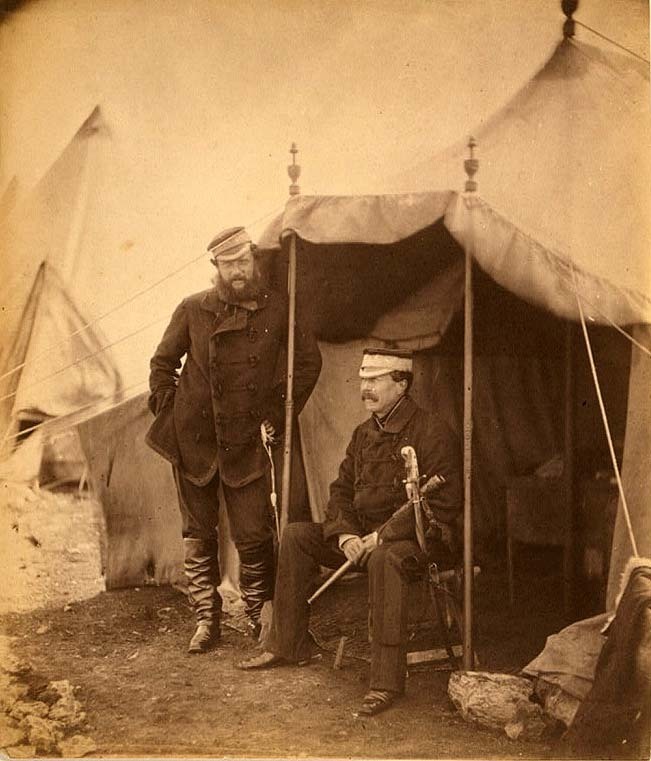 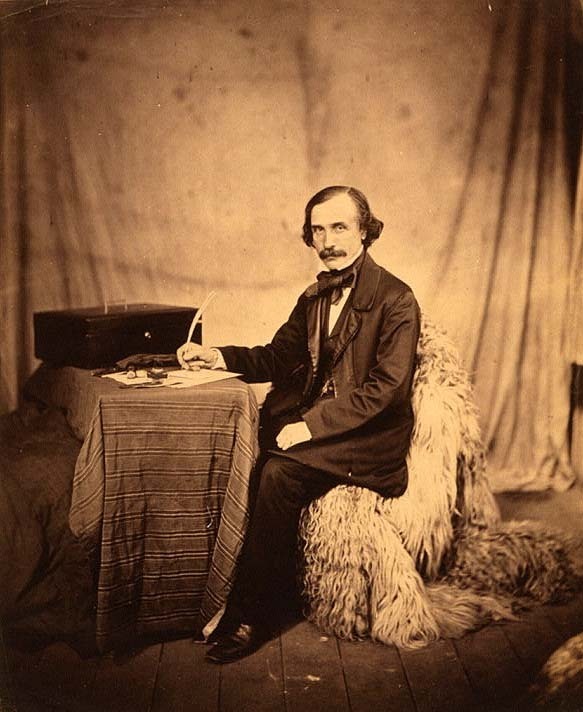 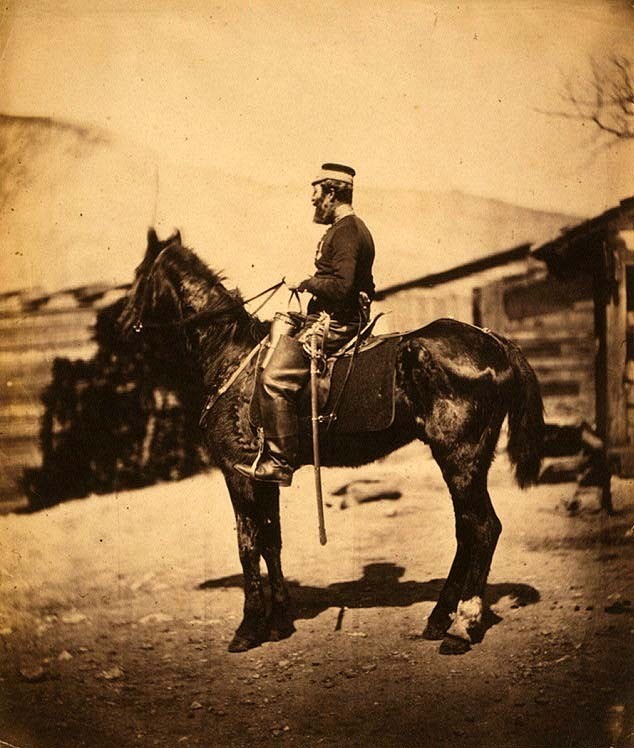 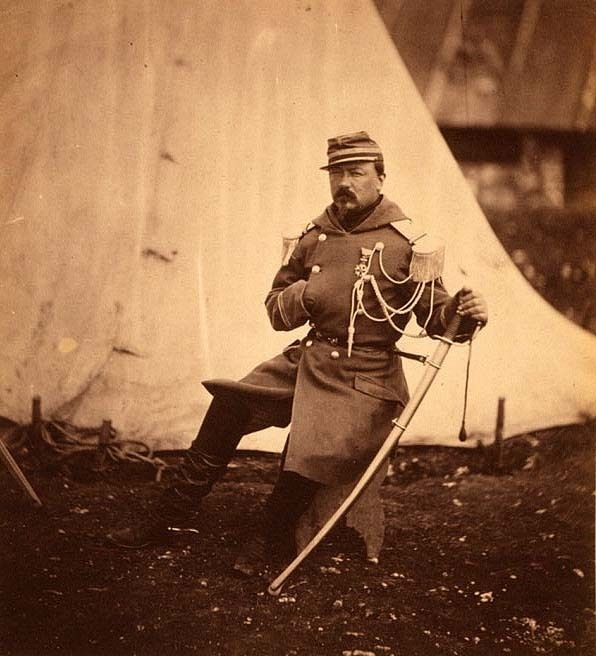 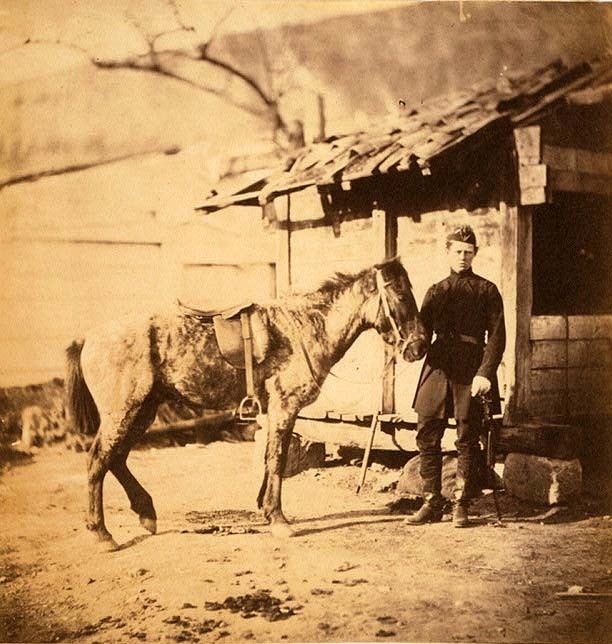 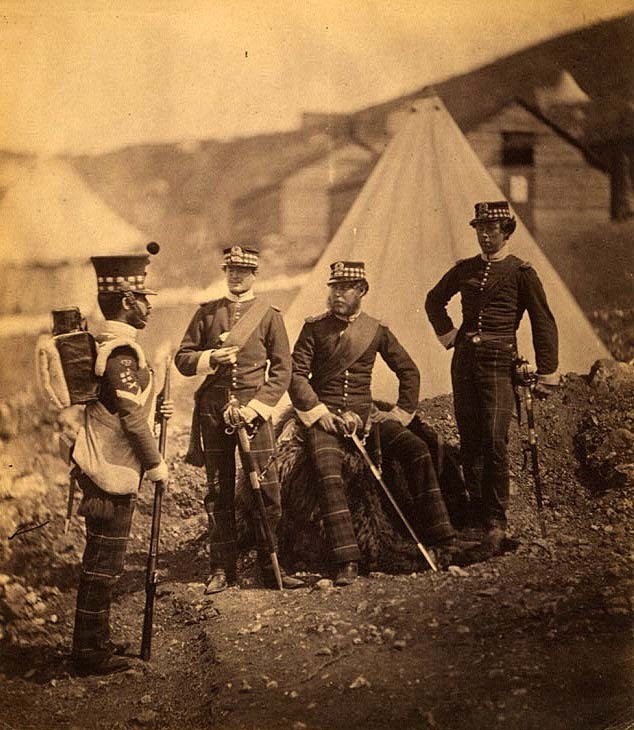 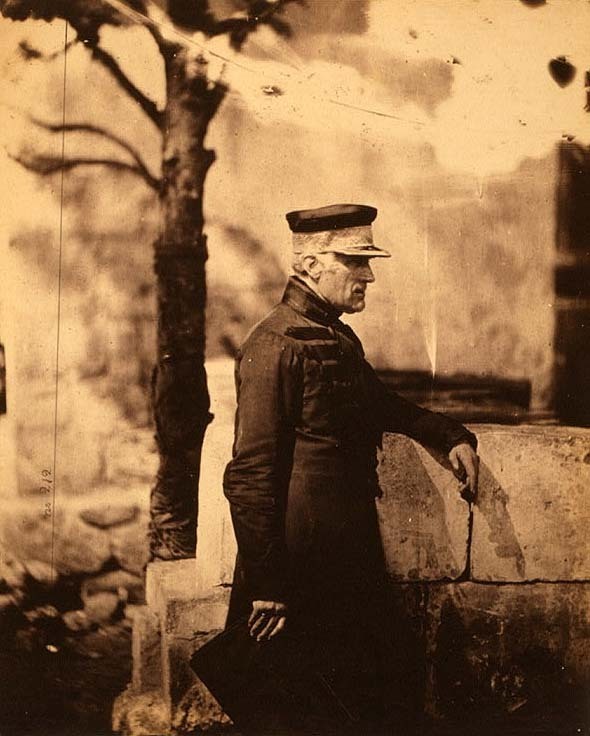 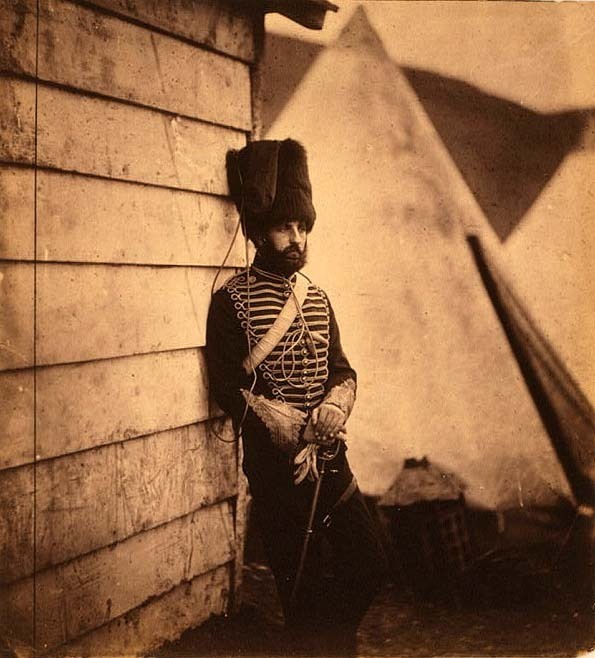 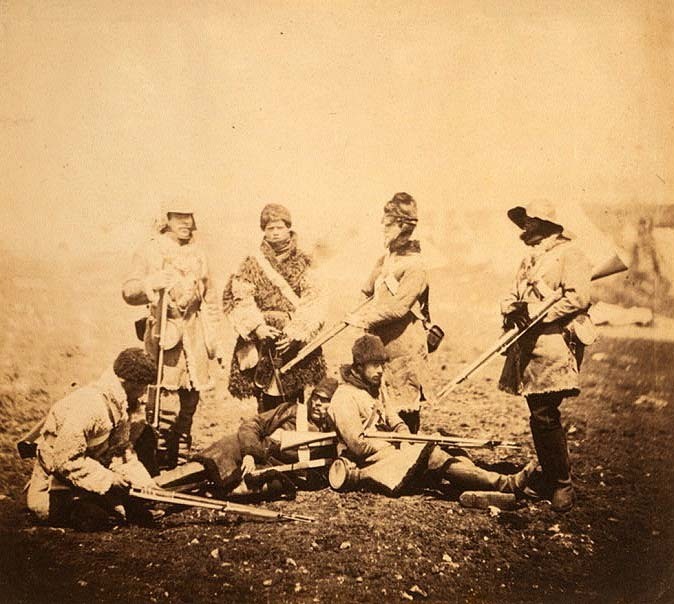 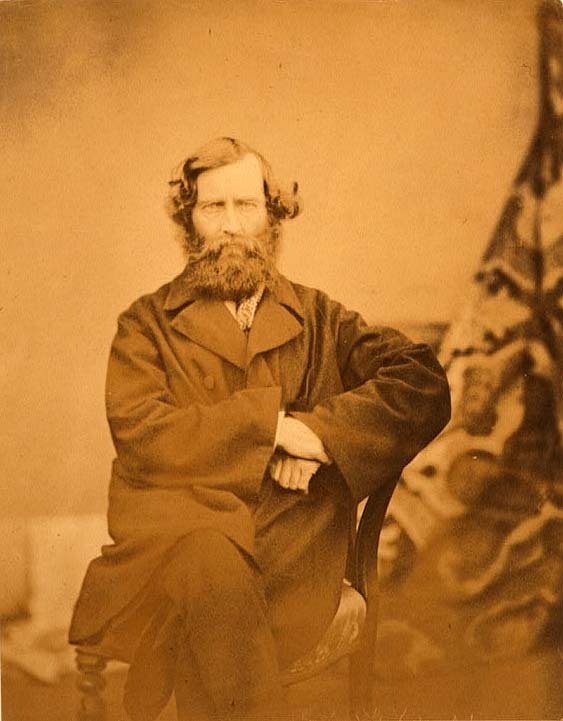 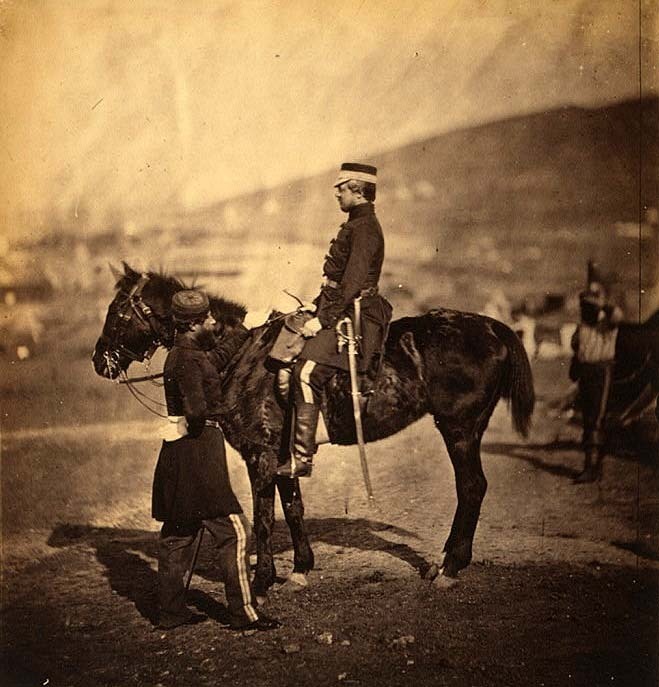 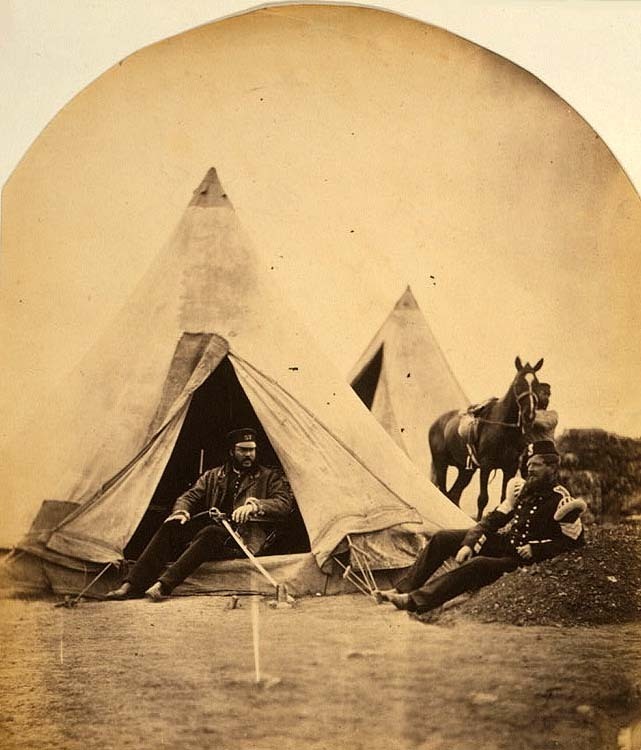 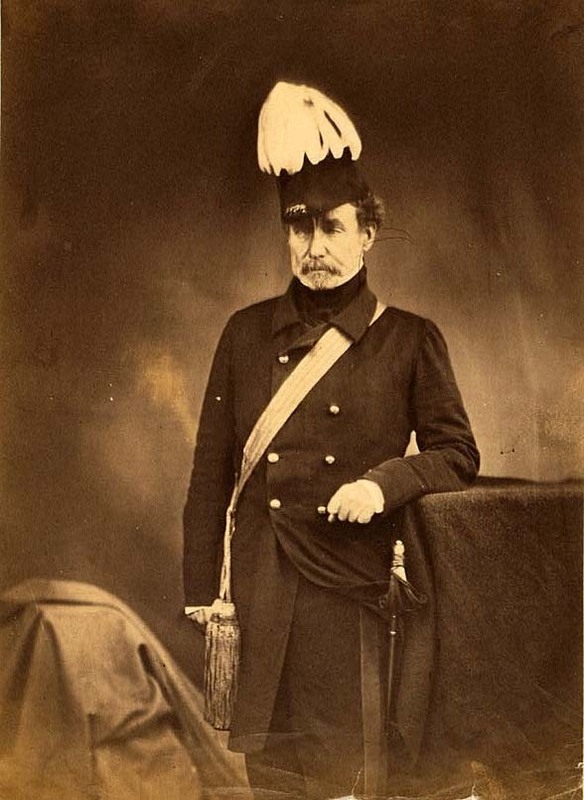 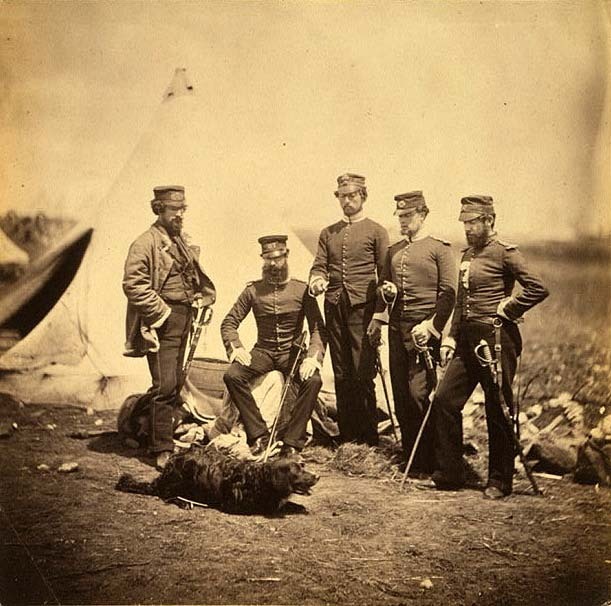 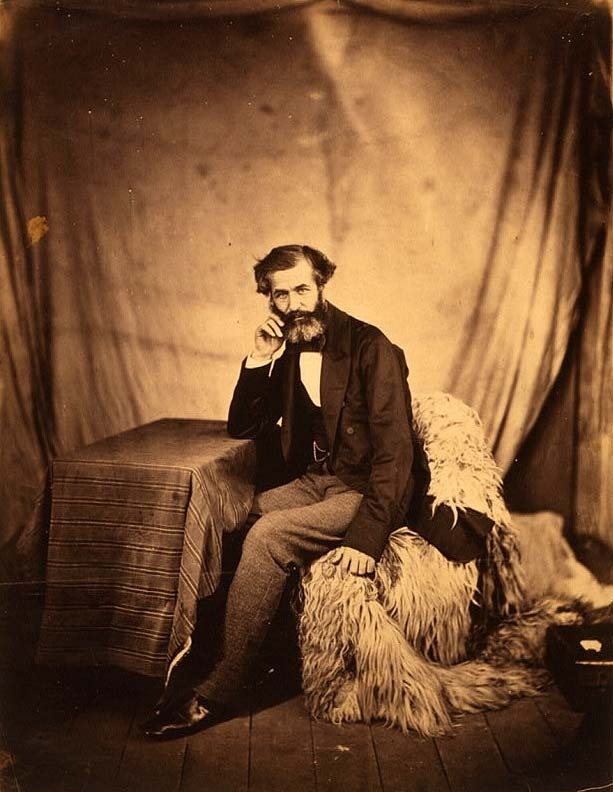 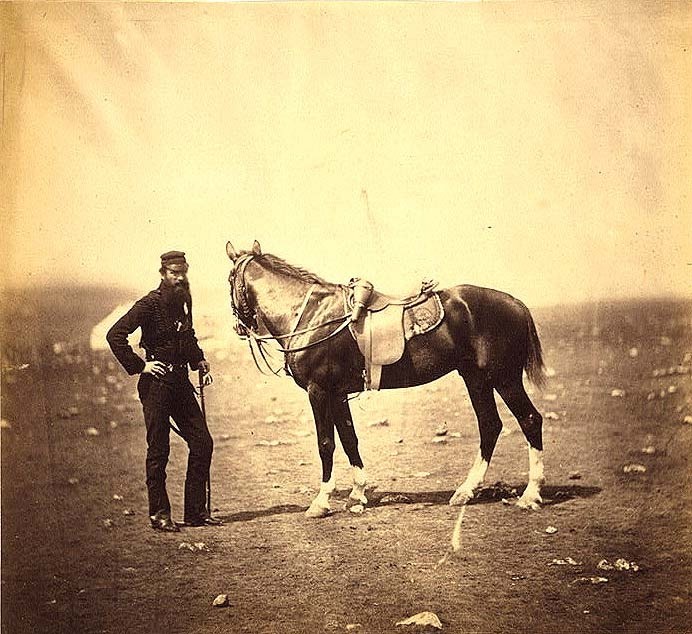 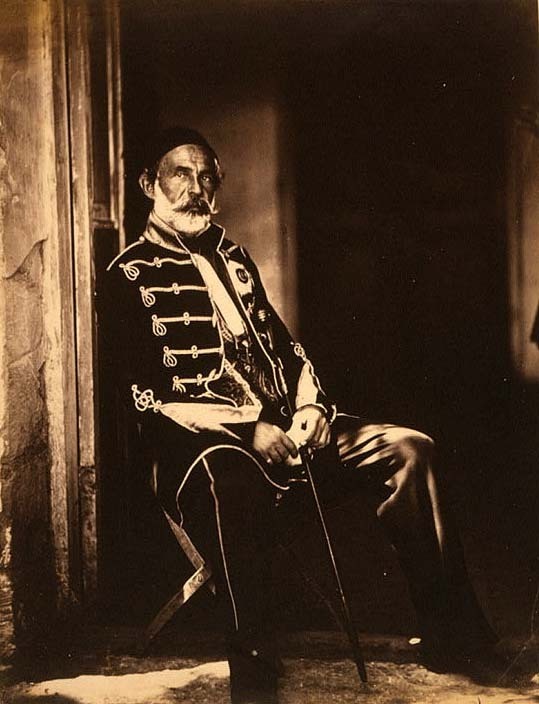 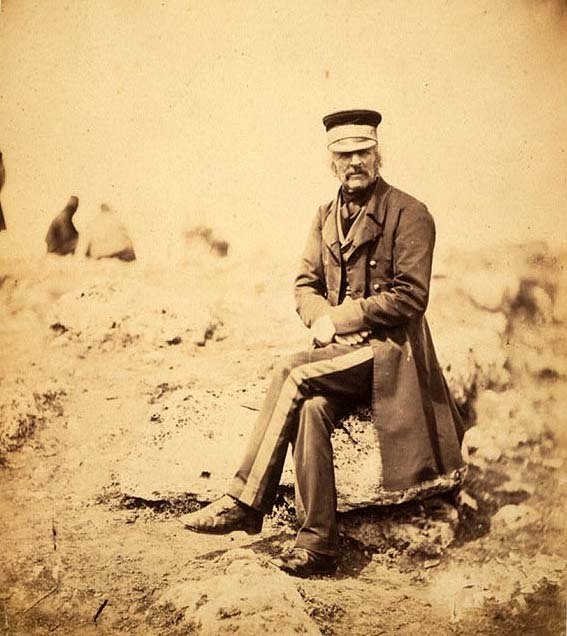 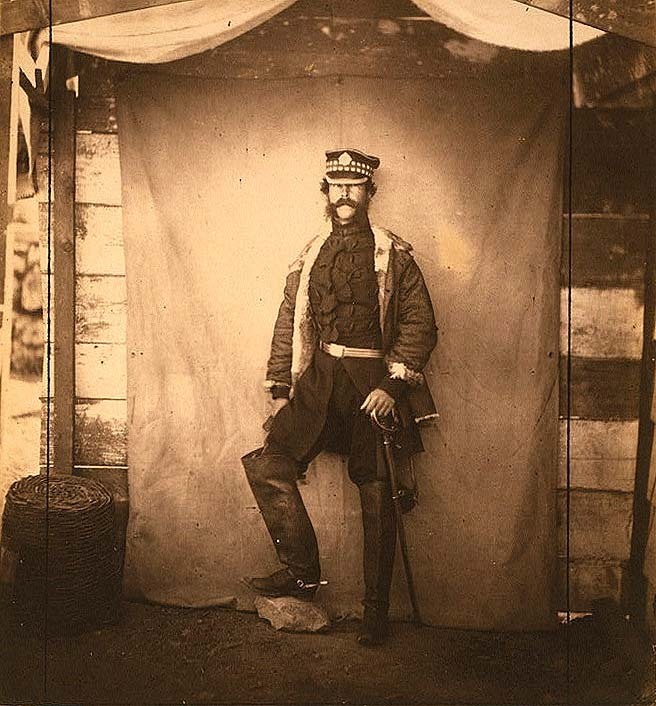 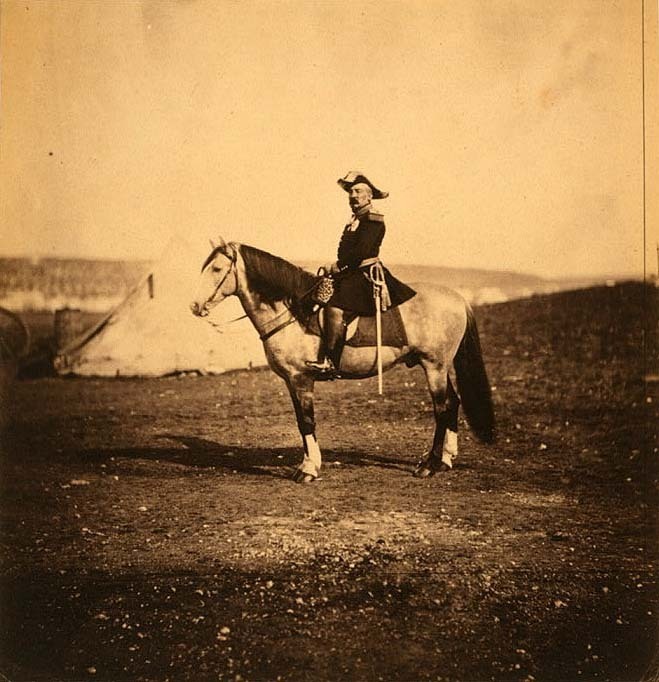 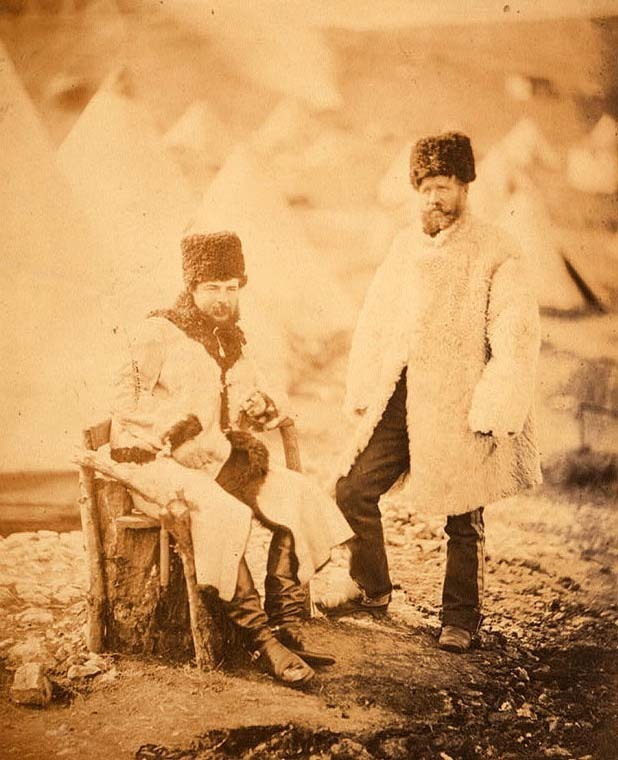 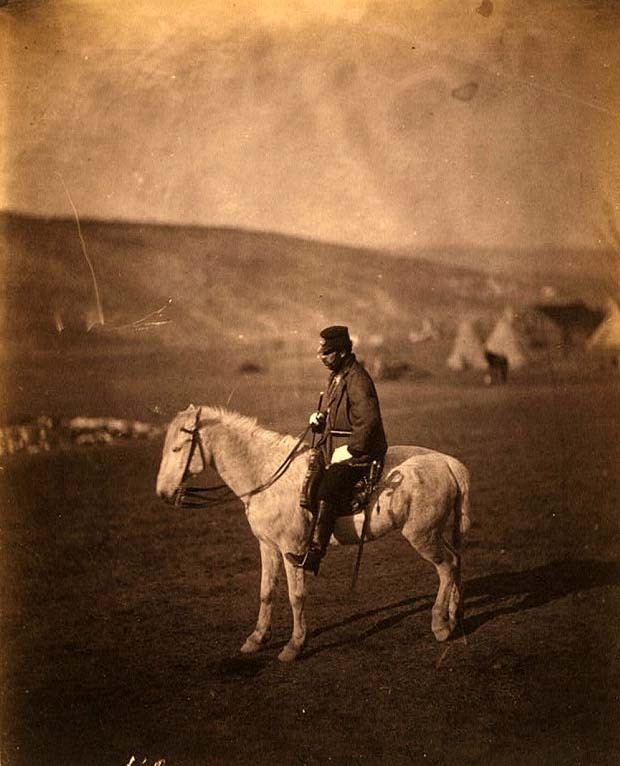 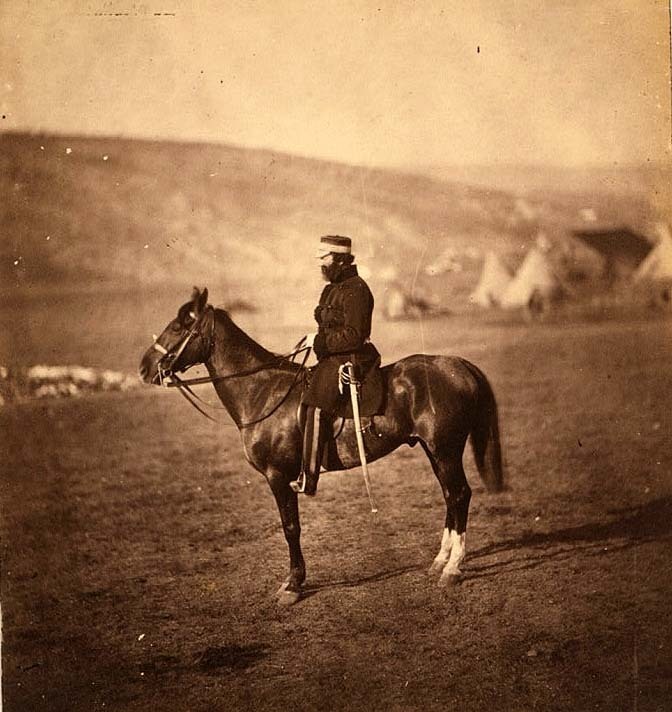 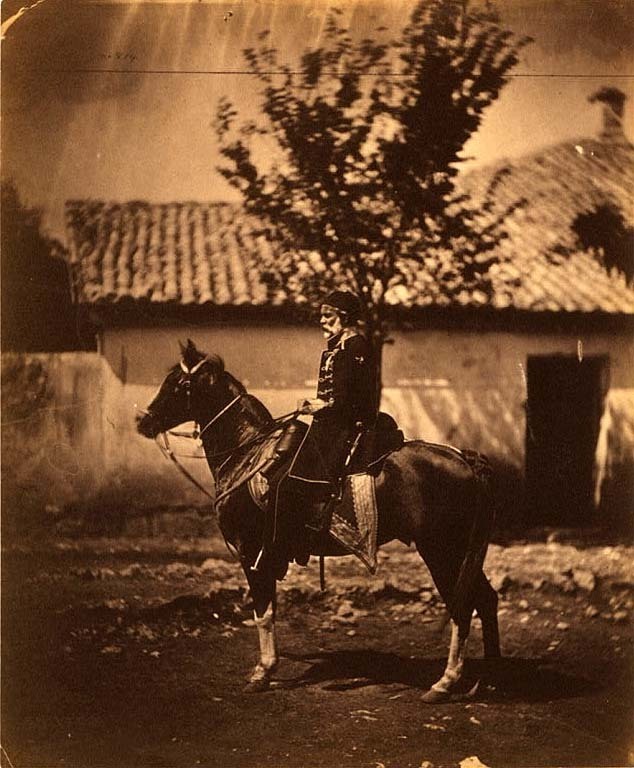 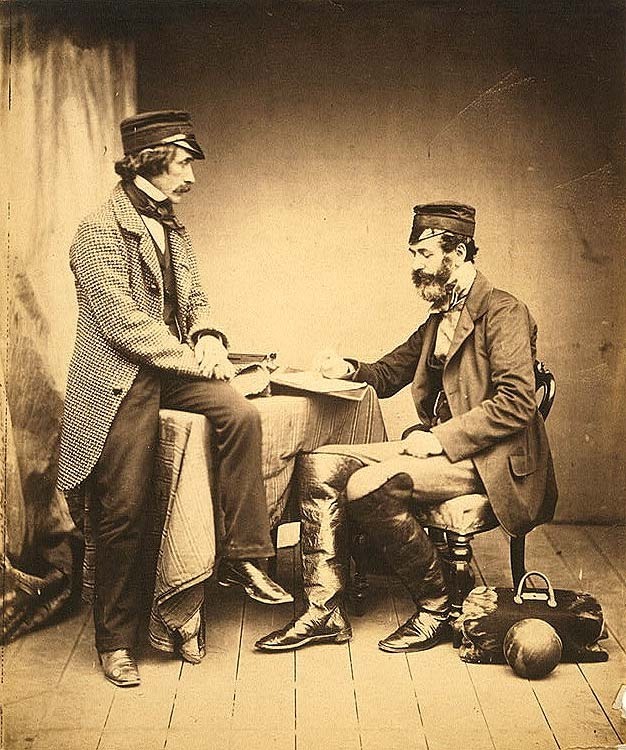 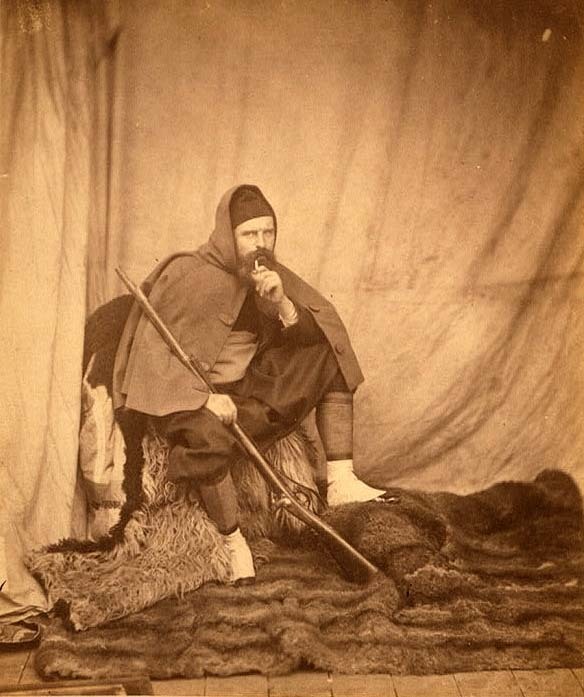 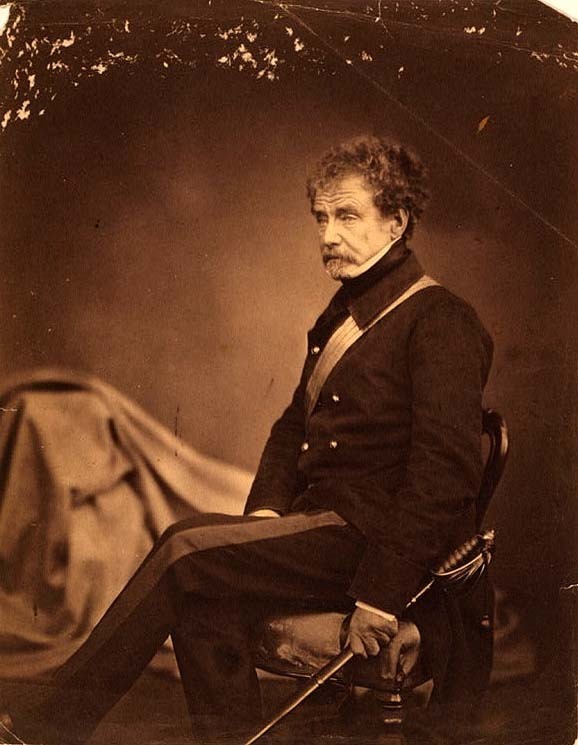 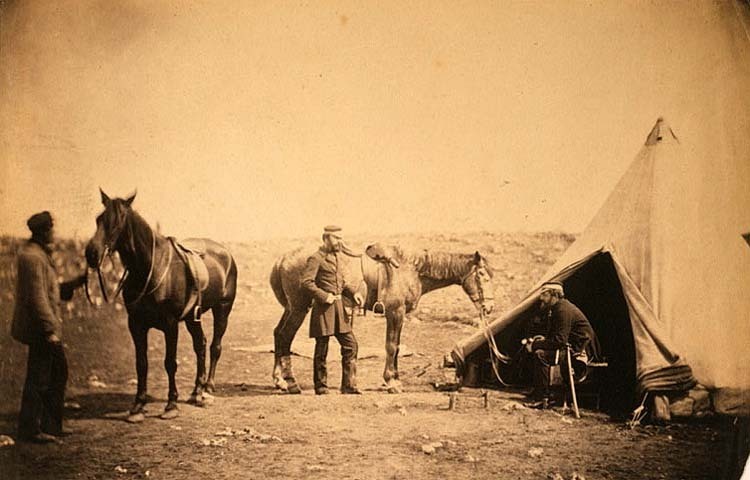 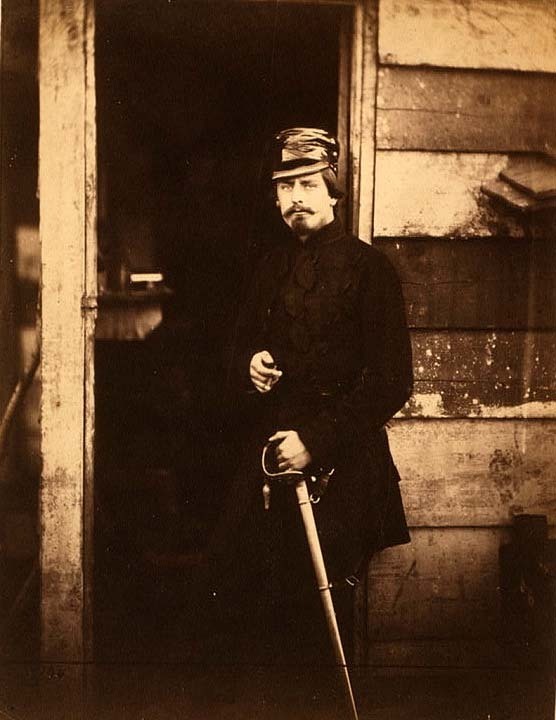 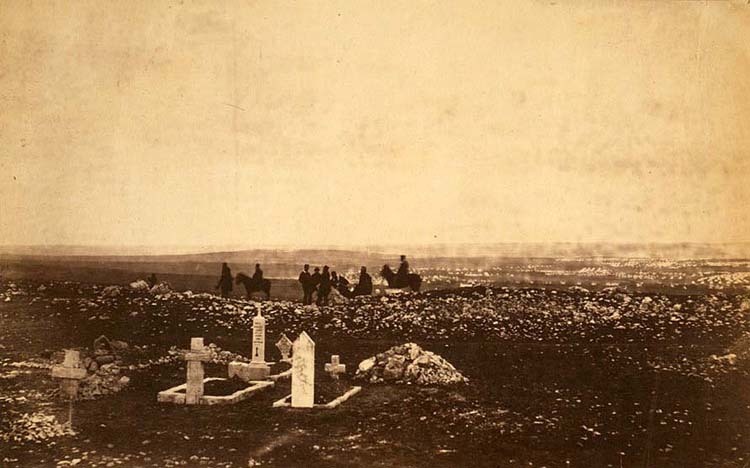 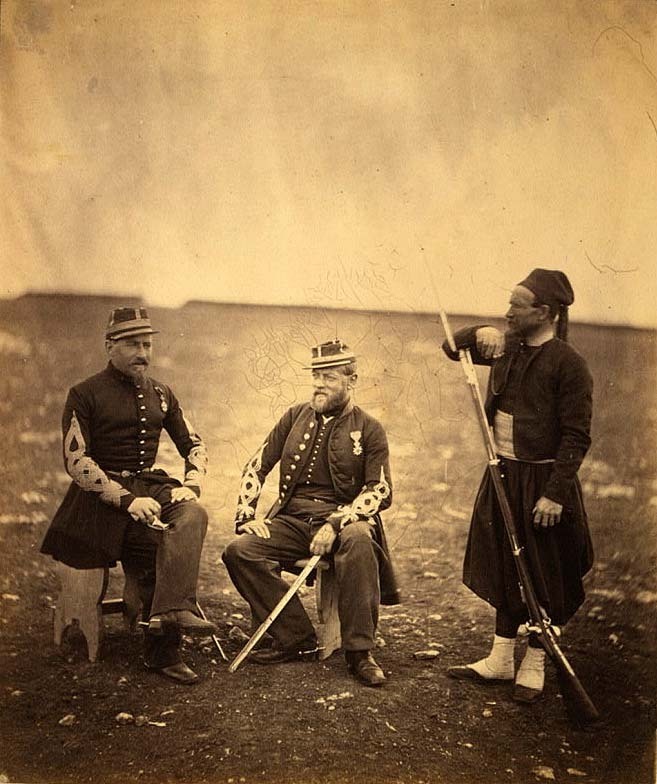 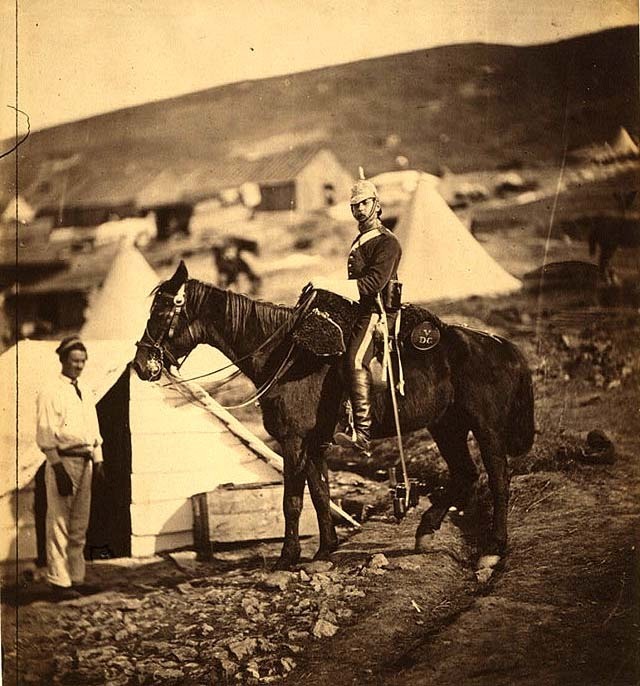 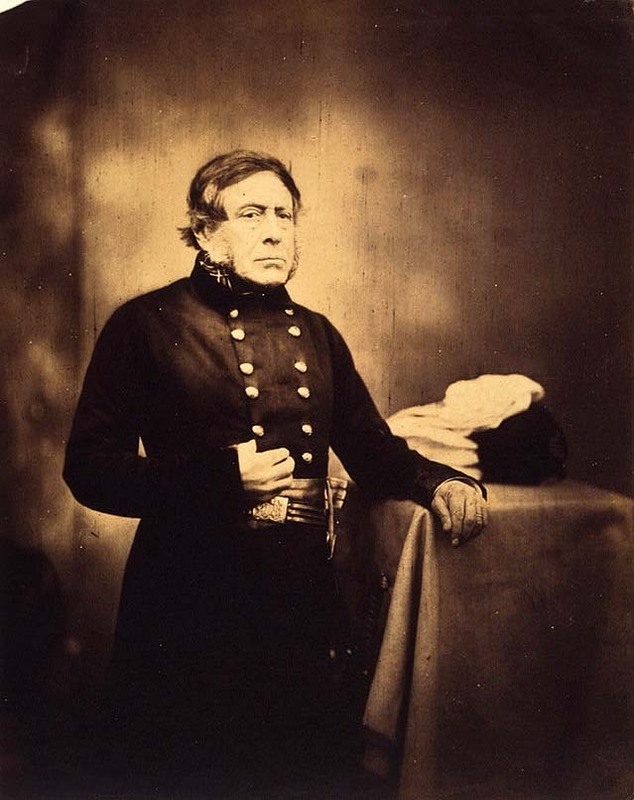 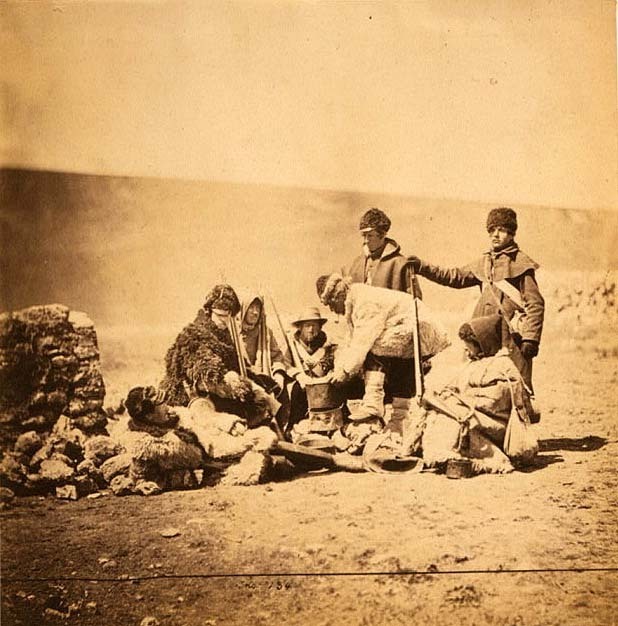 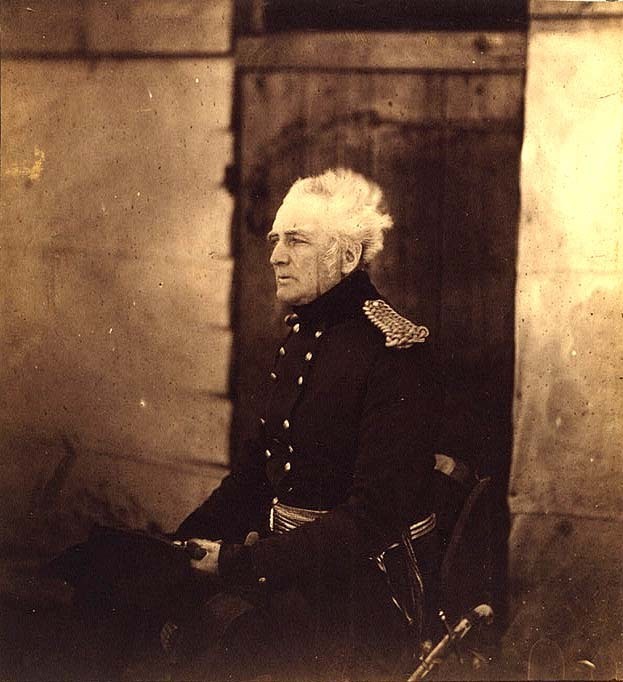 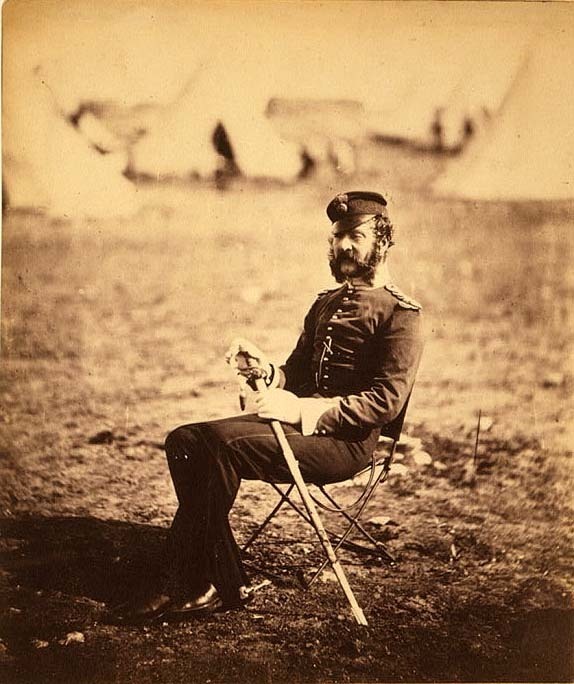 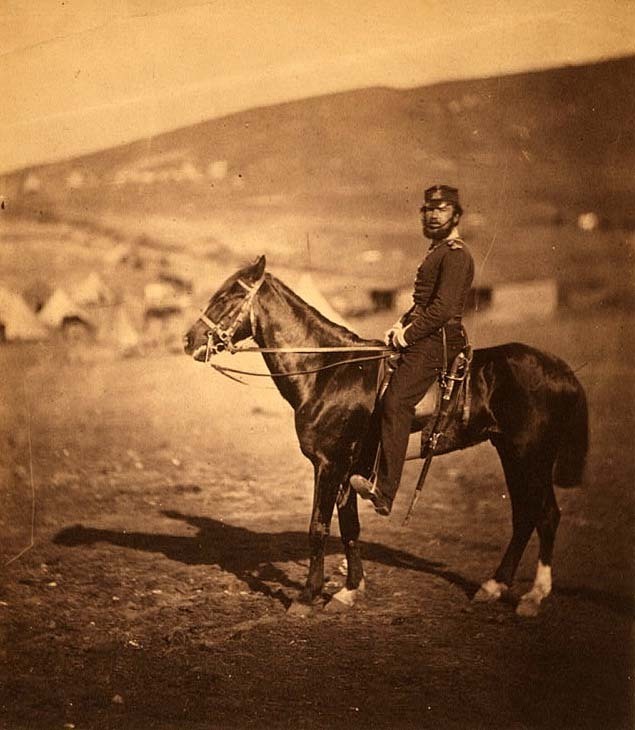 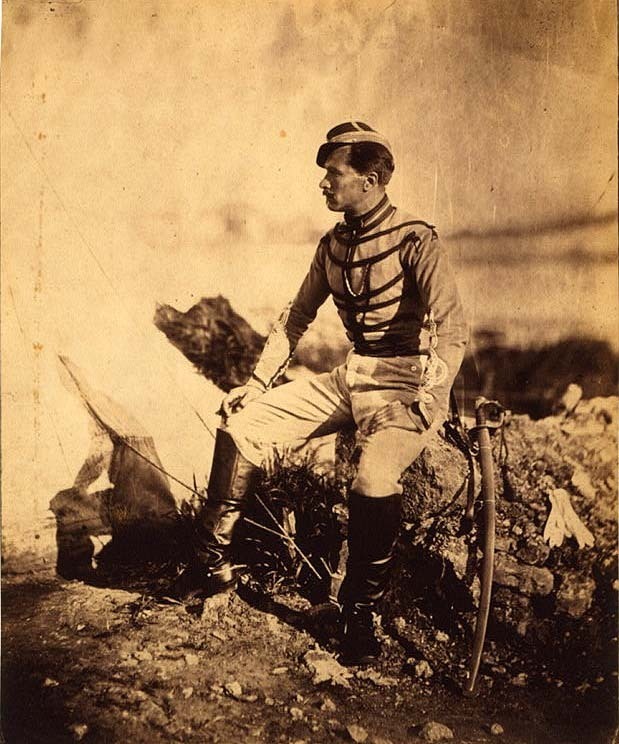 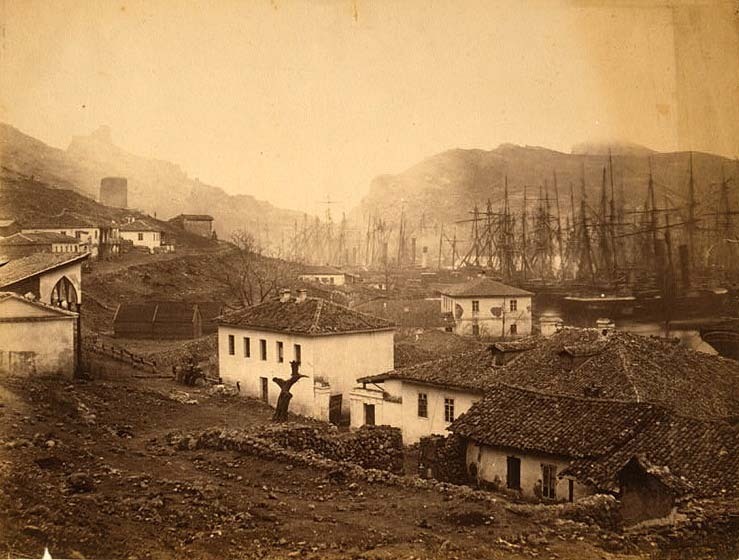 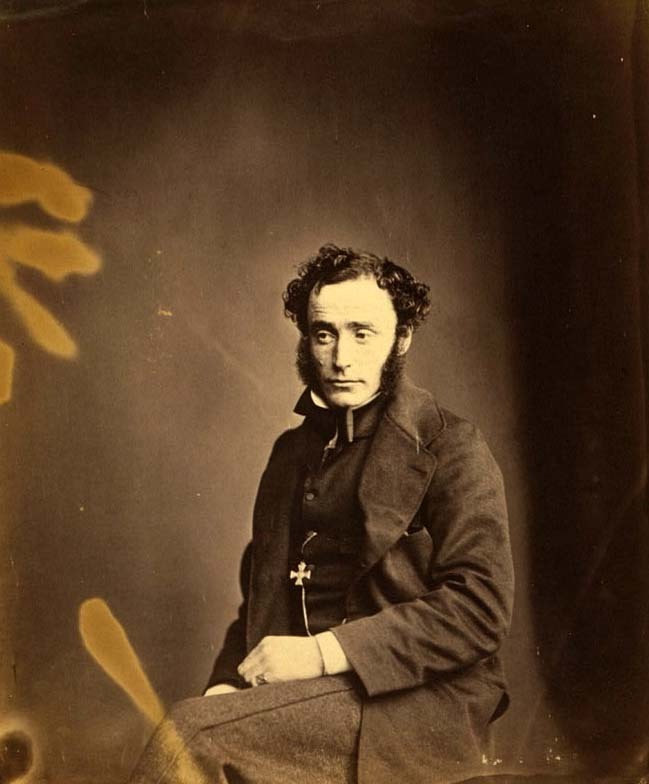 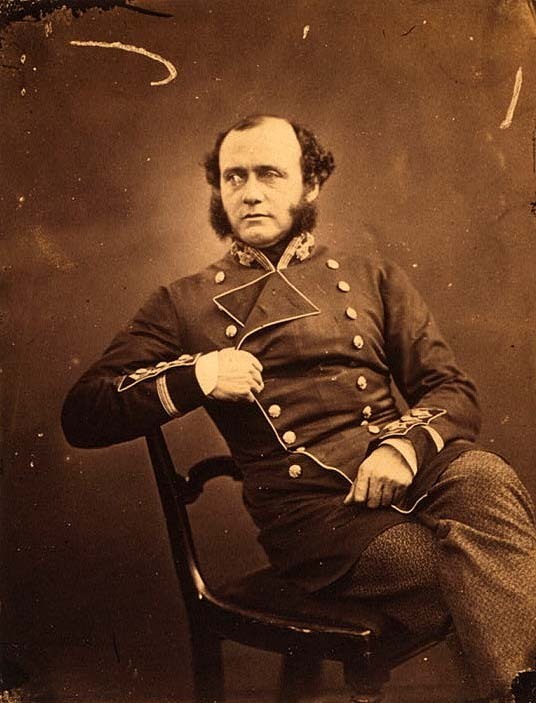 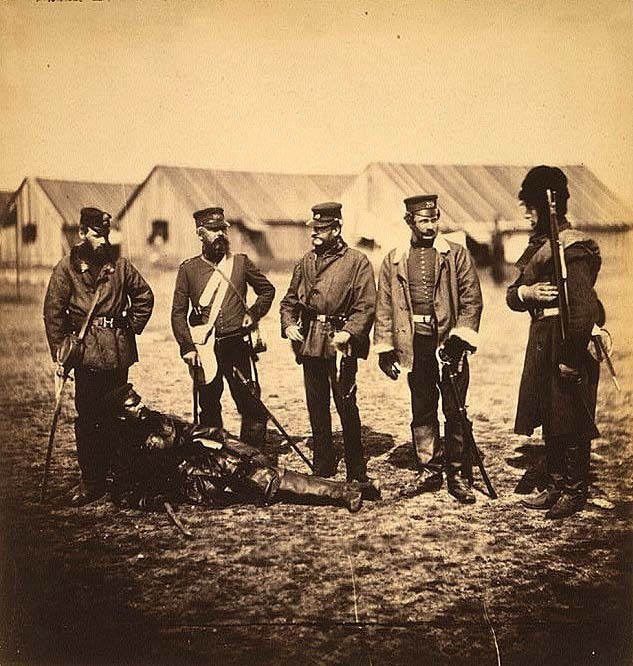 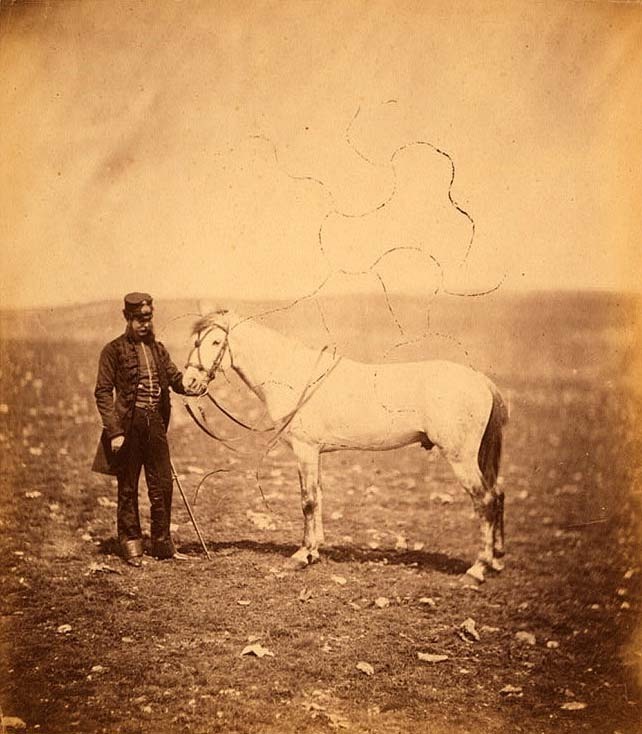 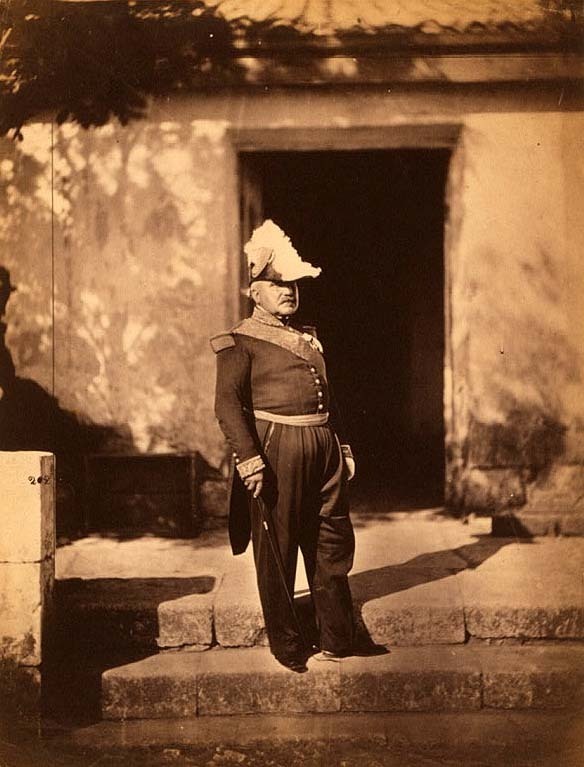 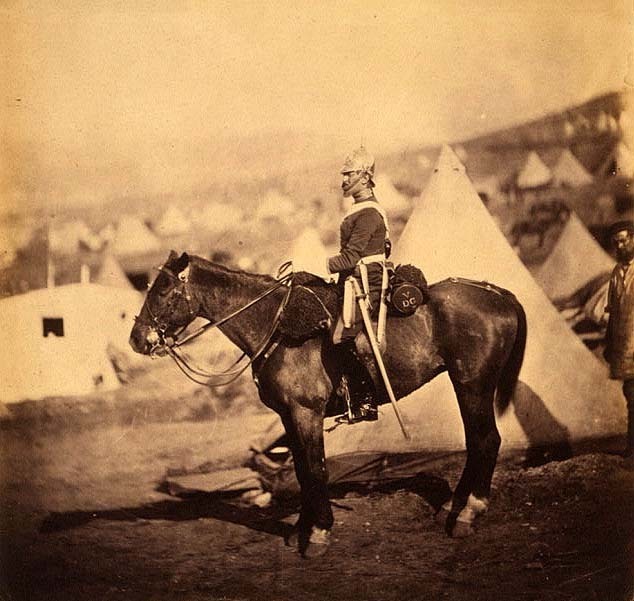 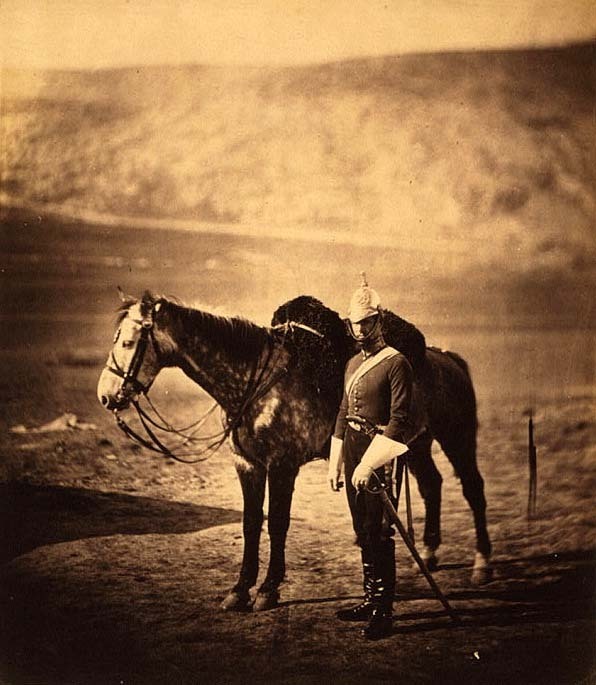 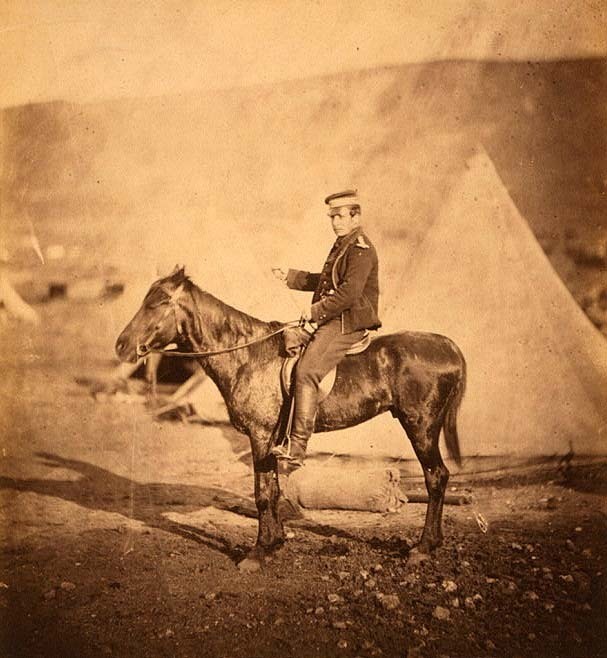 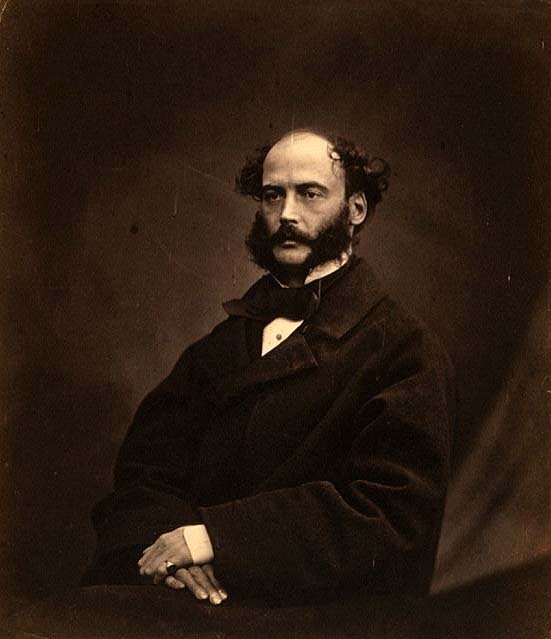 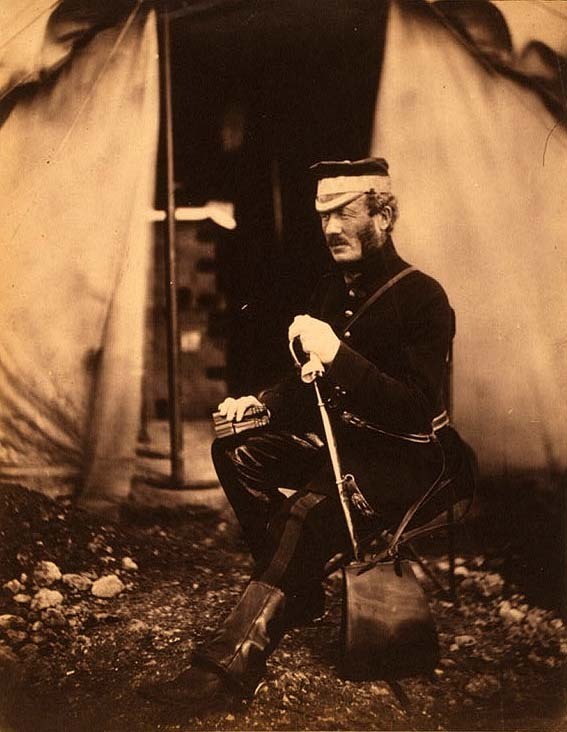 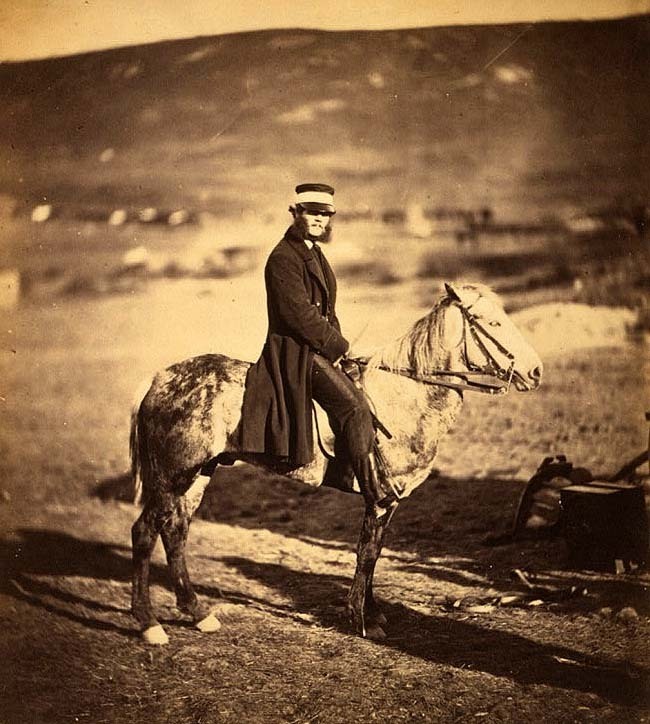 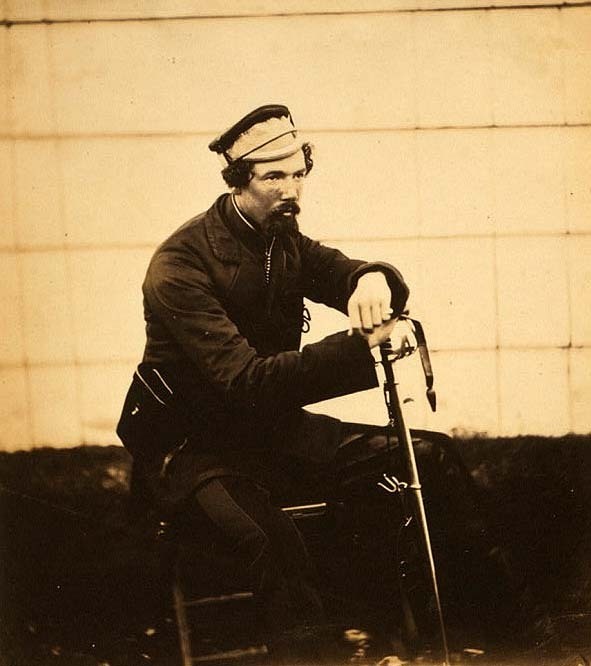 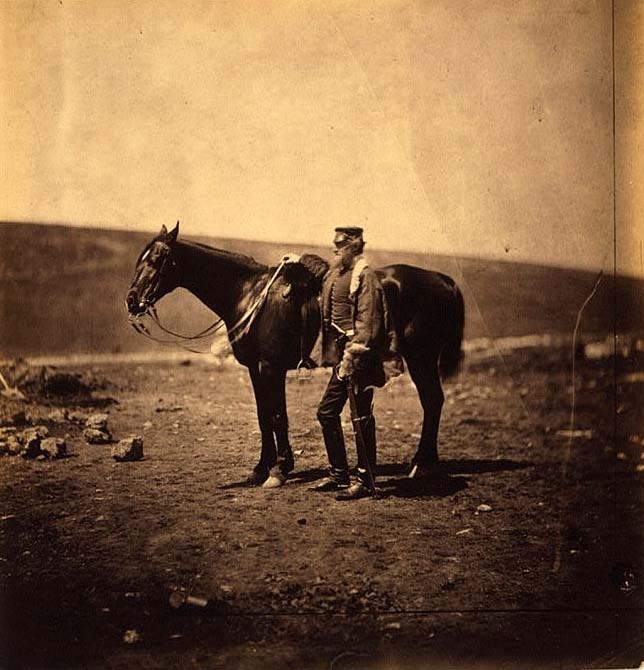 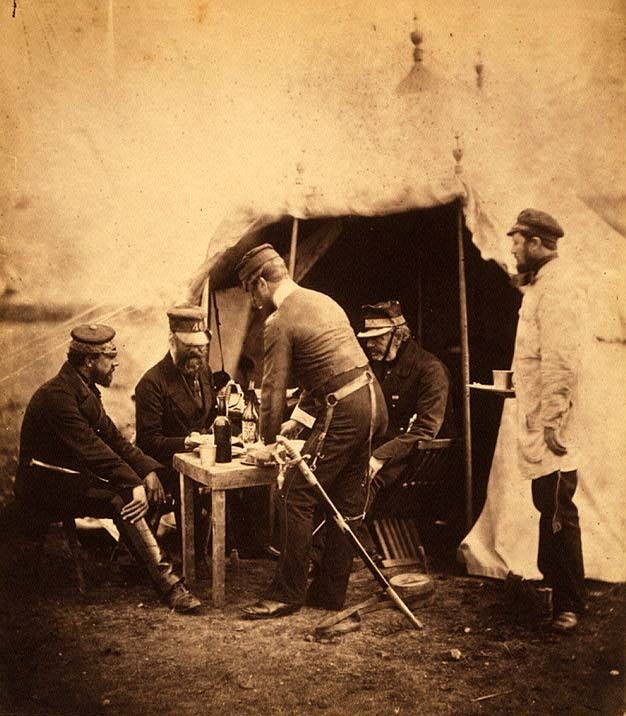 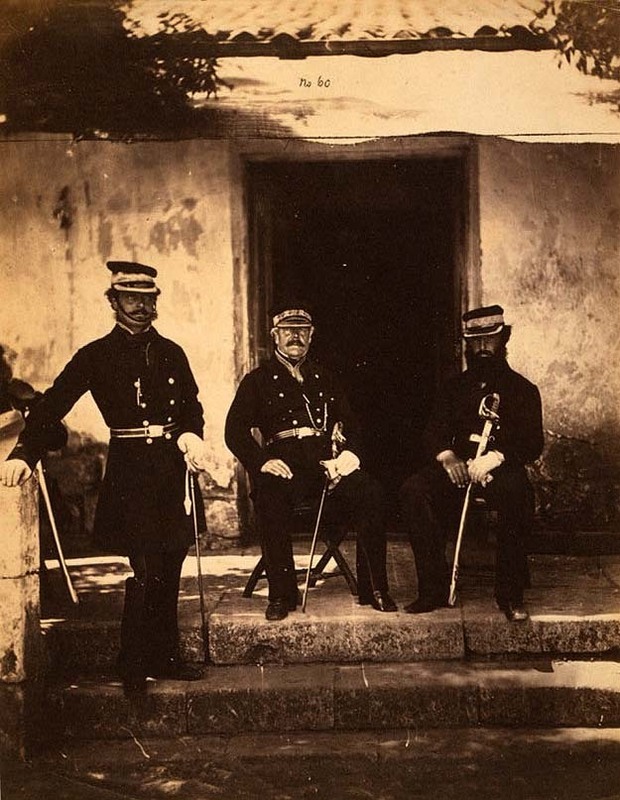 With the end of the Crimean War, quite modest public interest in Fenton's photos quickly faded away, in 1862 he left photography for good, dying several years later, financially broken and almost forgotten. 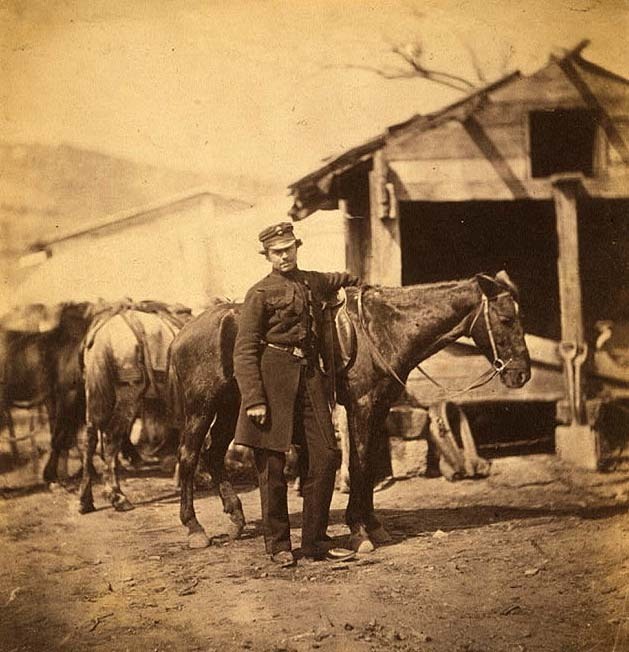 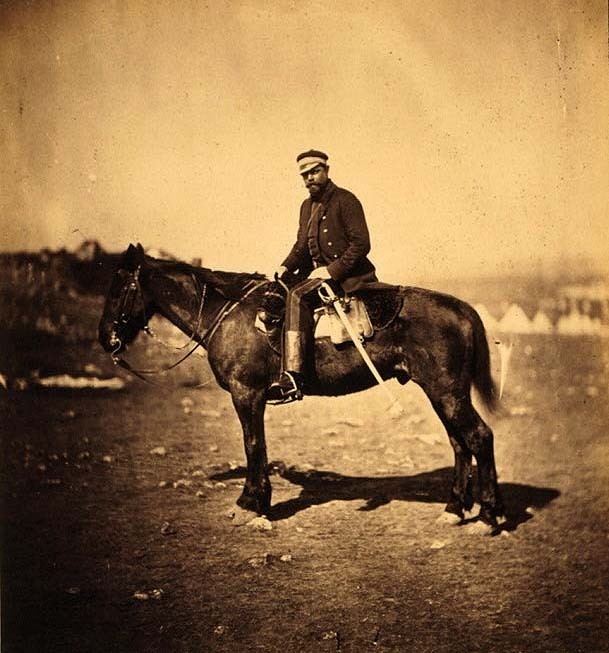 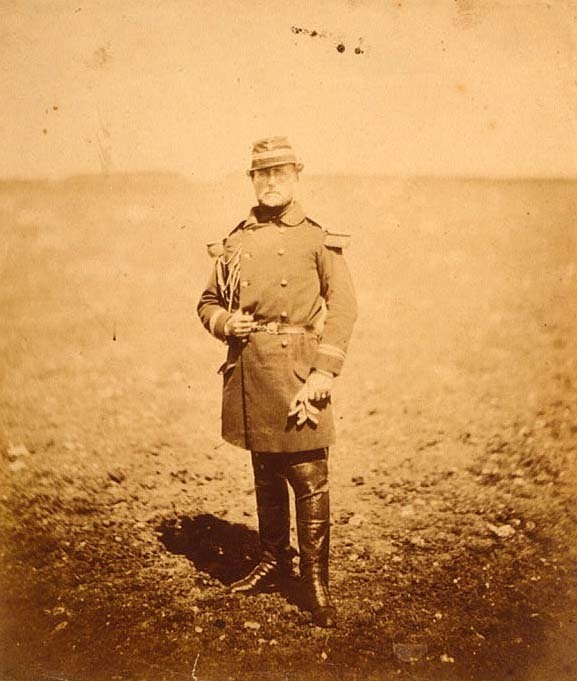 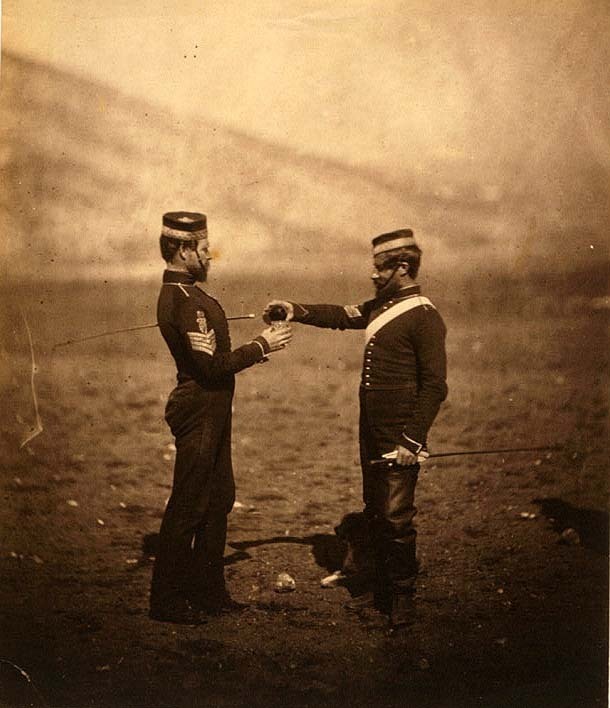 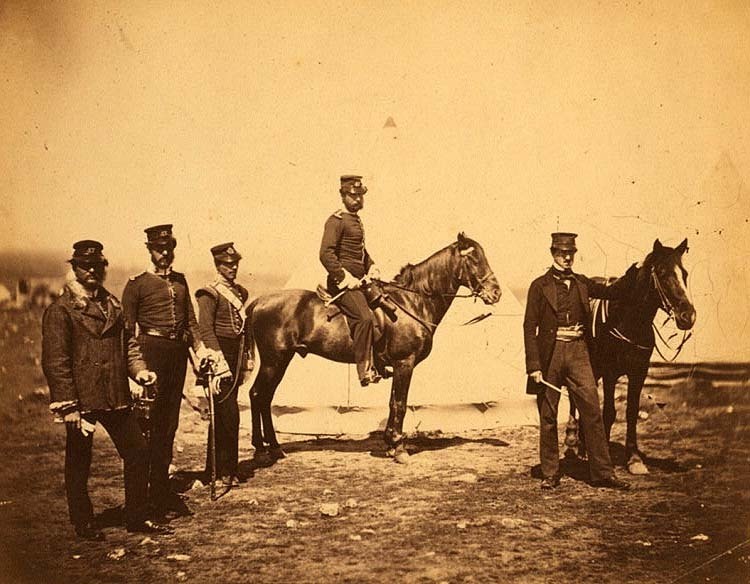 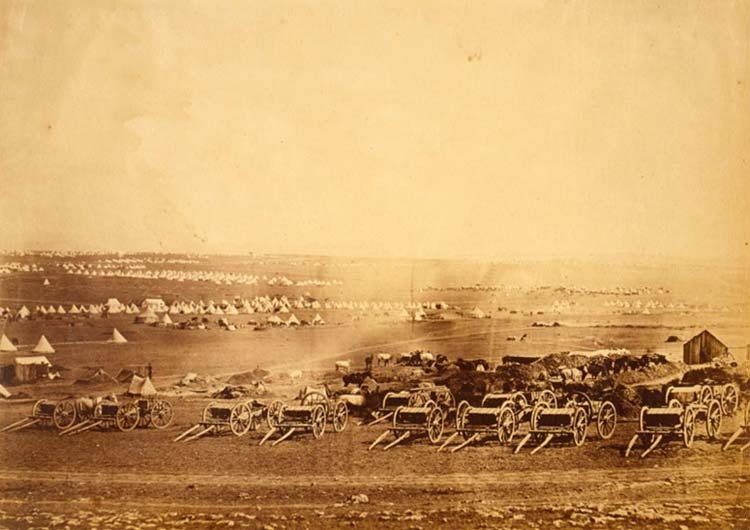 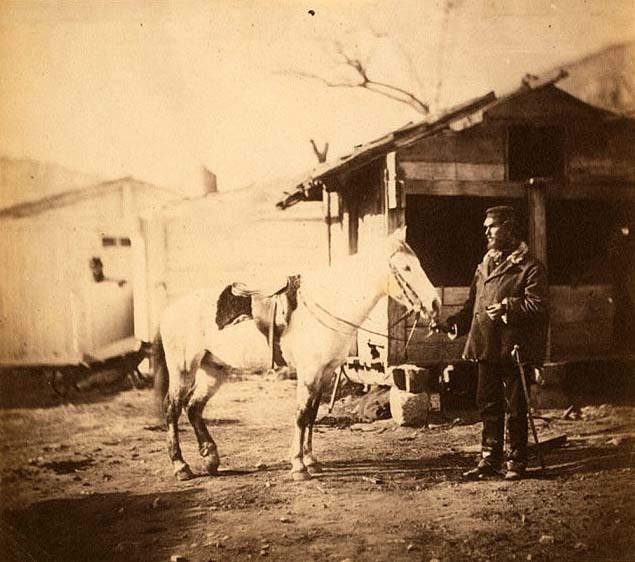 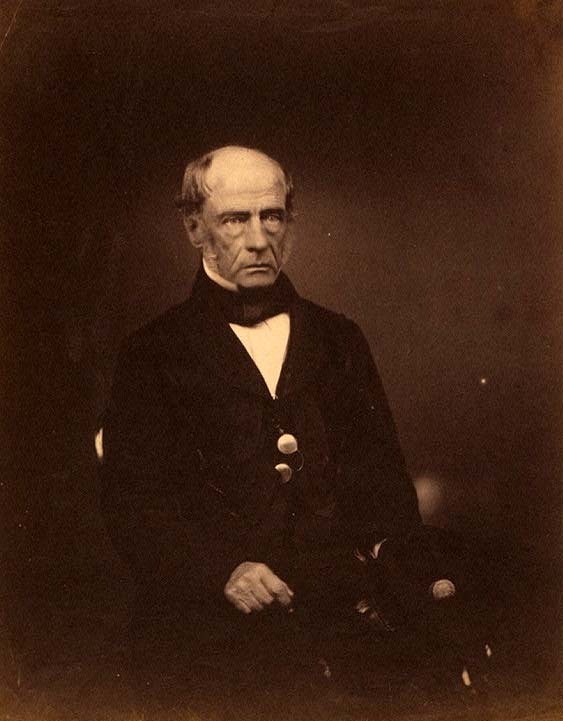 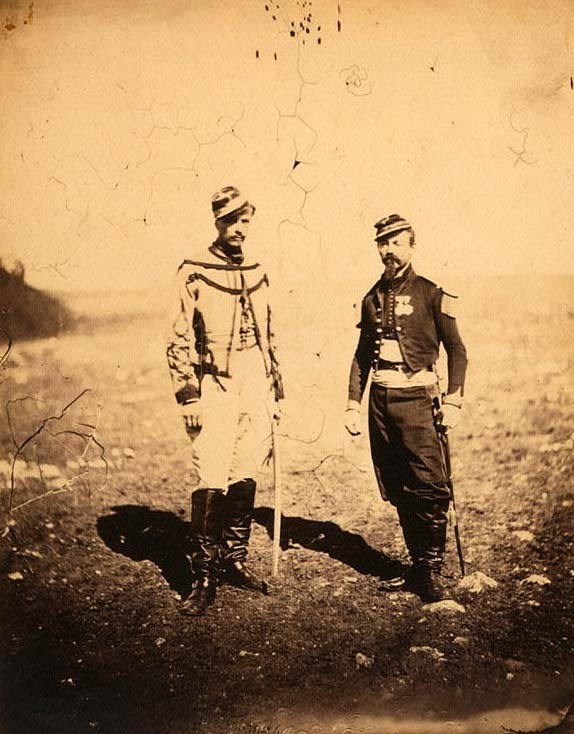 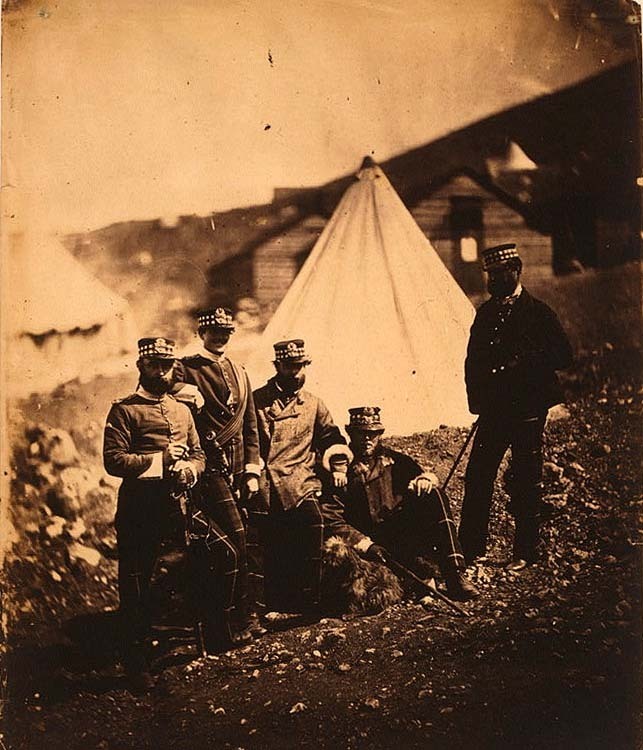 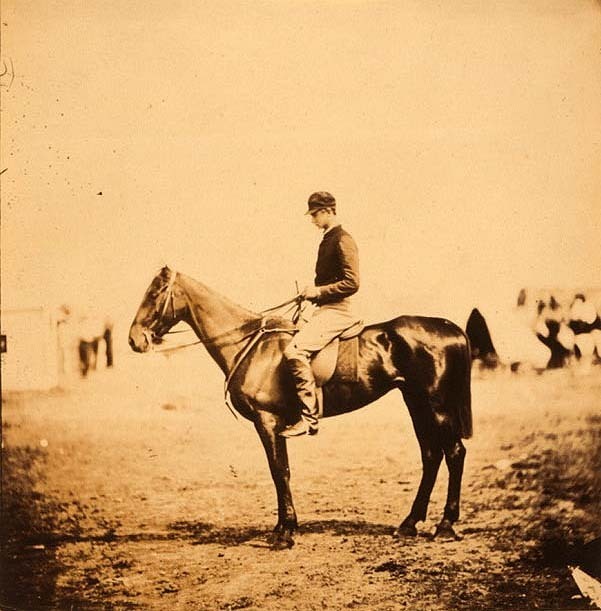 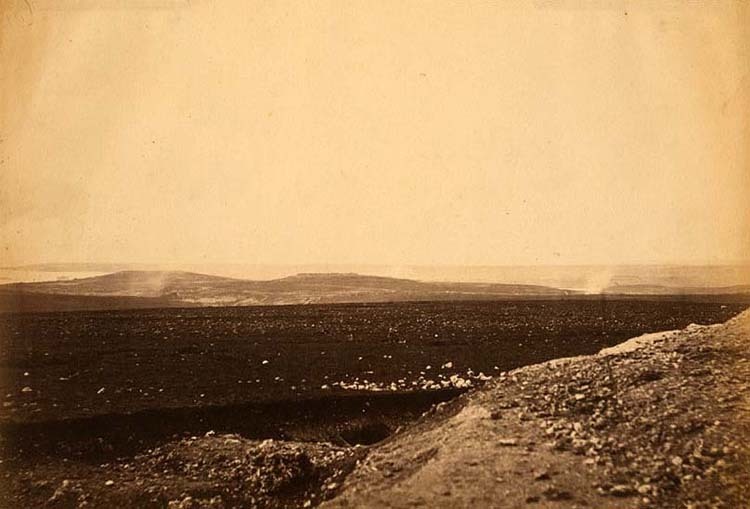 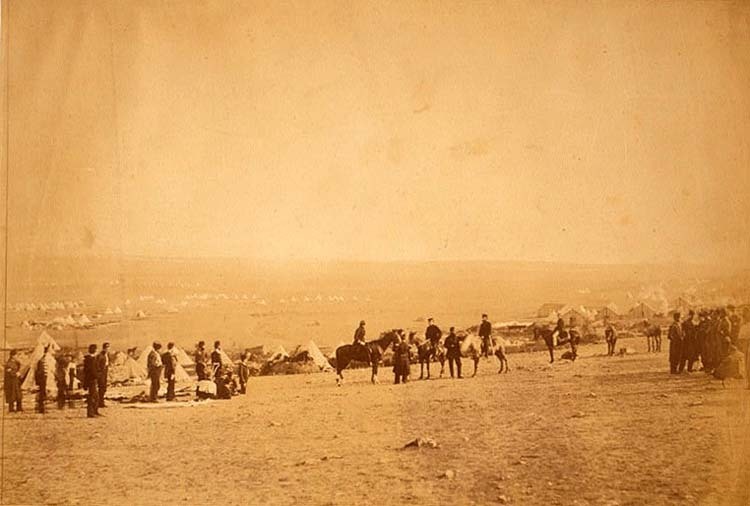 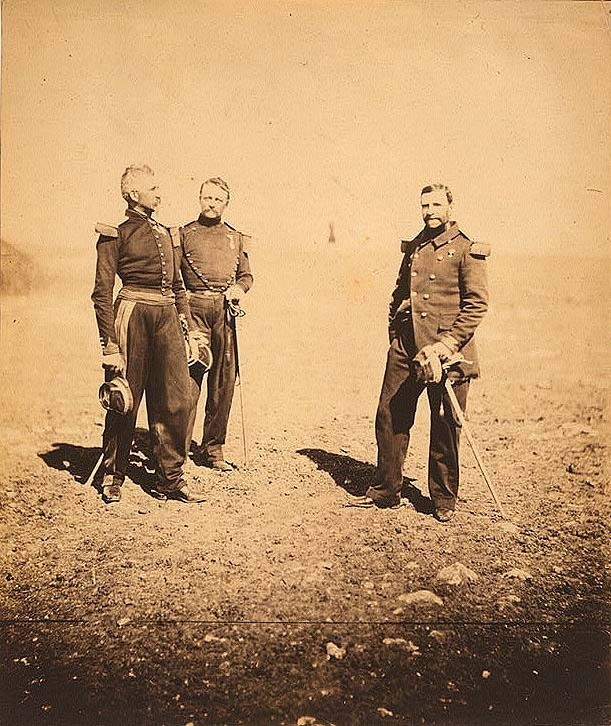 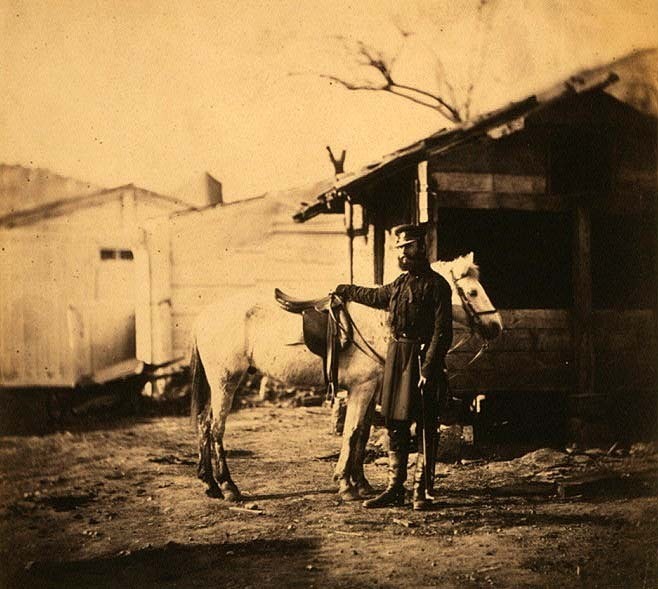 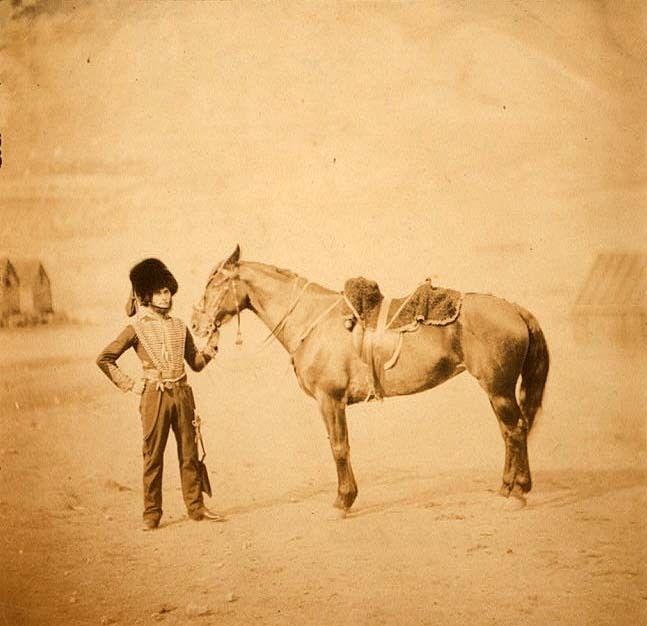 In our days, however, historians unanimously recognize Fenton's remarkable accomplishments not only for his keen artistic eye and seminal role in establish photography as an artistic endeavor, but also honor him as one of the first professional war photographers. 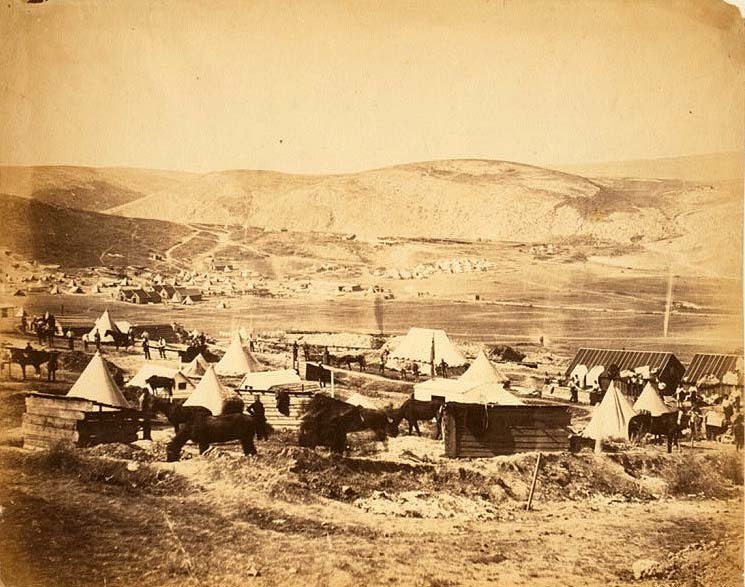 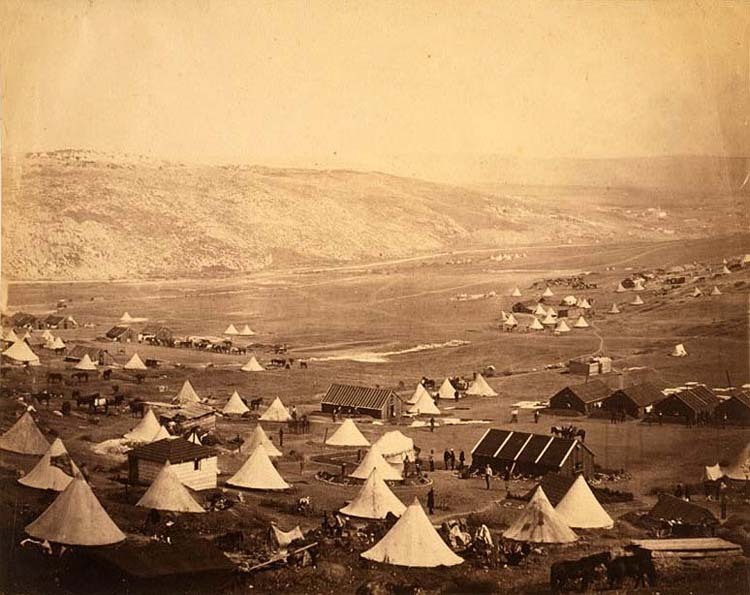 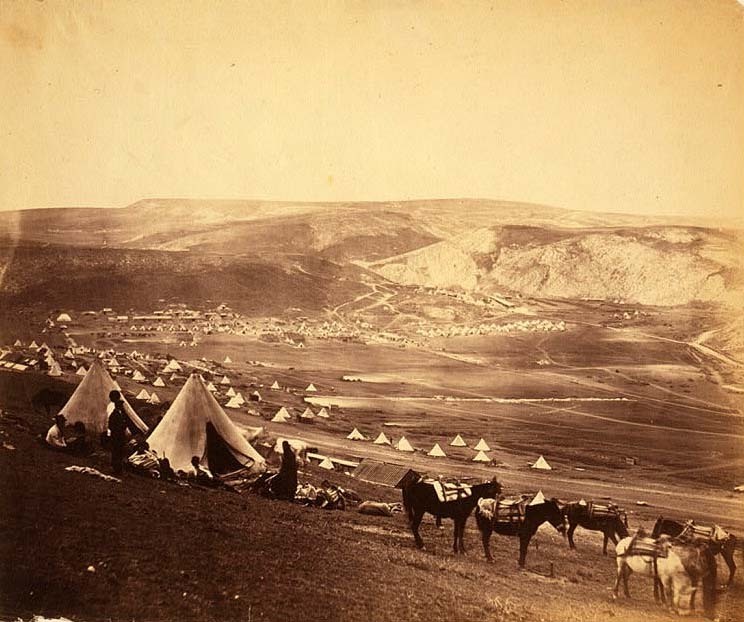 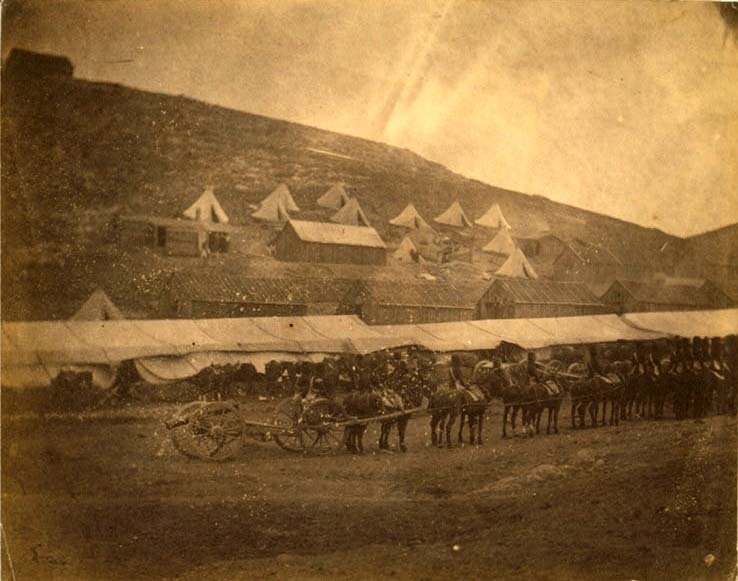 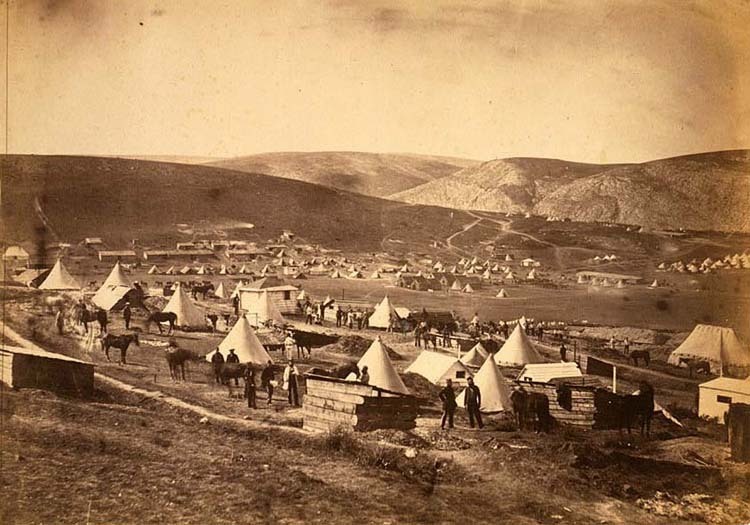 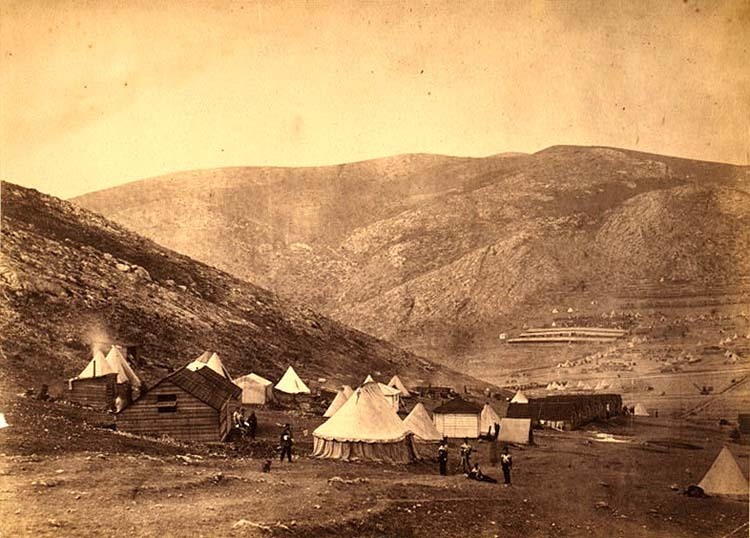 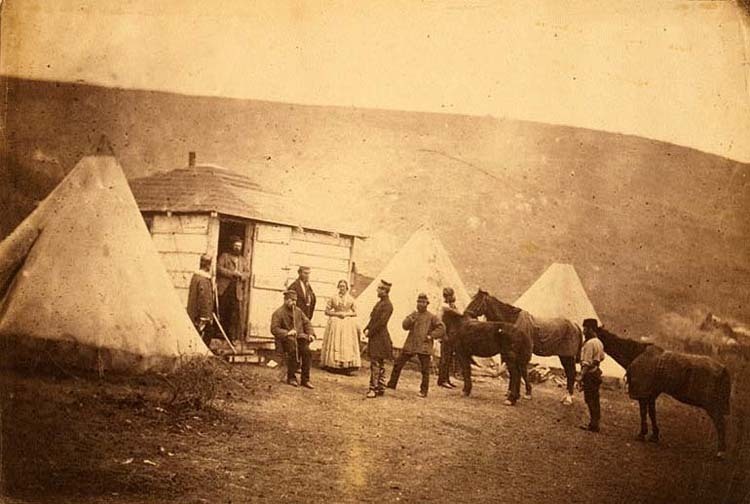 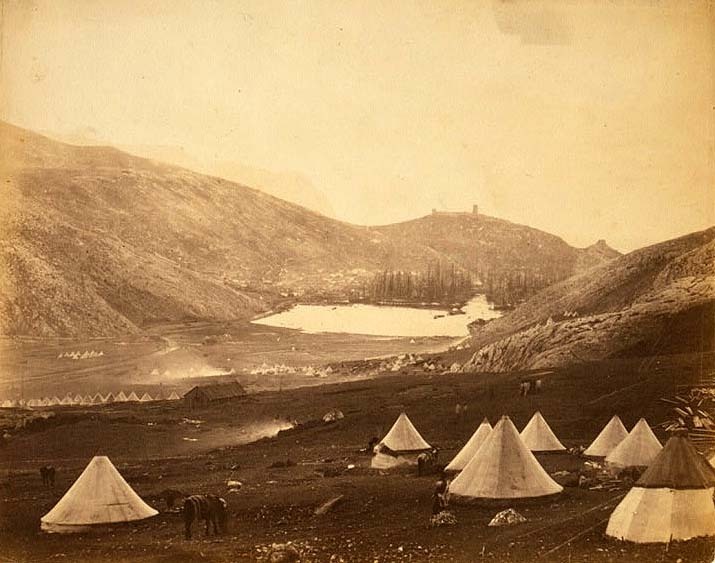 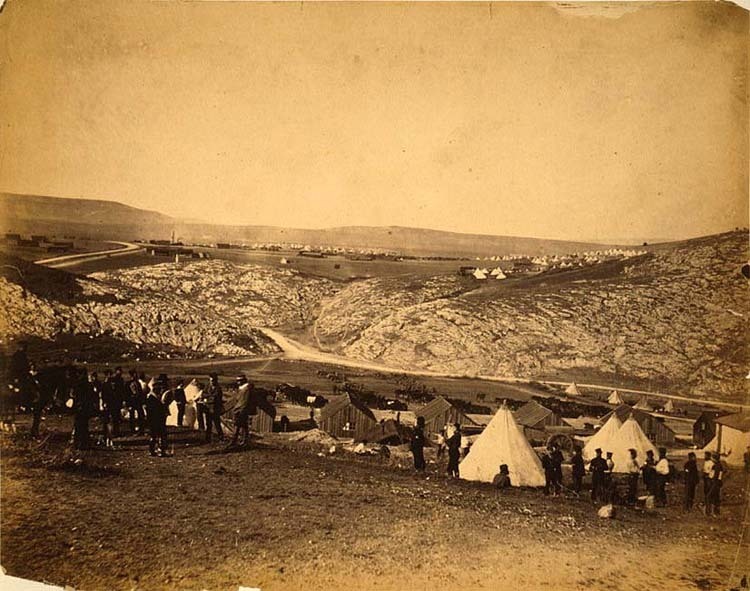 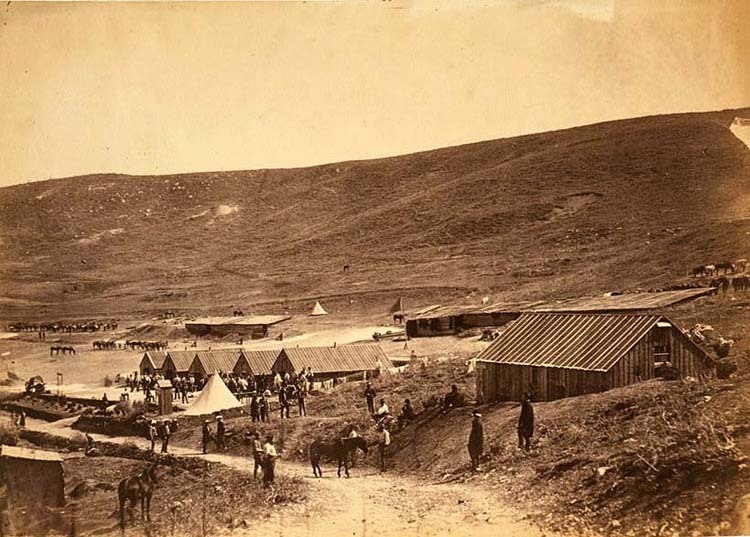 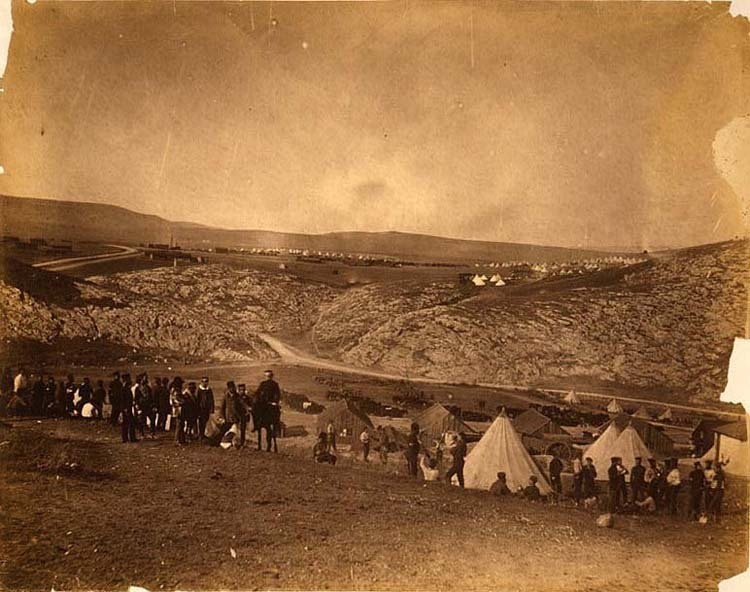 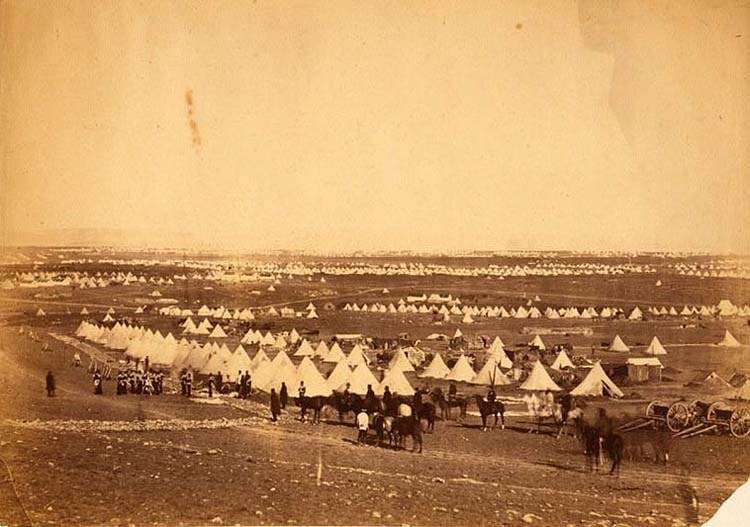 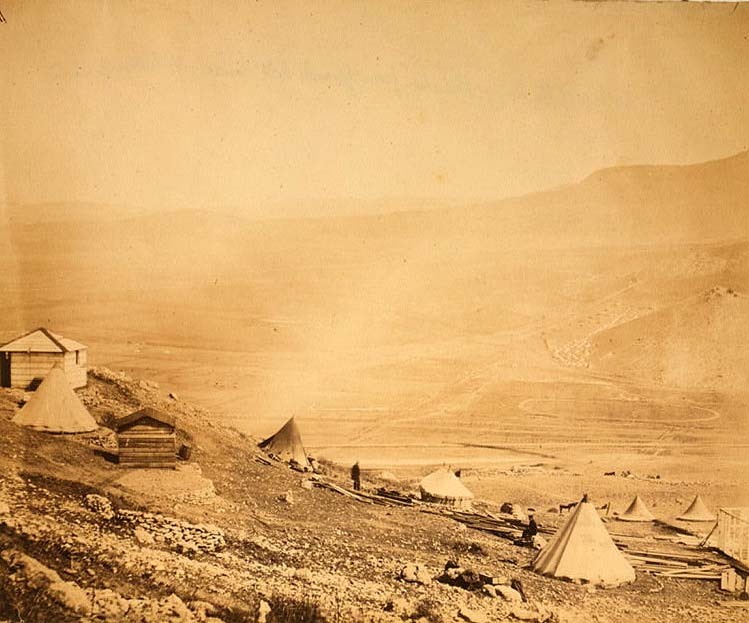 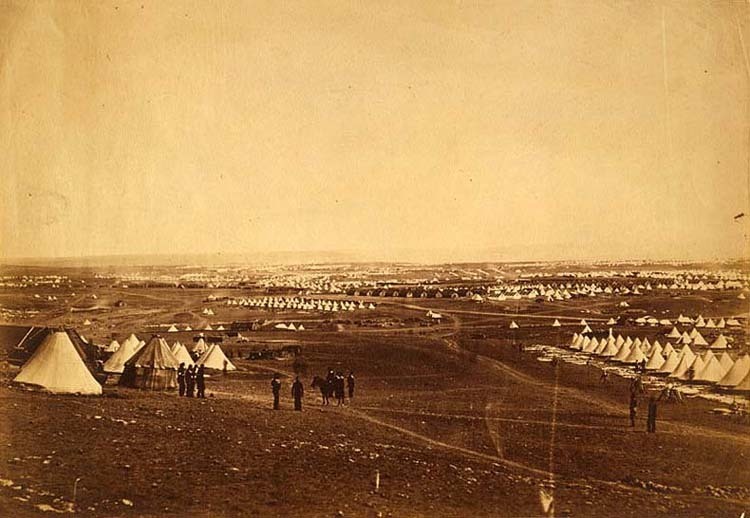 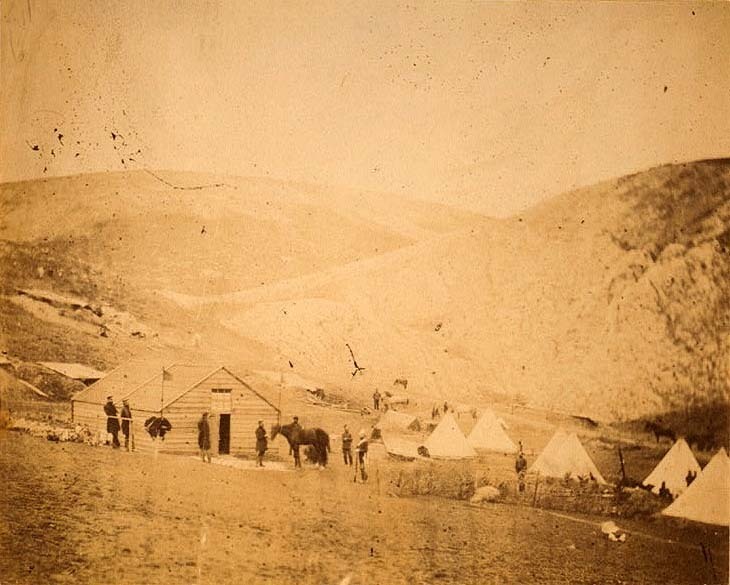 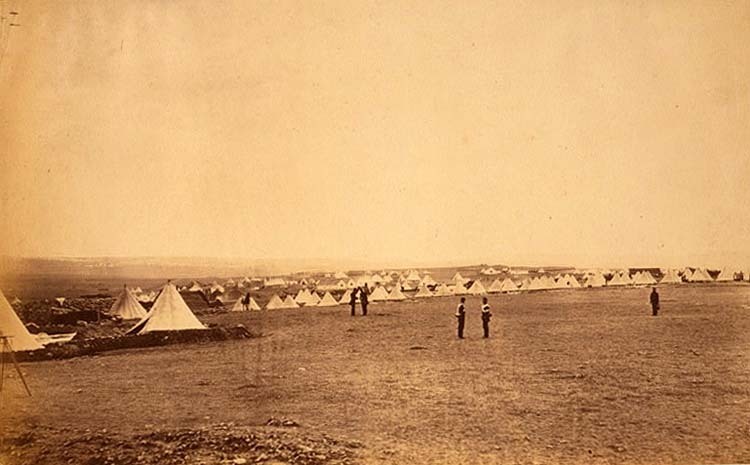 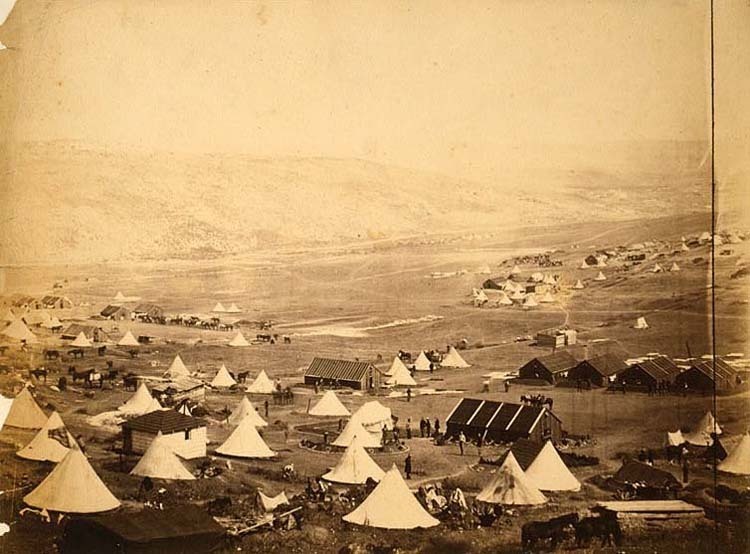 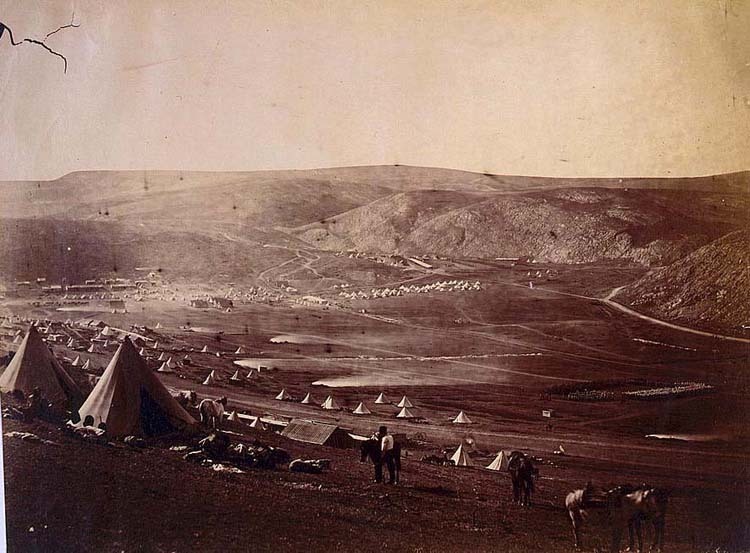 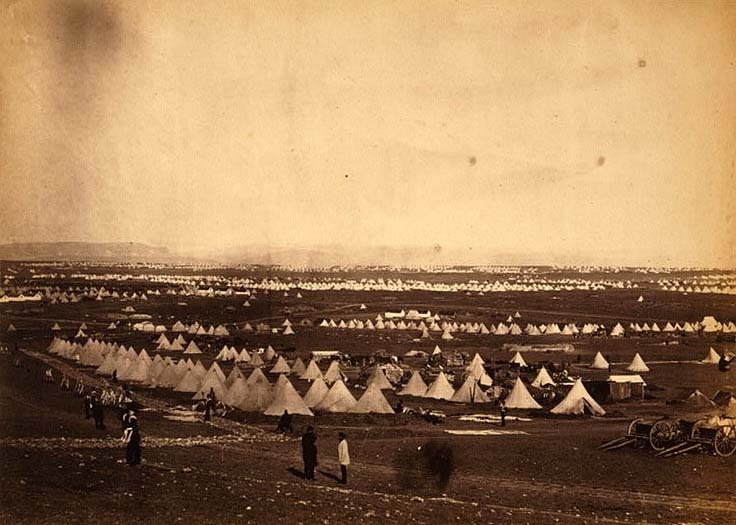 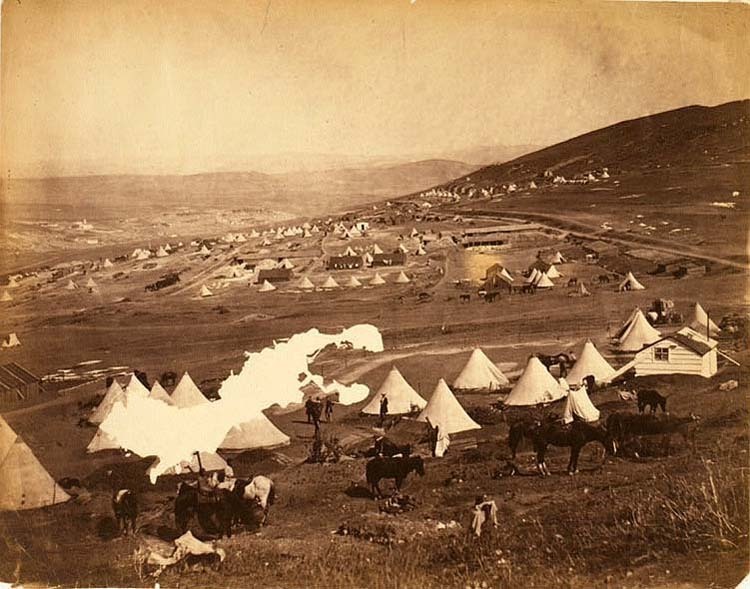 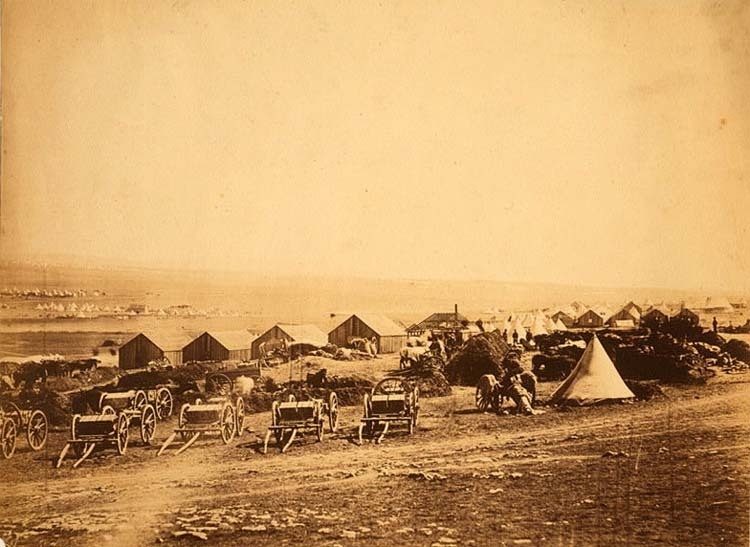 Encampment of the 71st Regiment at Balaclava commissariat camp, Tents and huts of British camps on hillside and valley at Balaklava. 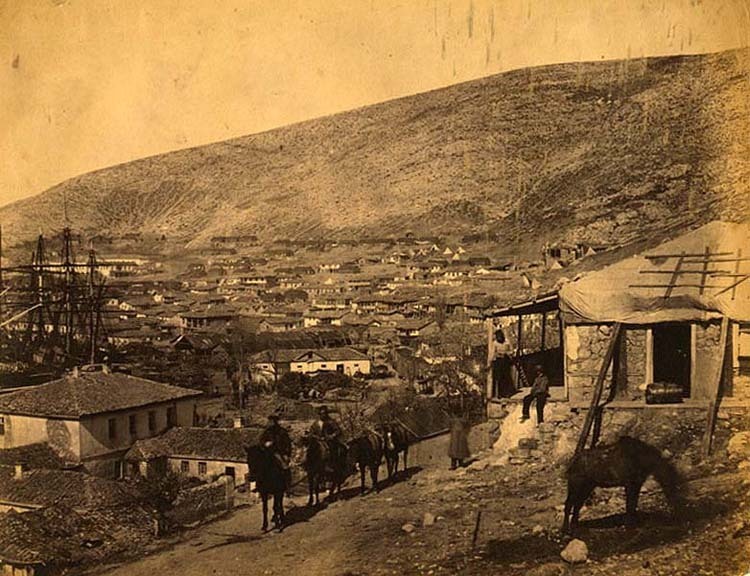 LC-USZC4-9208. 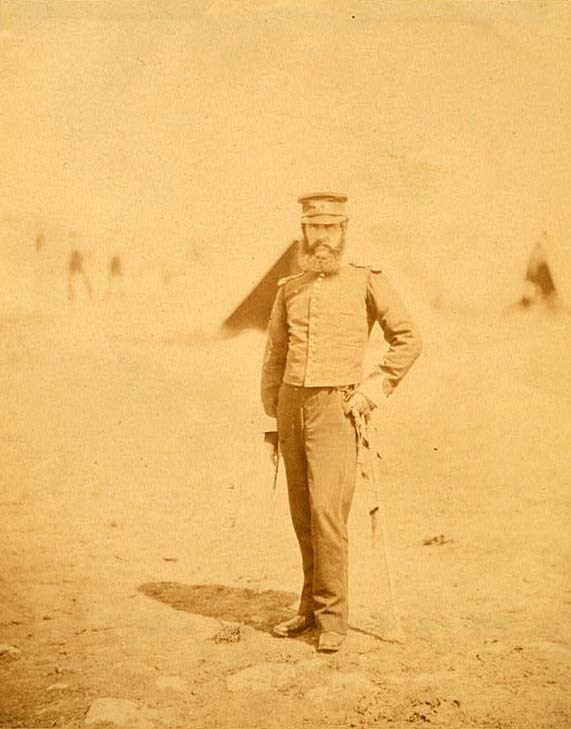 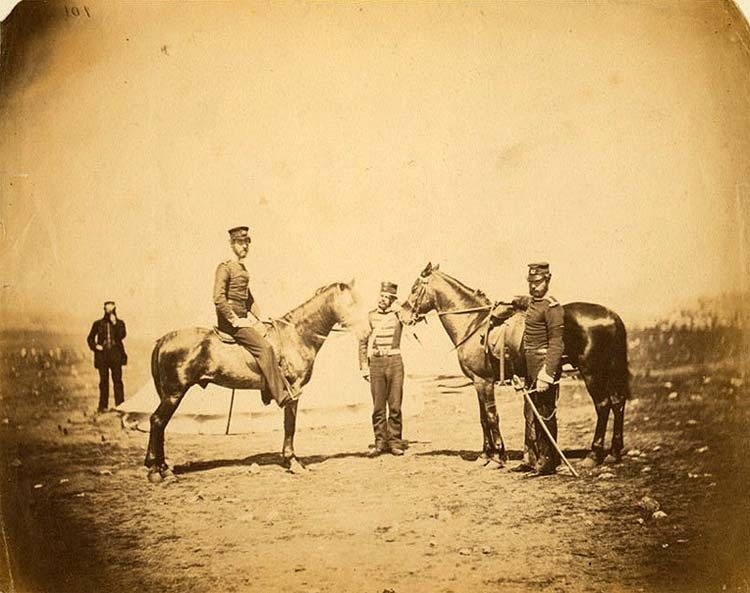 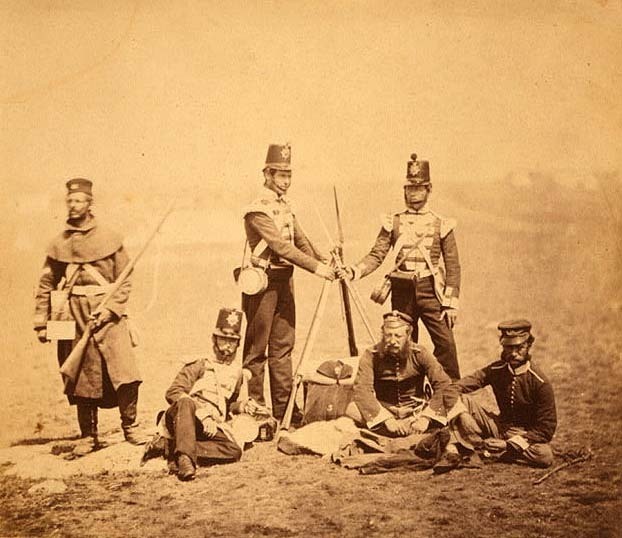 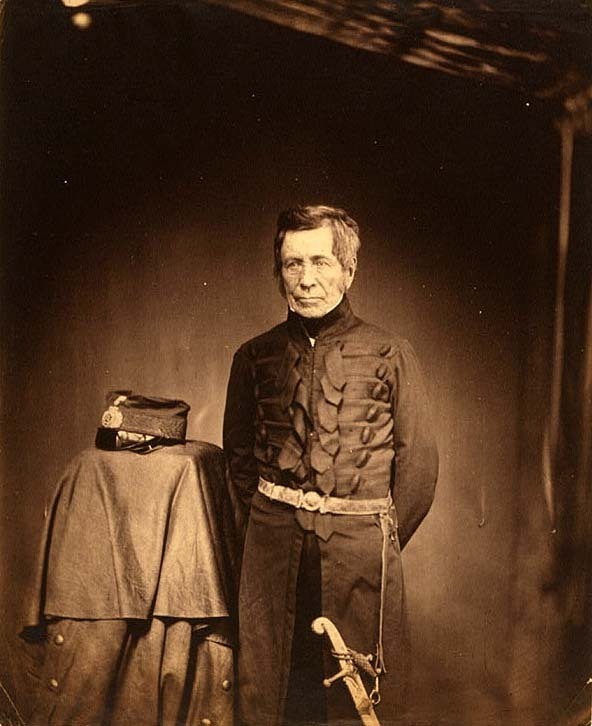 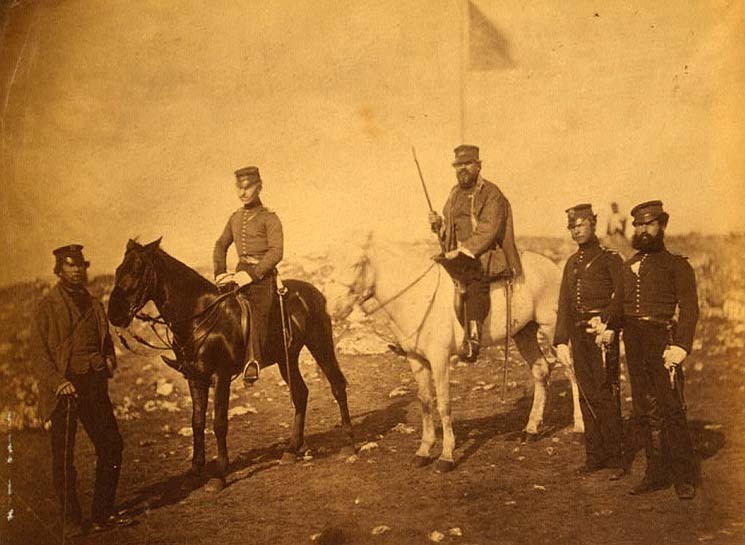 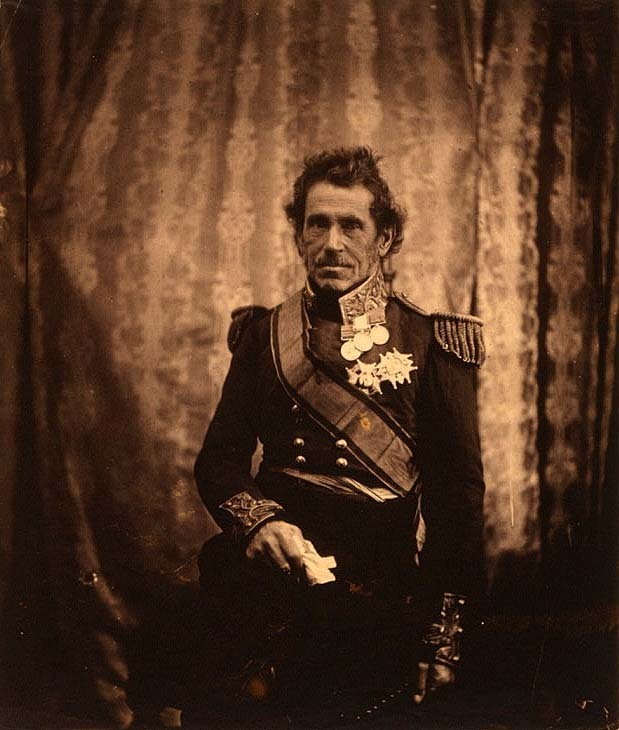 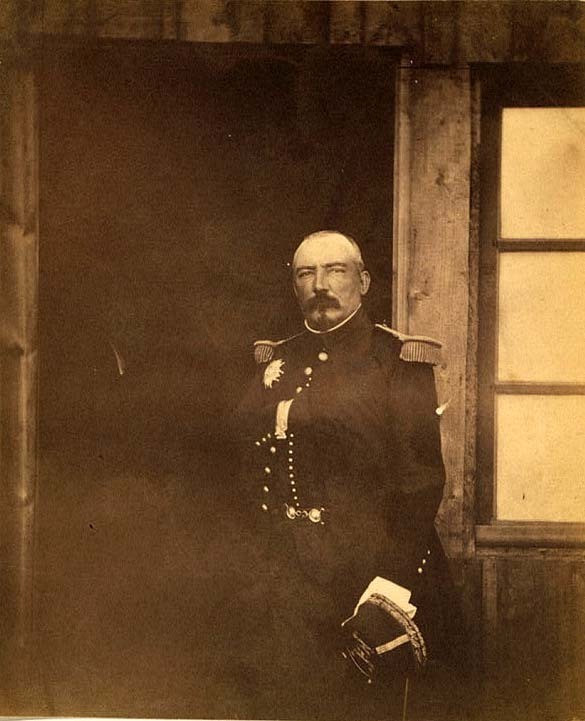 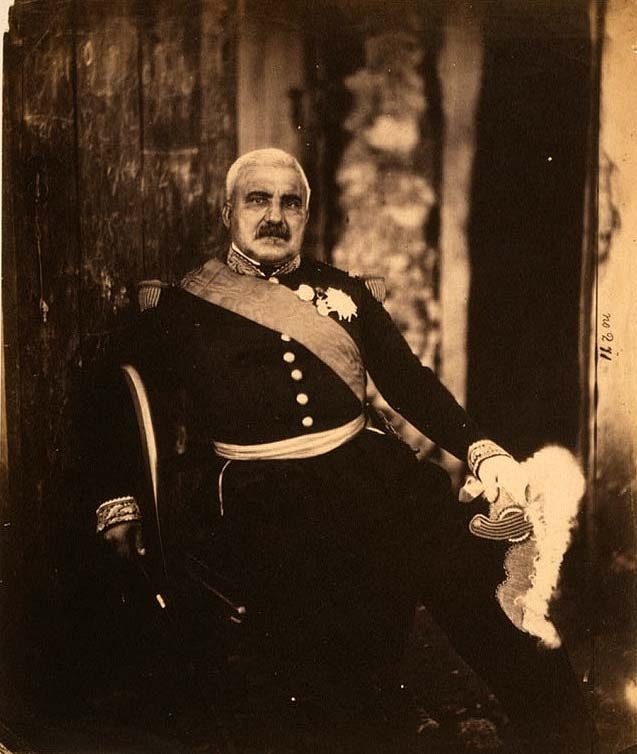 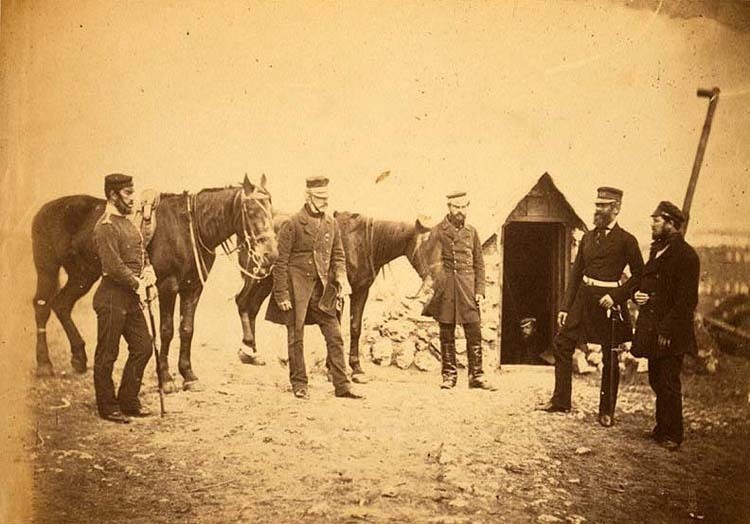 Lieutenant General Sir John L. Pennefather & orderly in uniform of 4th Light Dragoons. 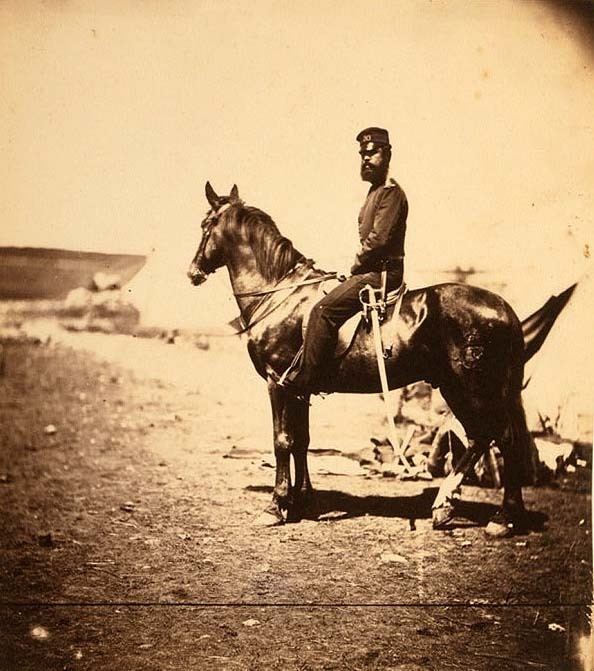 LC-USZC4-9223. 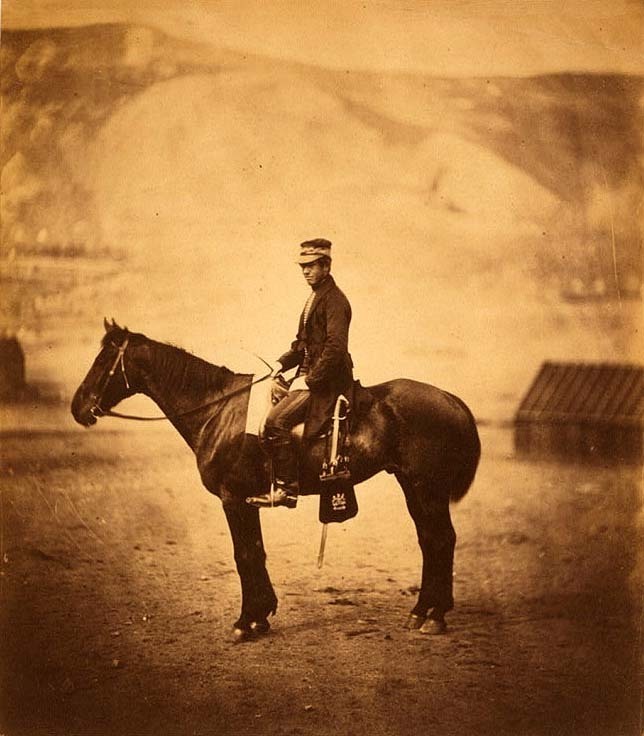 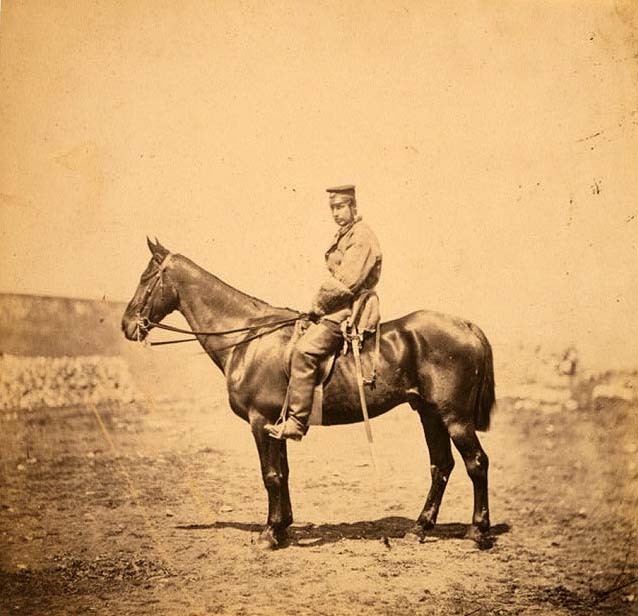 Captain Bernard, 5th Dragoon Guards, seated on a horse with "V DG" on bags. 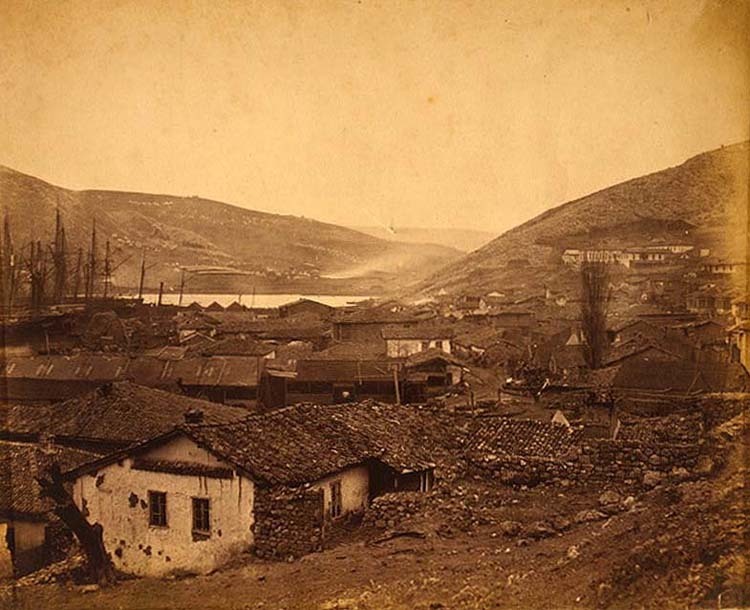 LC-USZC4-9224. 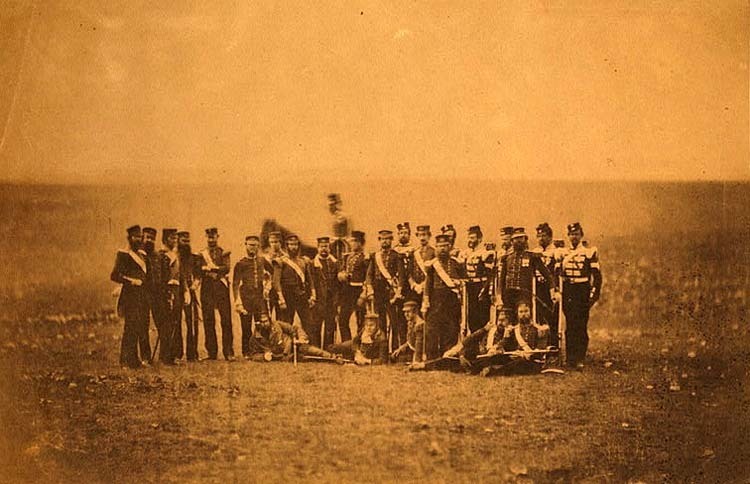 Officers of the 90th Regiment of Foot (Perthshire Volunteers) Light Infantry. 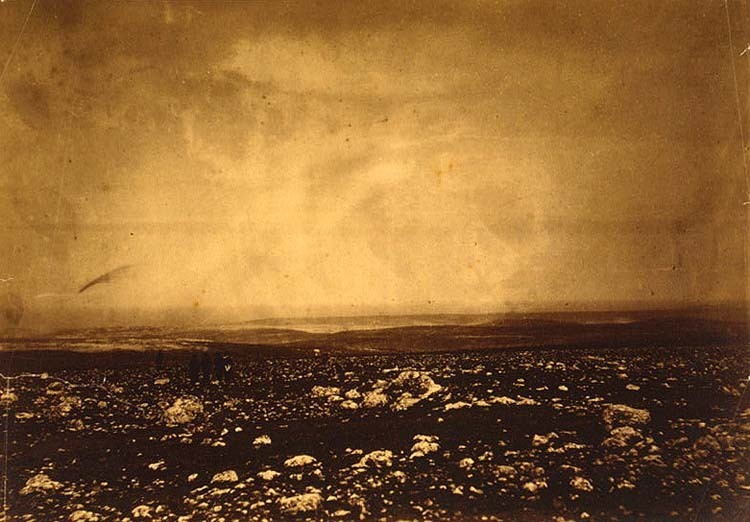 LC-USZC4-9225. 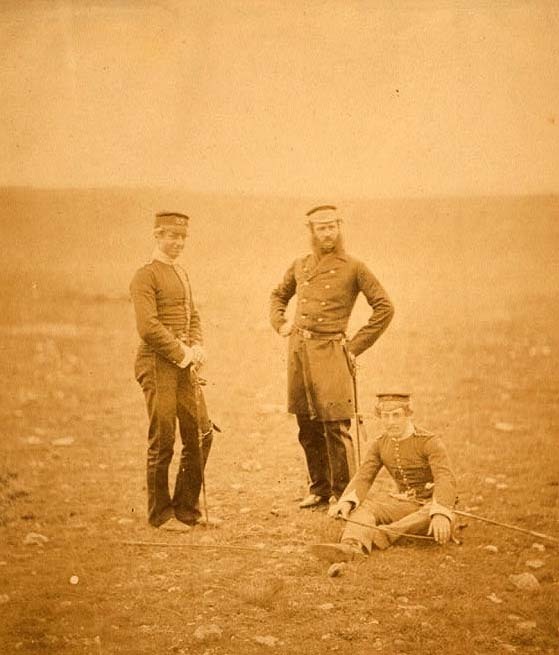 Lieutenant Colonel William Munro & officers of the 39th Regiment. 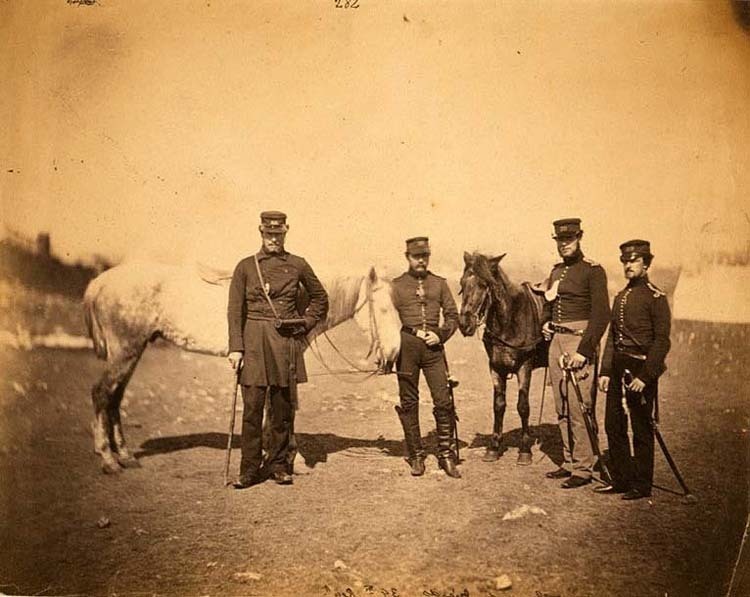 LC-USZC4-9125. 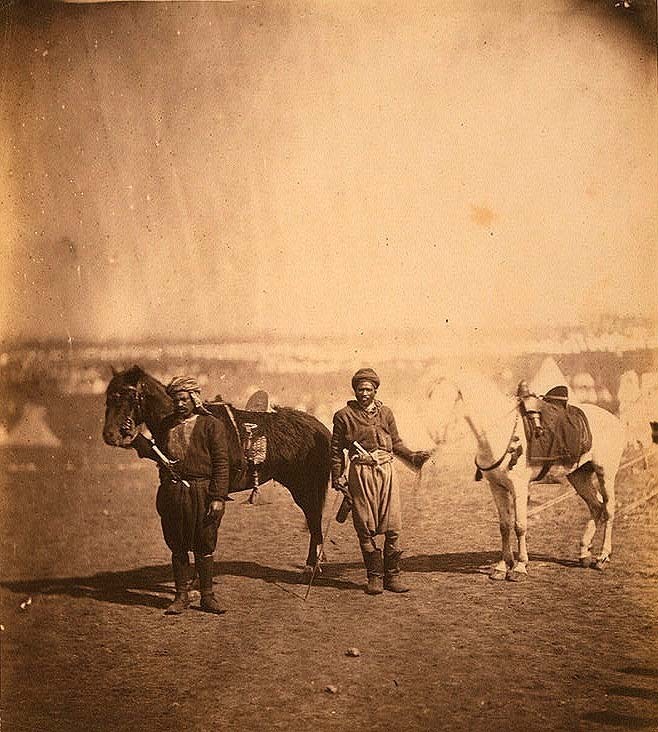 Nubian servants & horses. 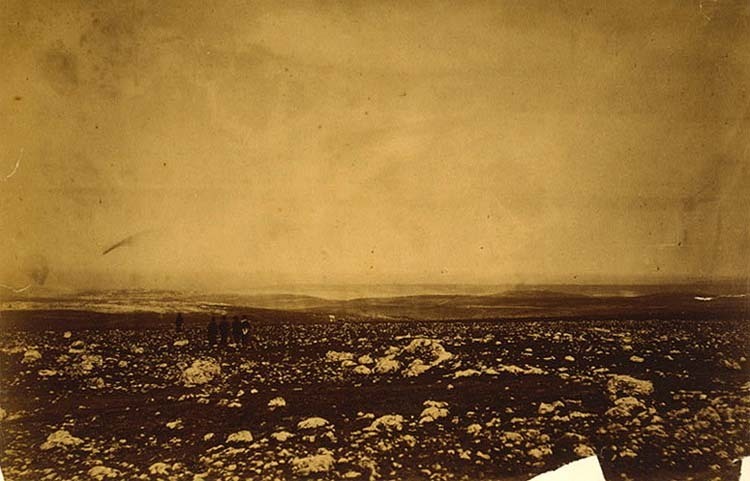 LC-USZC4-9233.